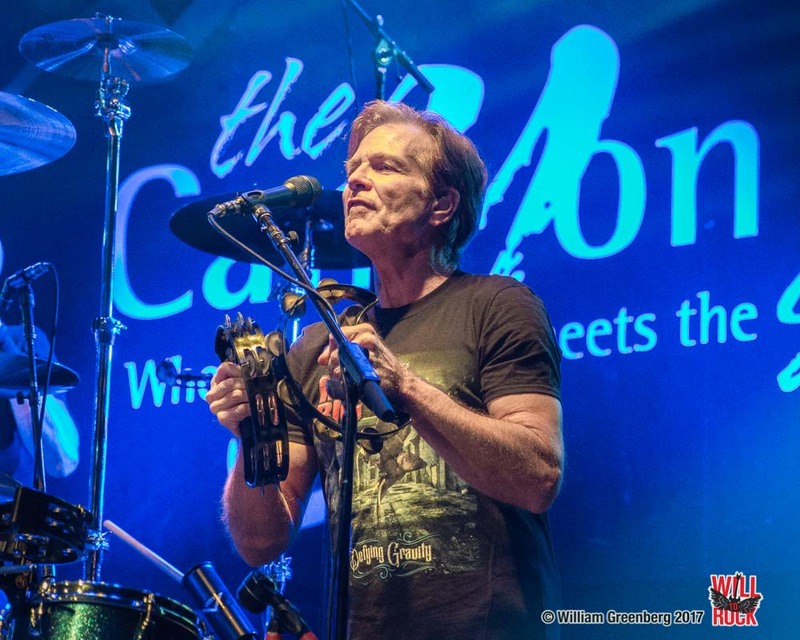 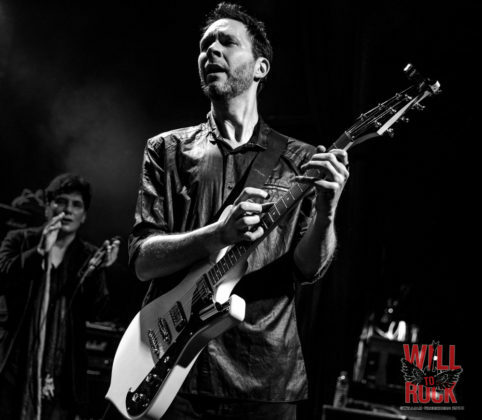 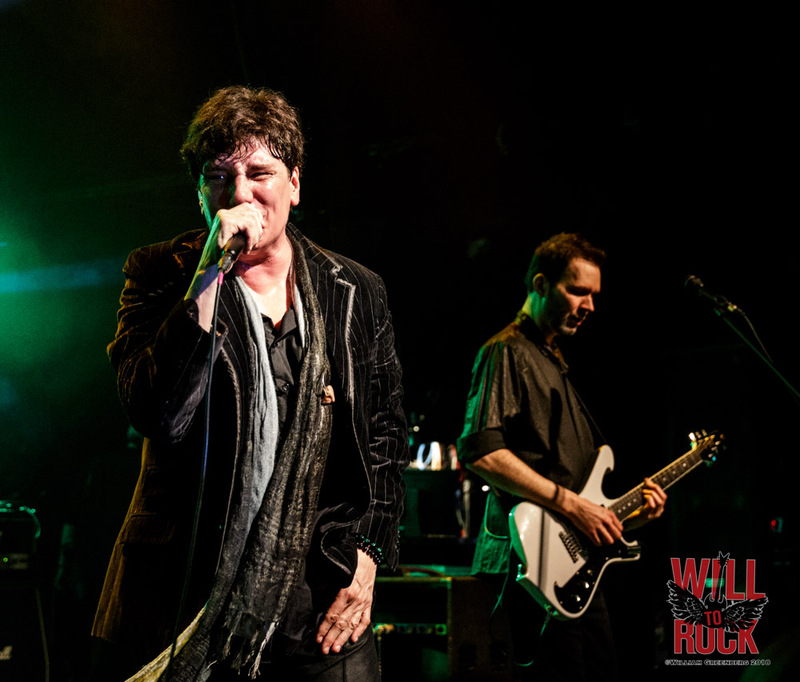 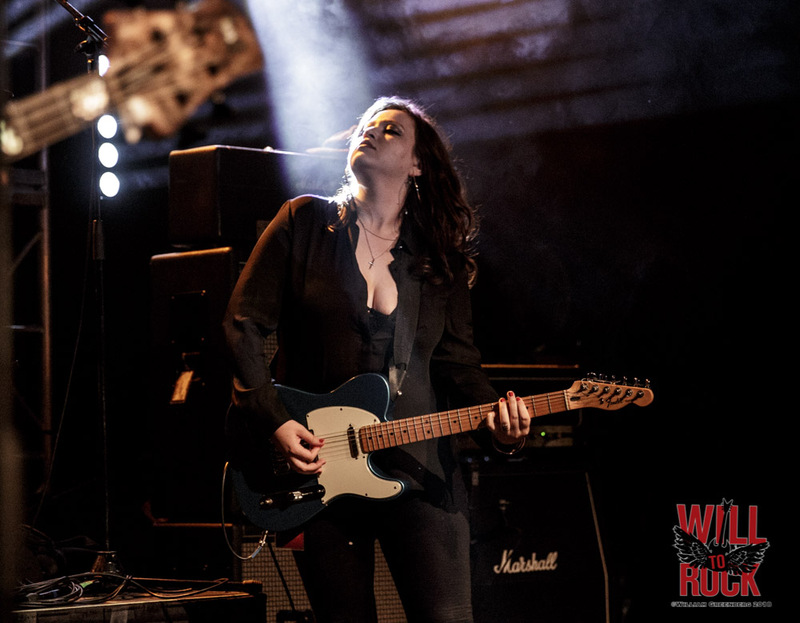 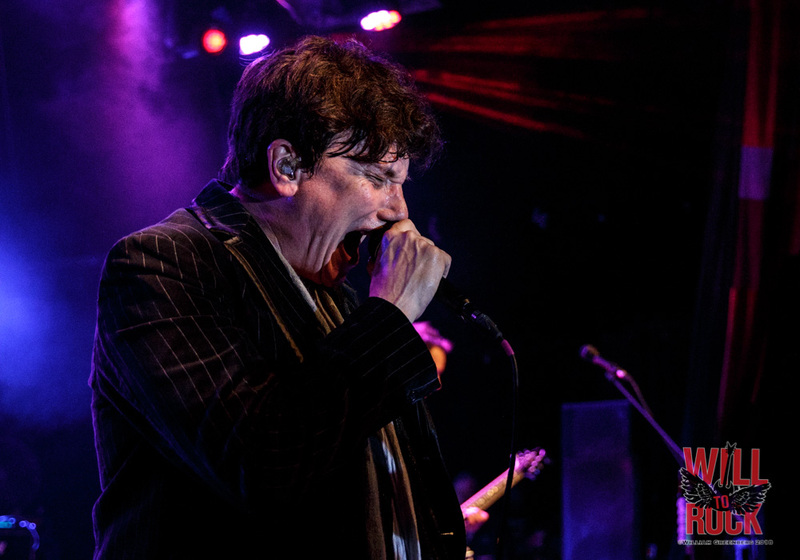 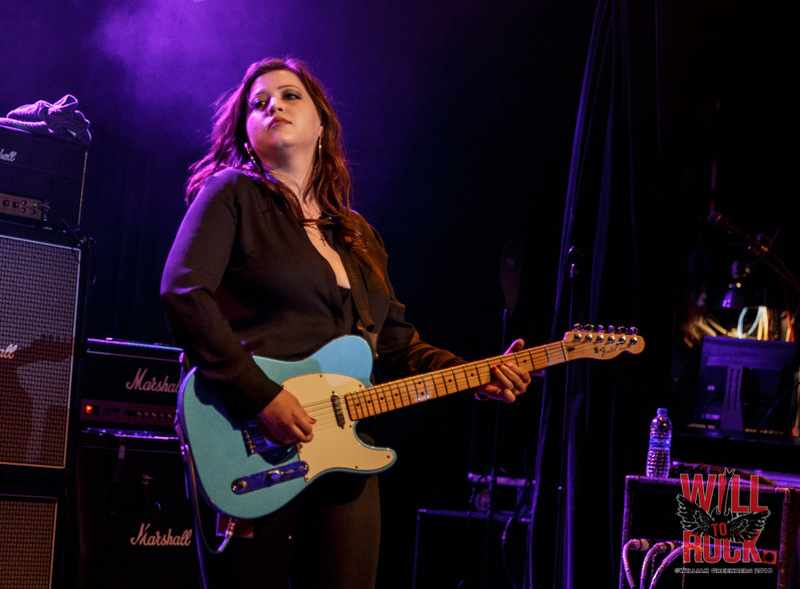 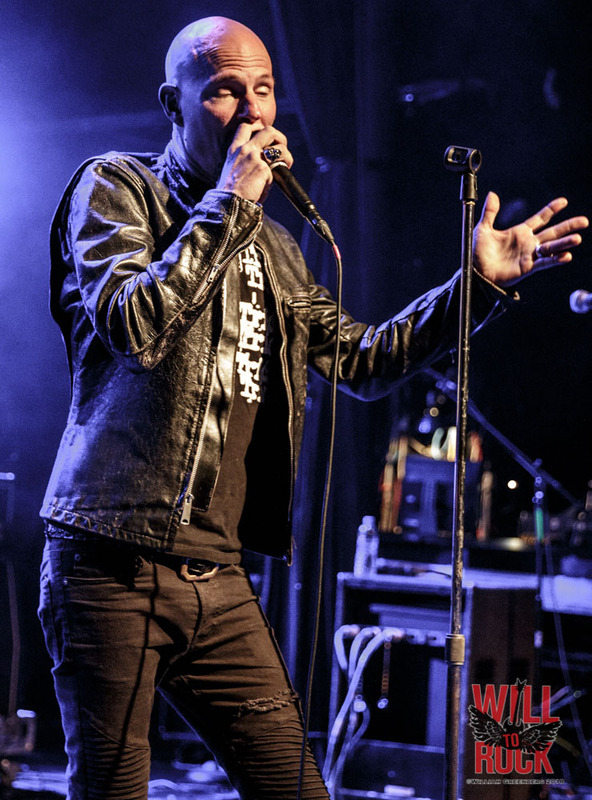 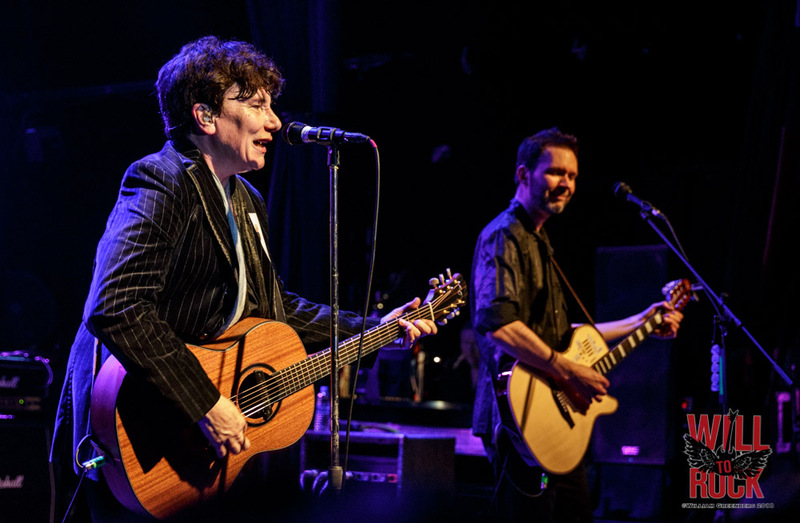 The Canyon Club – Agoura Hills, CA – 5/23/18. 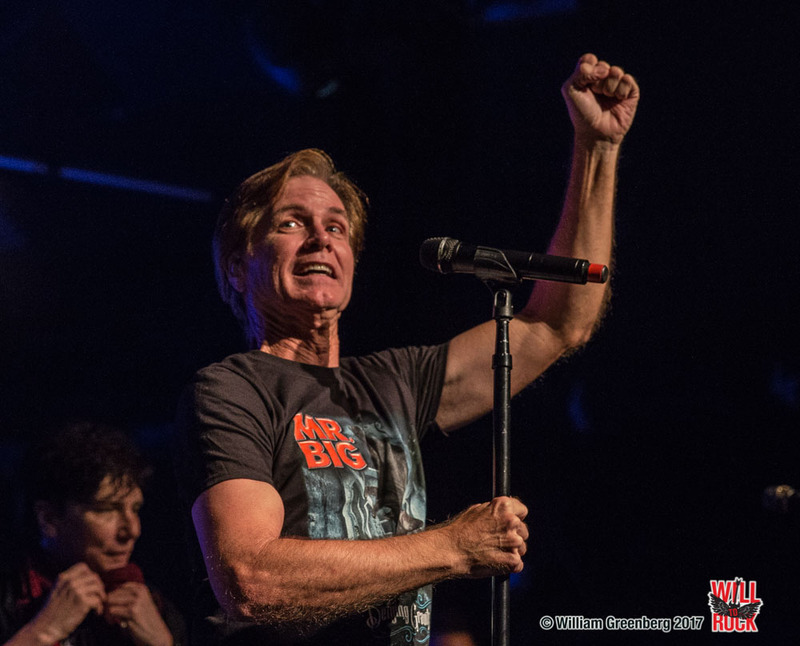 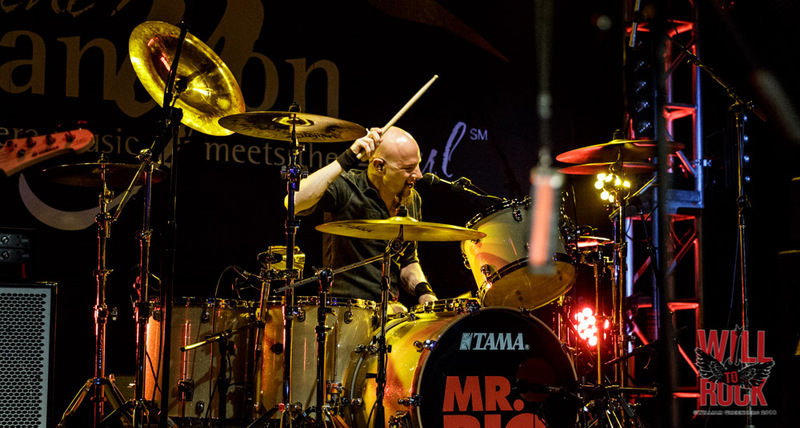 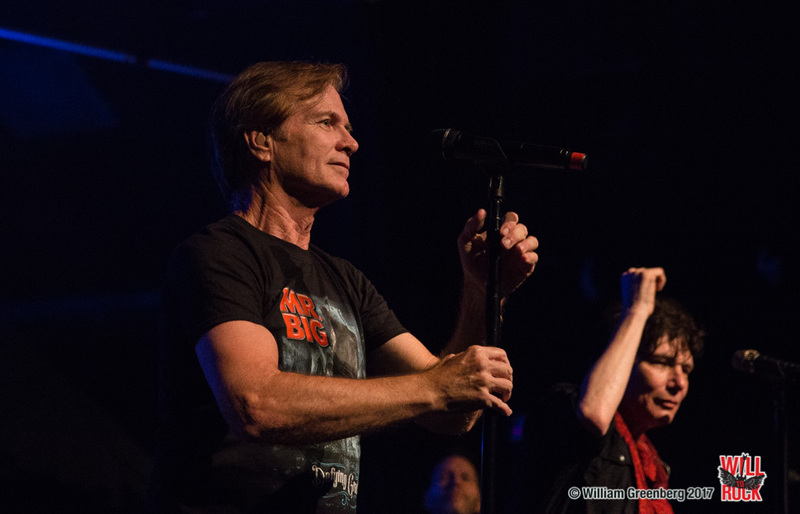 It’s been a few months (Feb. 2018) since Mr. Big’s drummer and founding member, Pat Torpey, passed away due to complications from Parkinsons Disease. 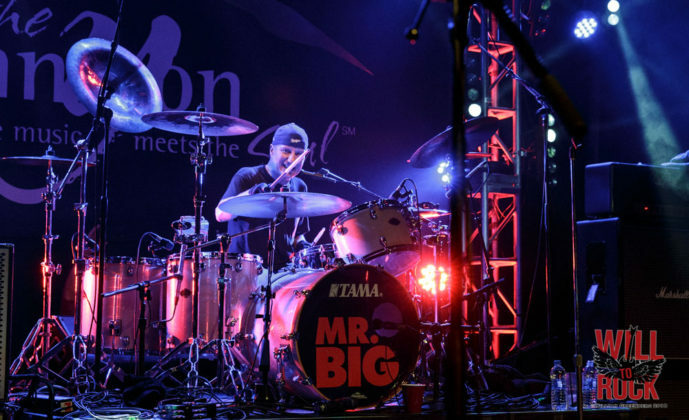 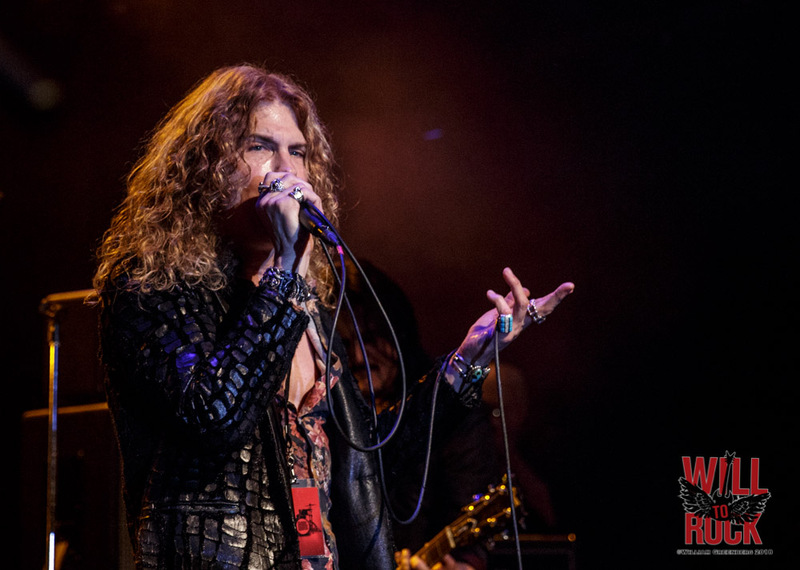 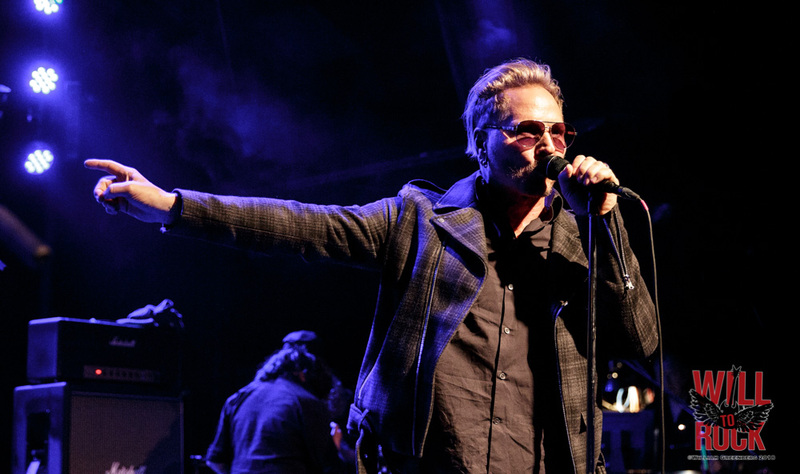 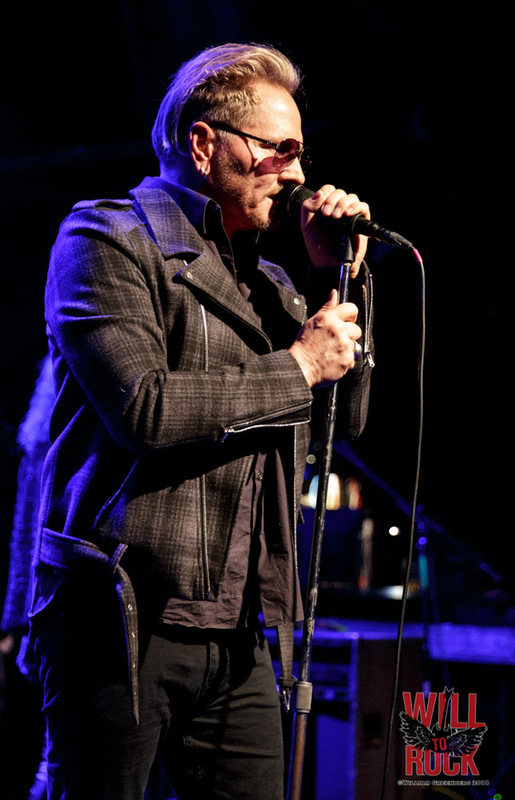 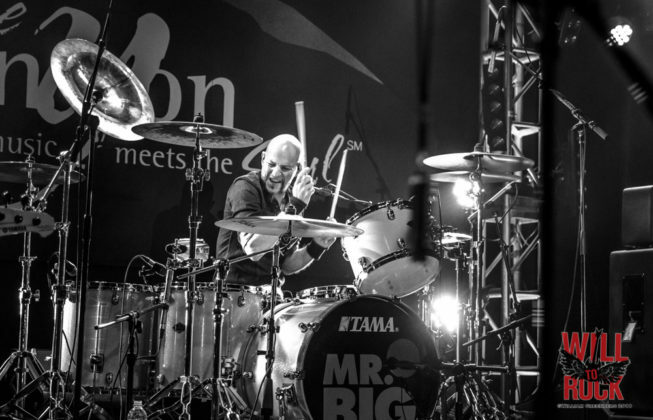 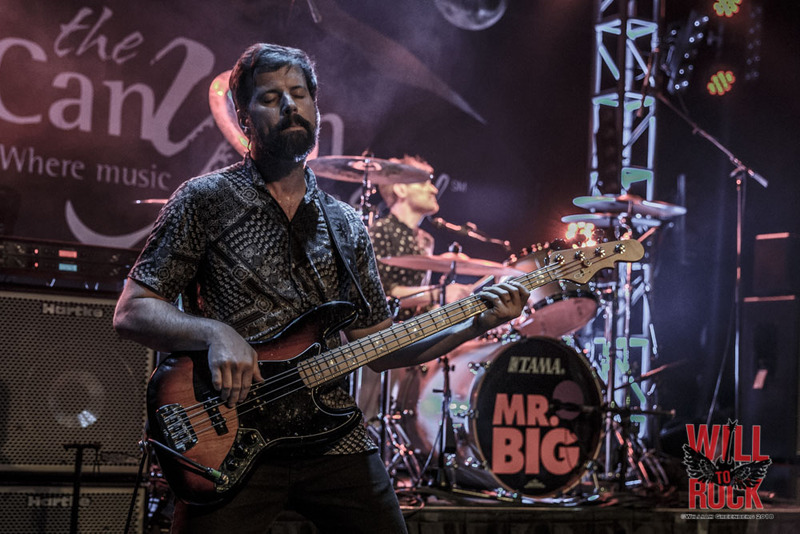 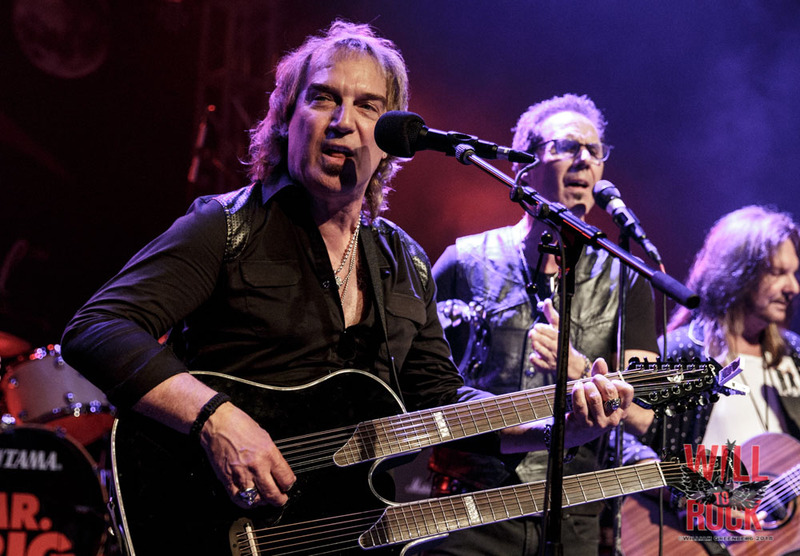 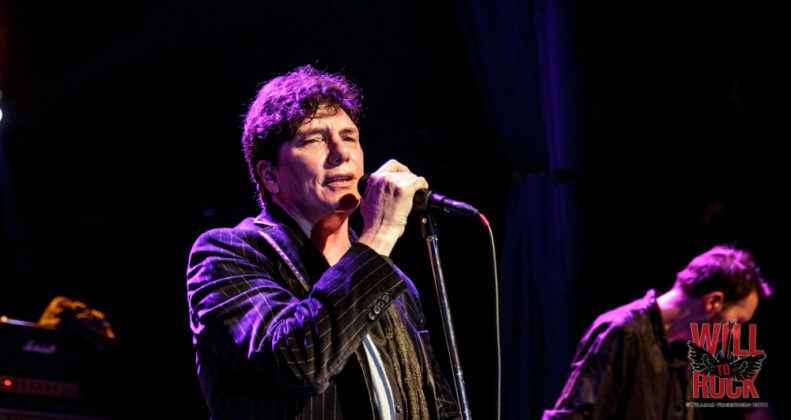 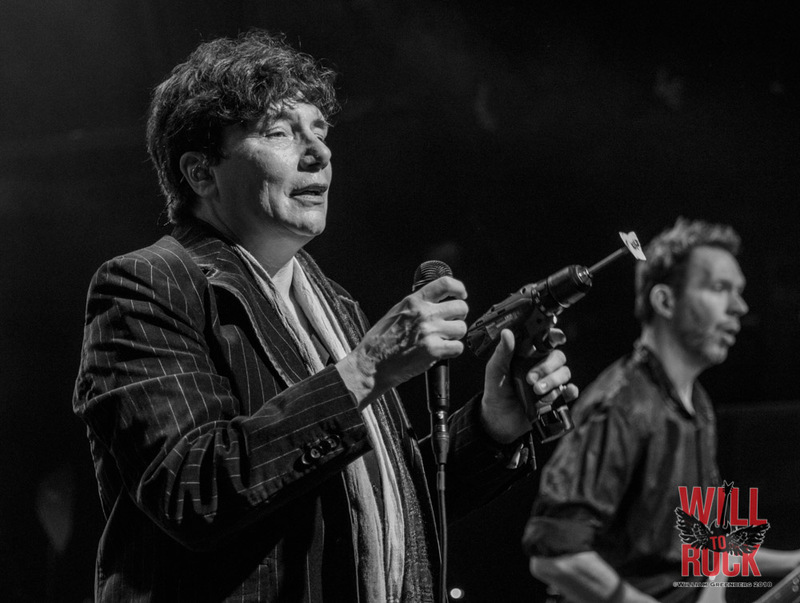 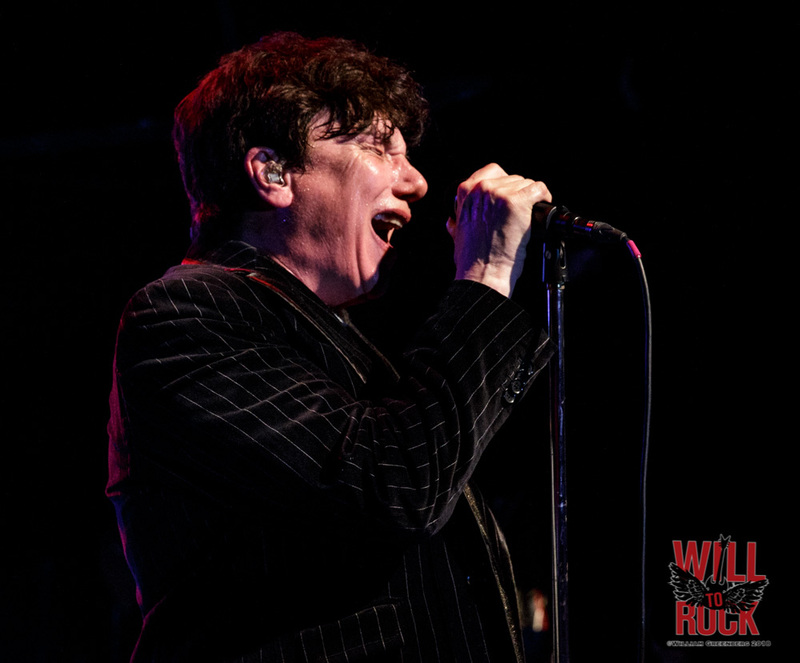 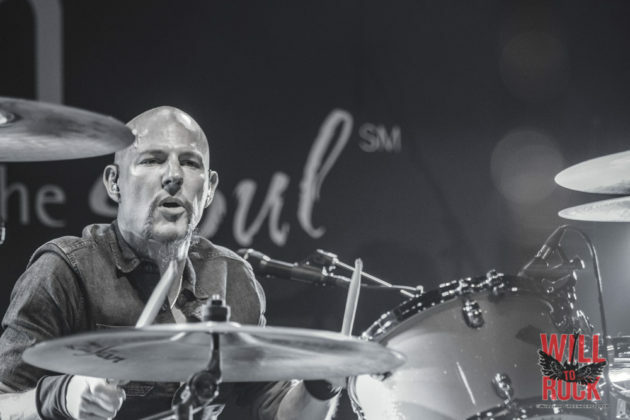 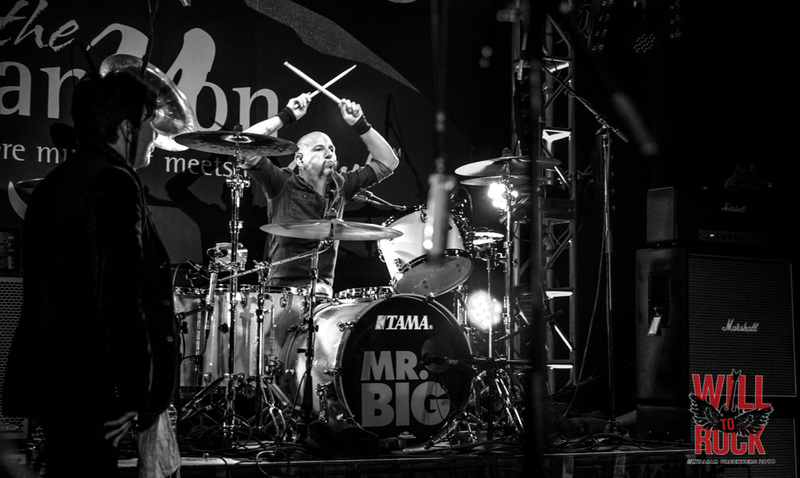 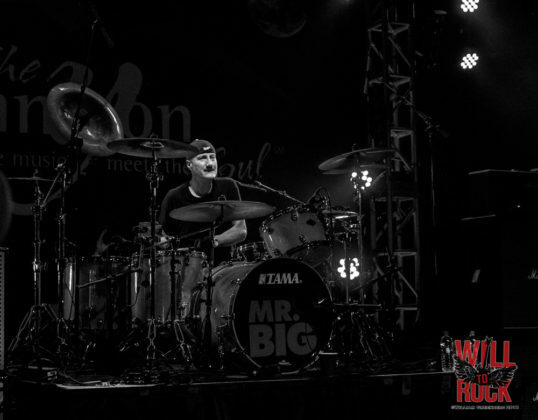 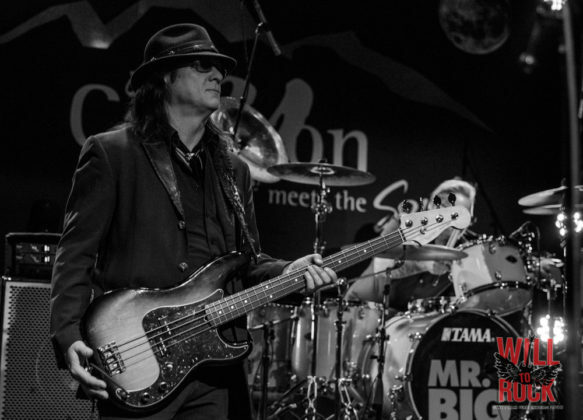 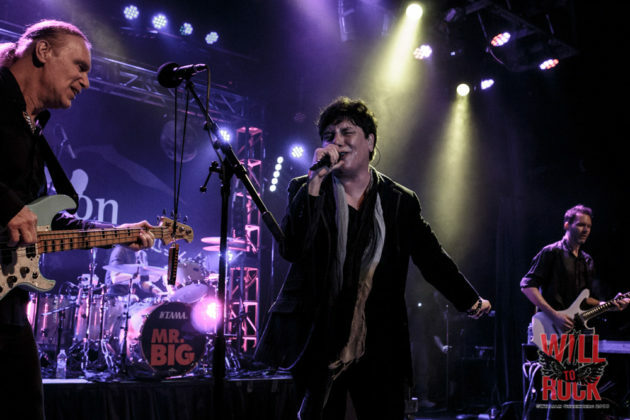 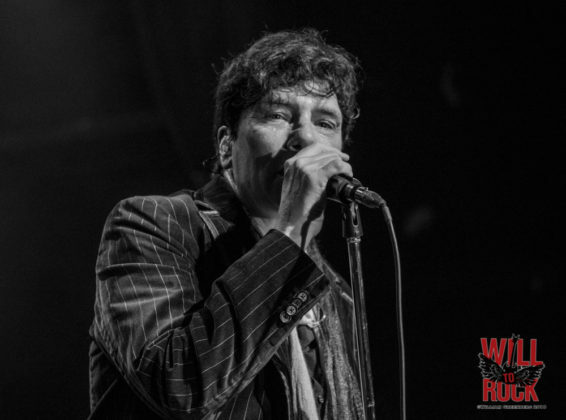 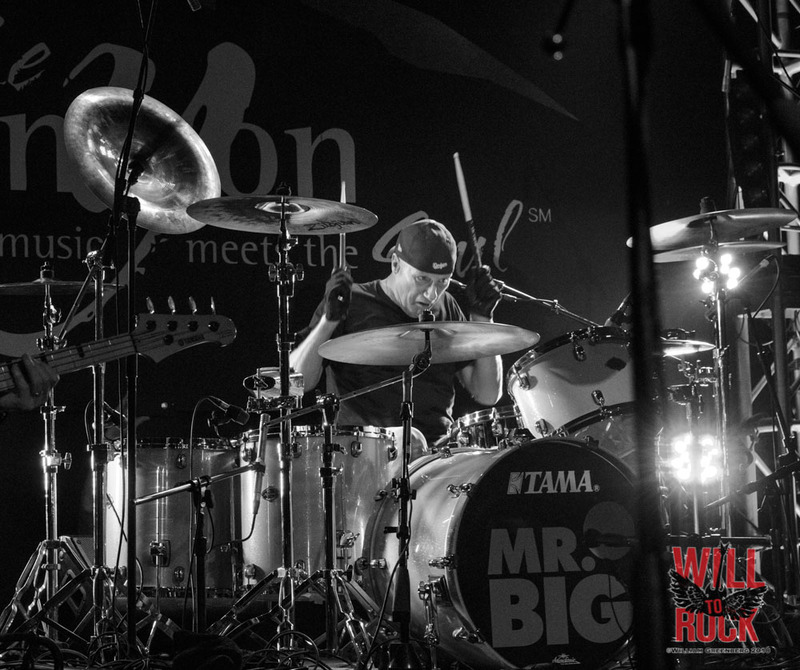 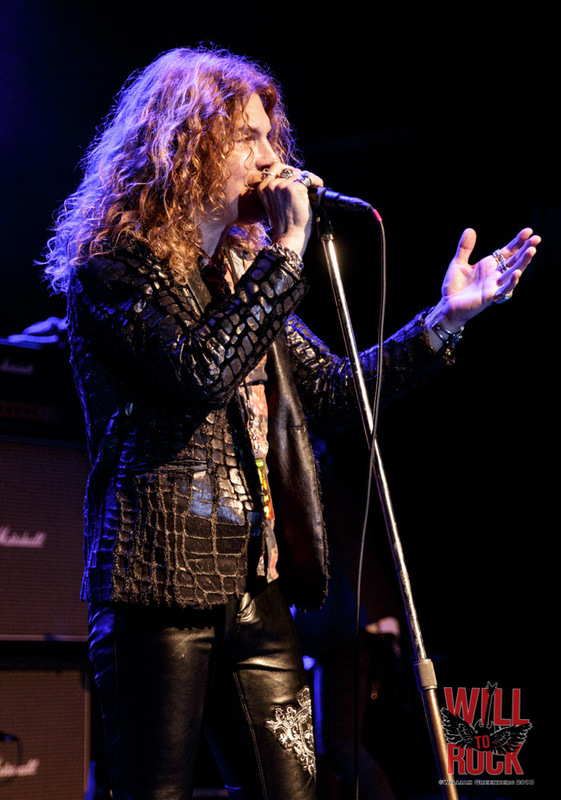 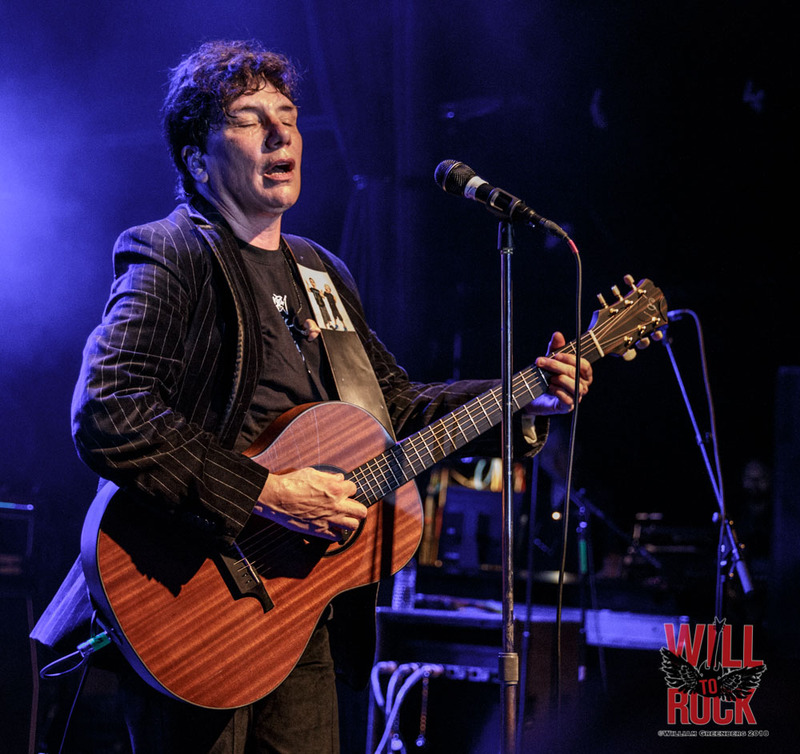 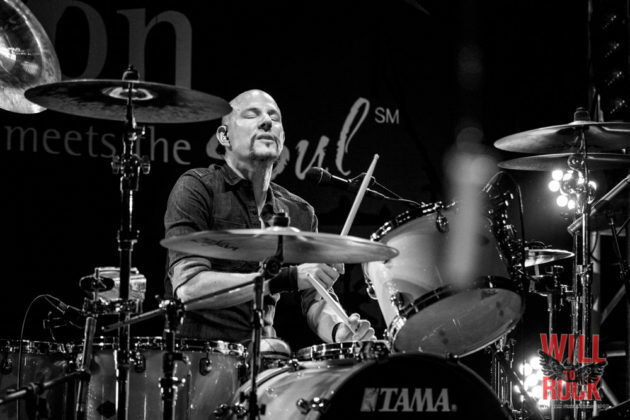 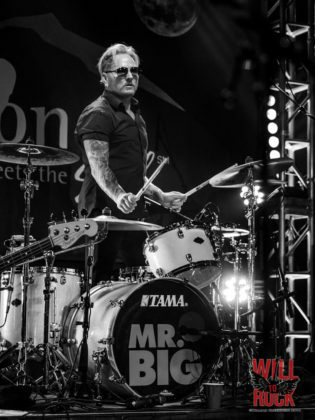 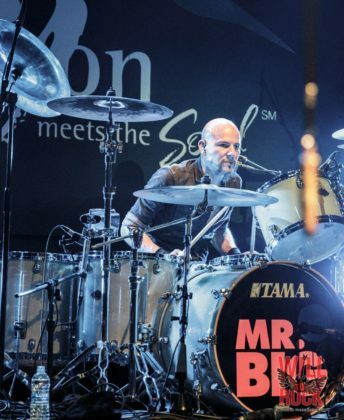 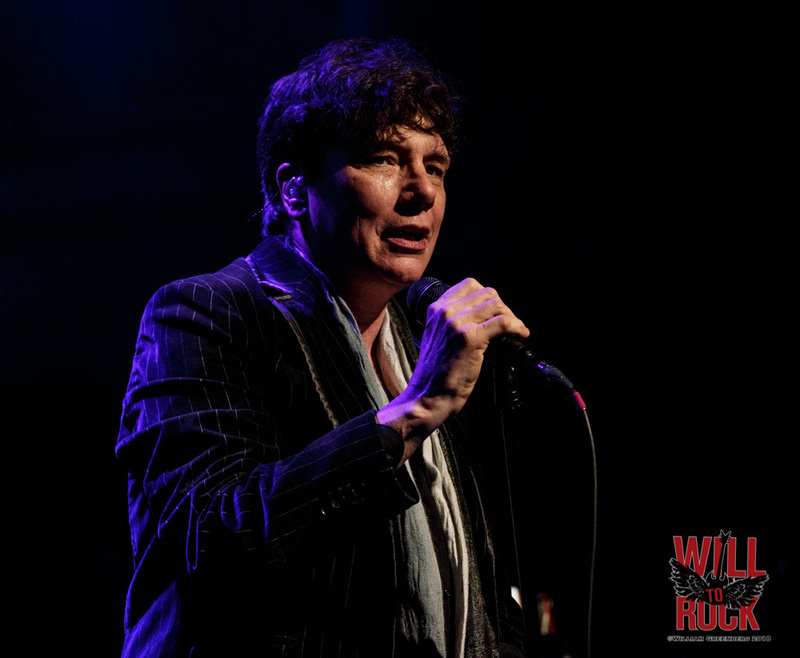 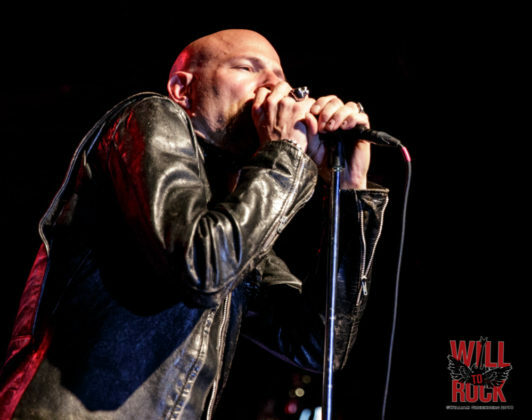 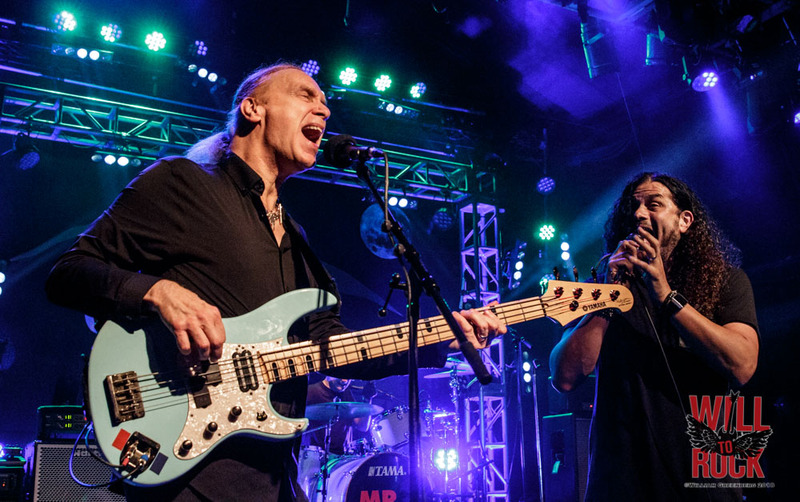 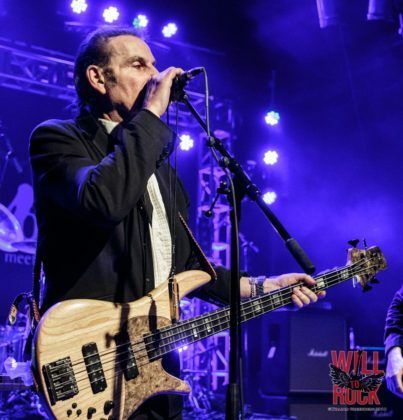 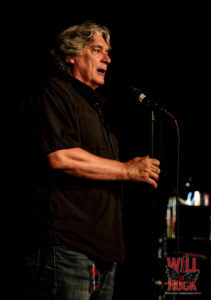 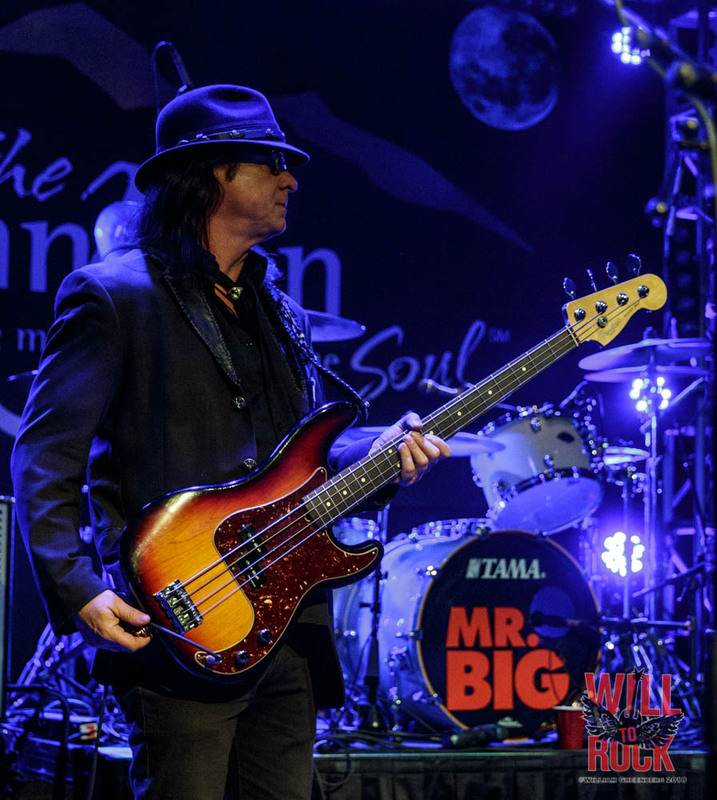 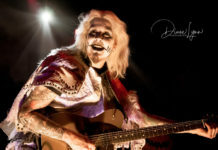 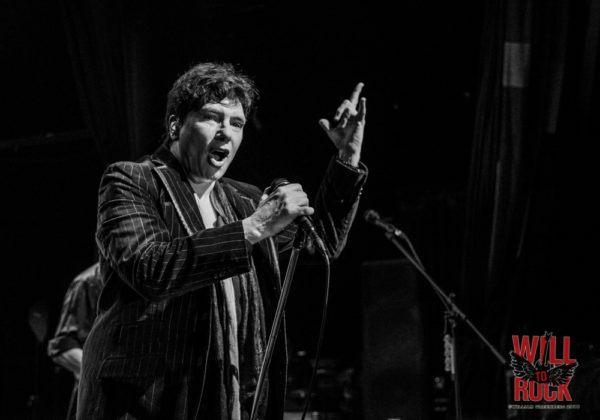 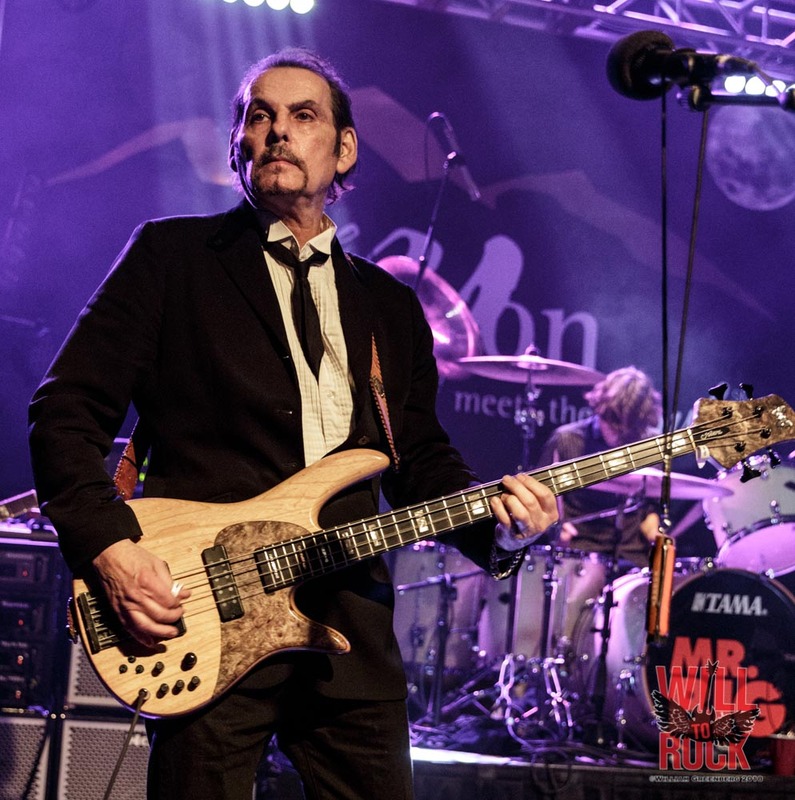 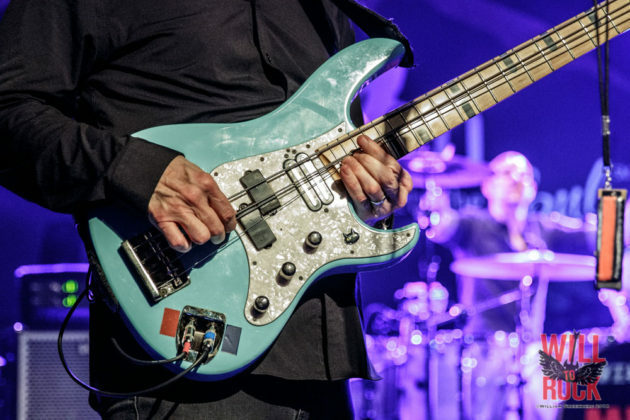 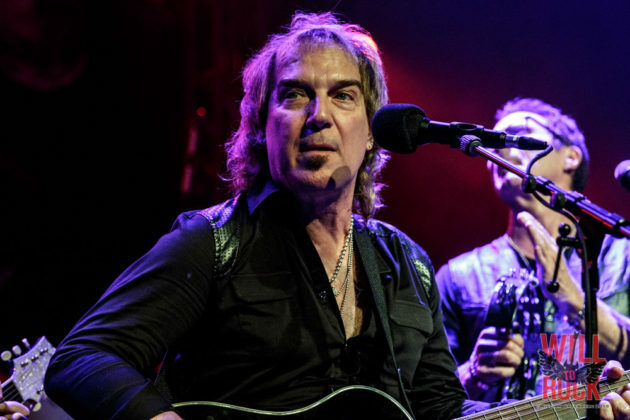 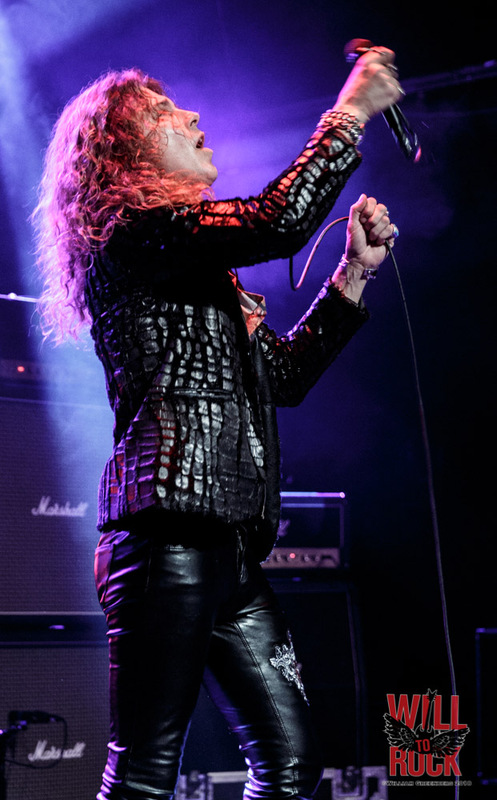 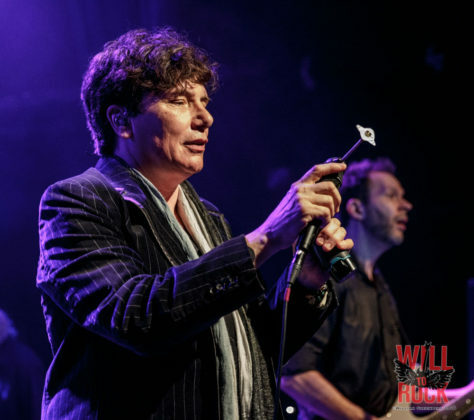 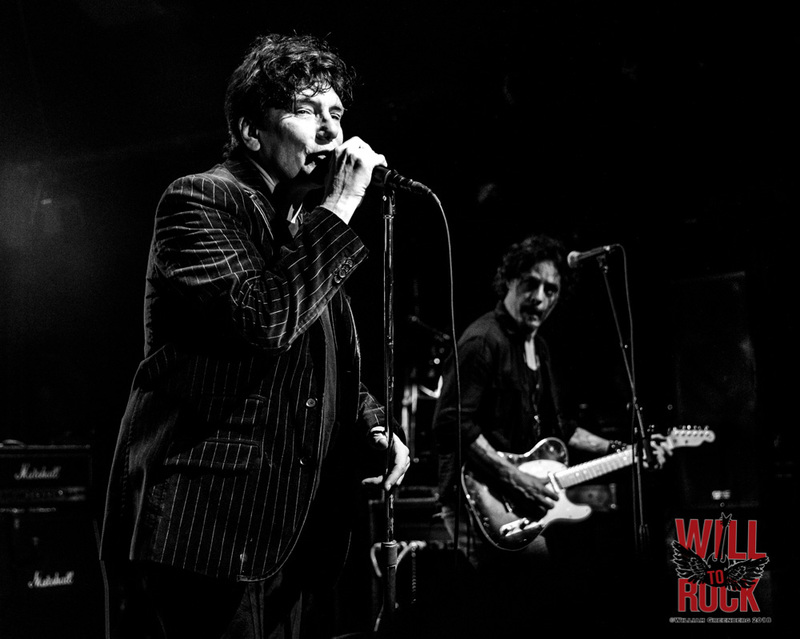 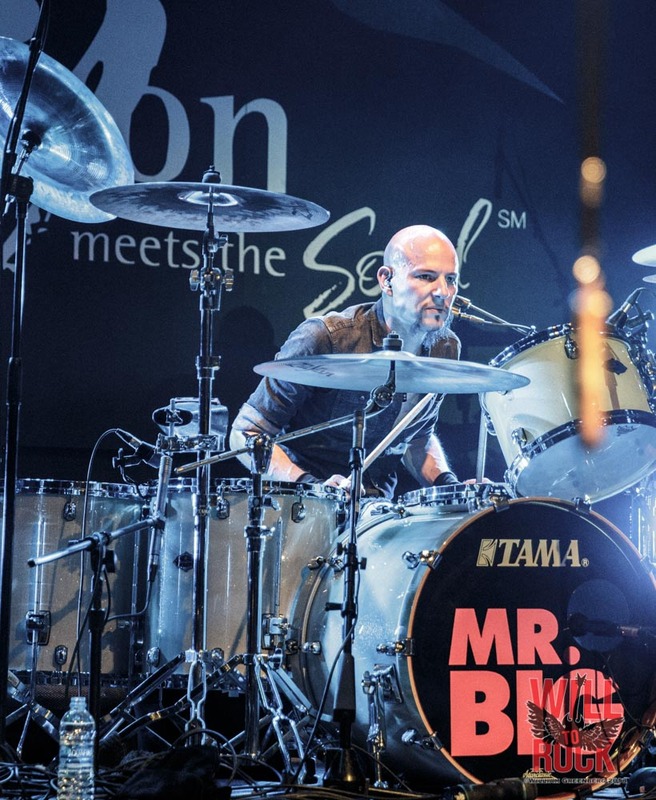 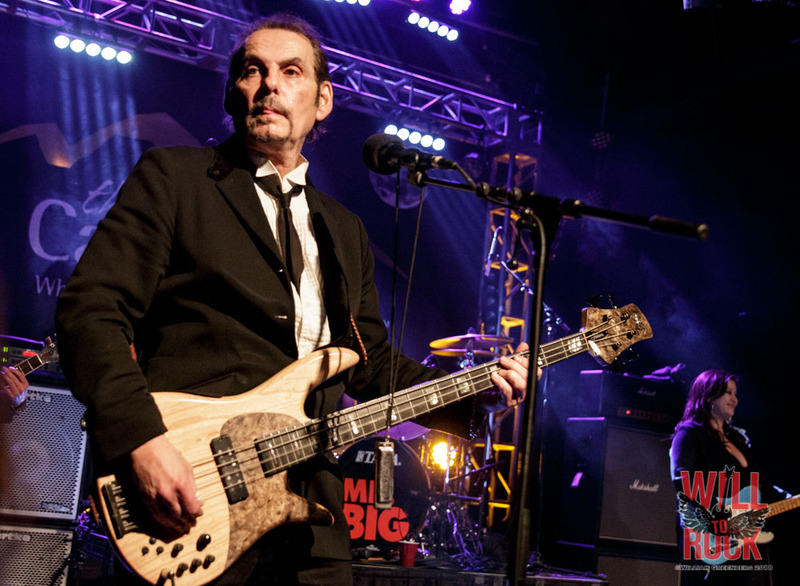 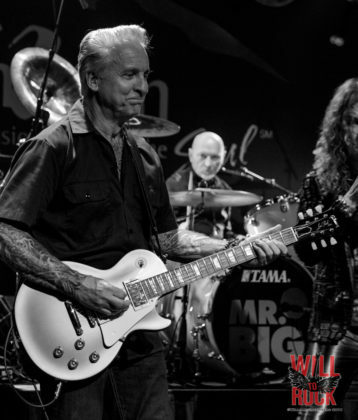 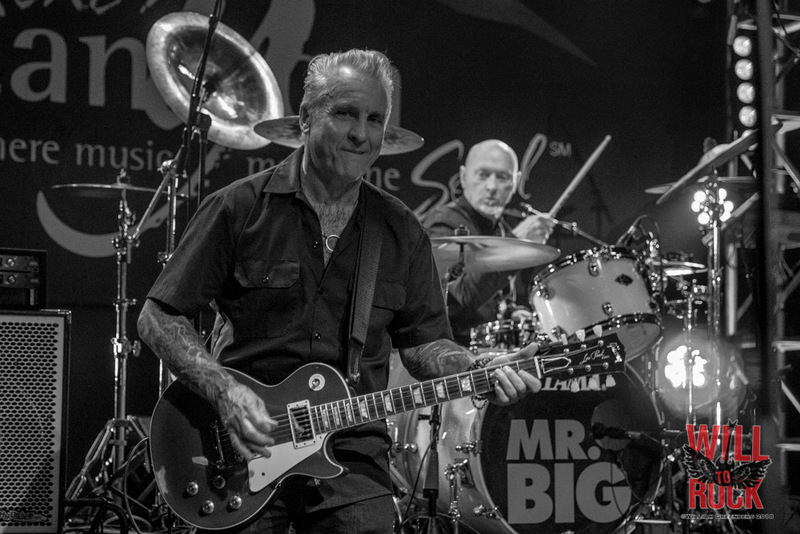 The last few years he would share the stage with the band in a limited capacity, adding some percussion and vocals to help create the classic Mr. Big sound. 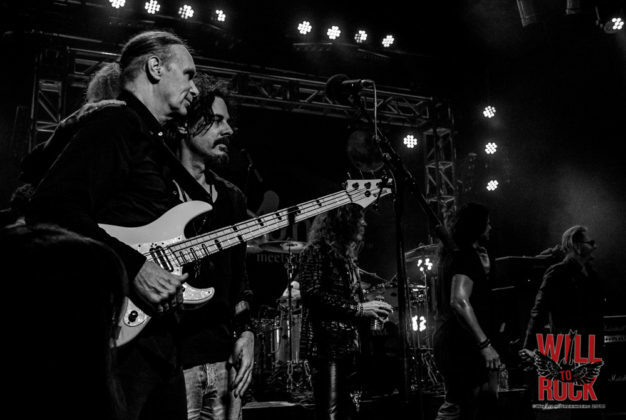 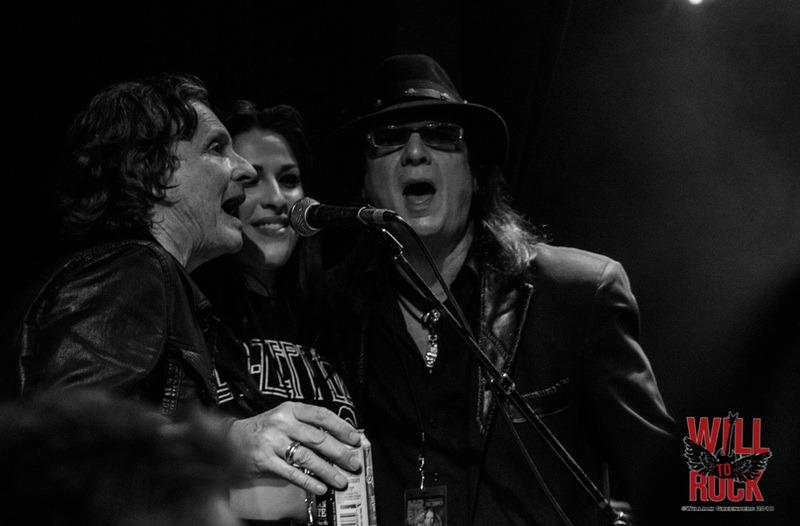 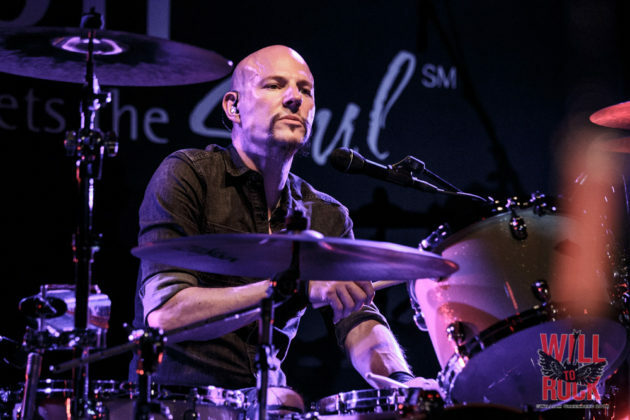 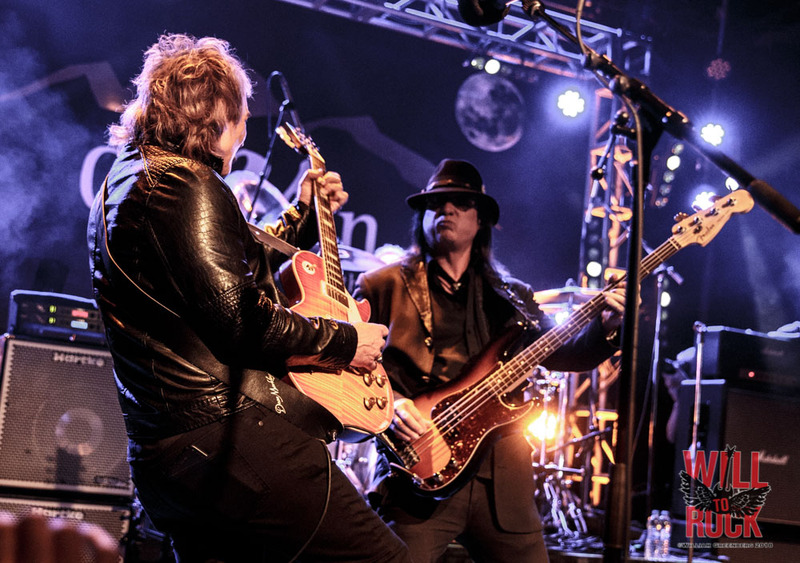 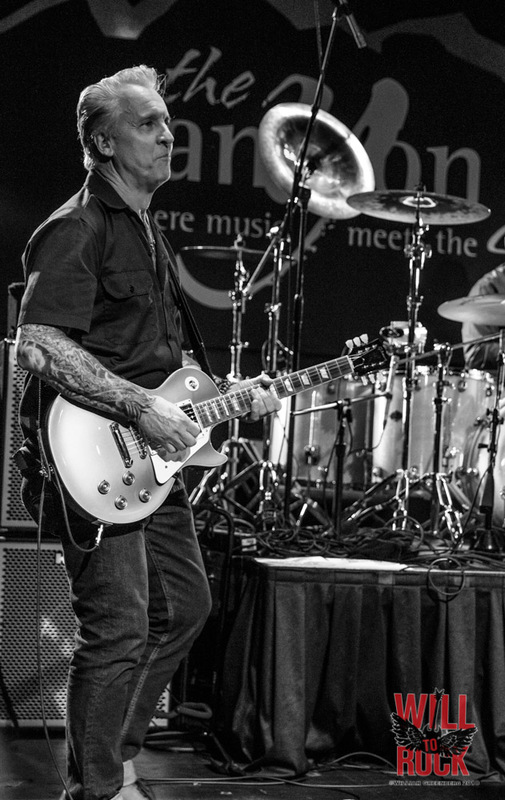 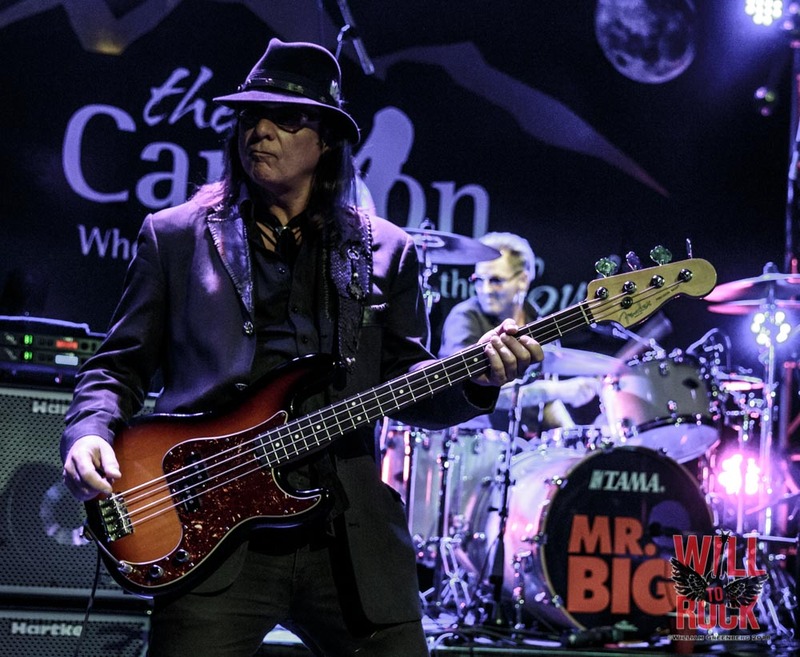 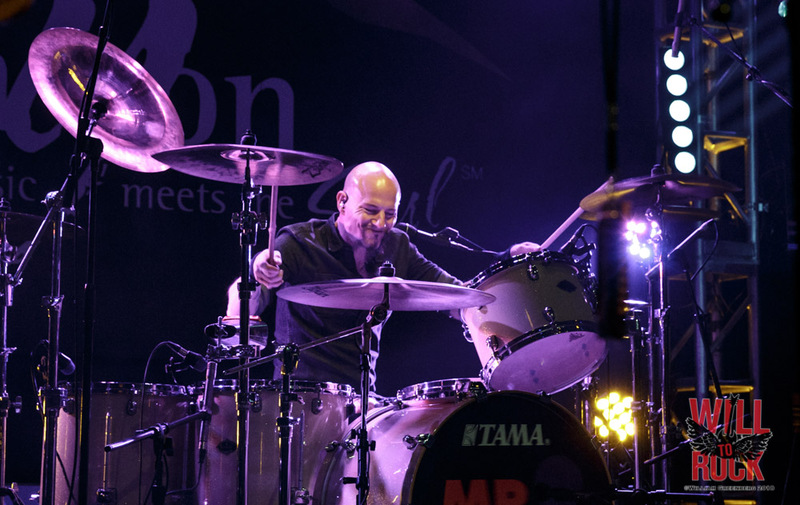 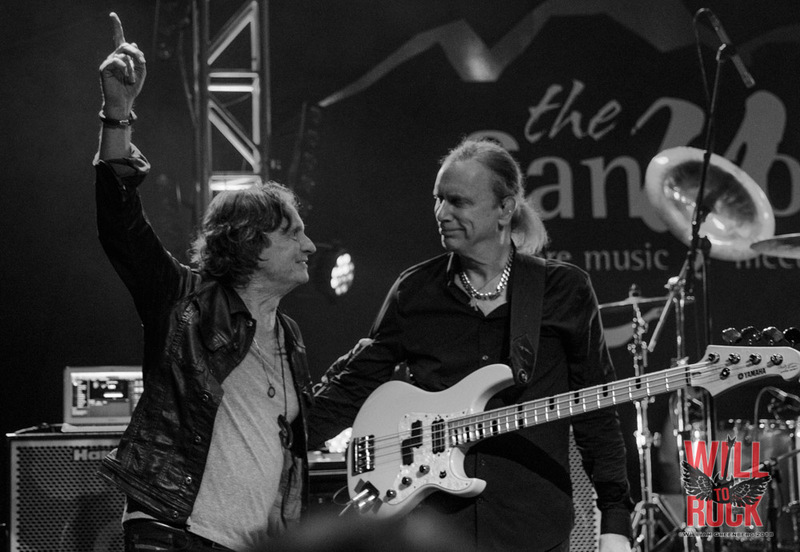 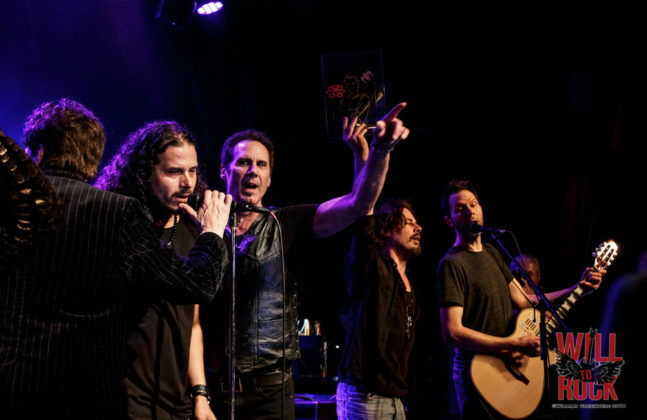 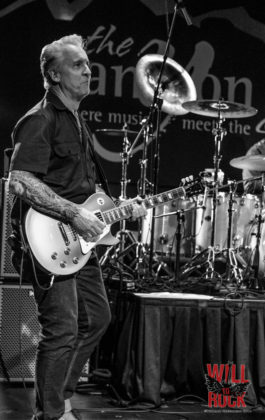 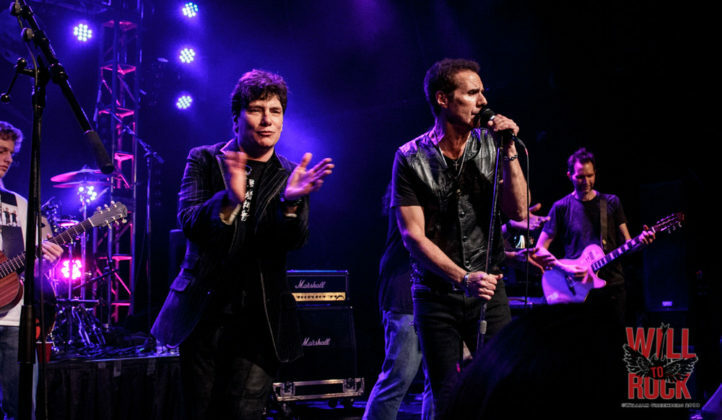 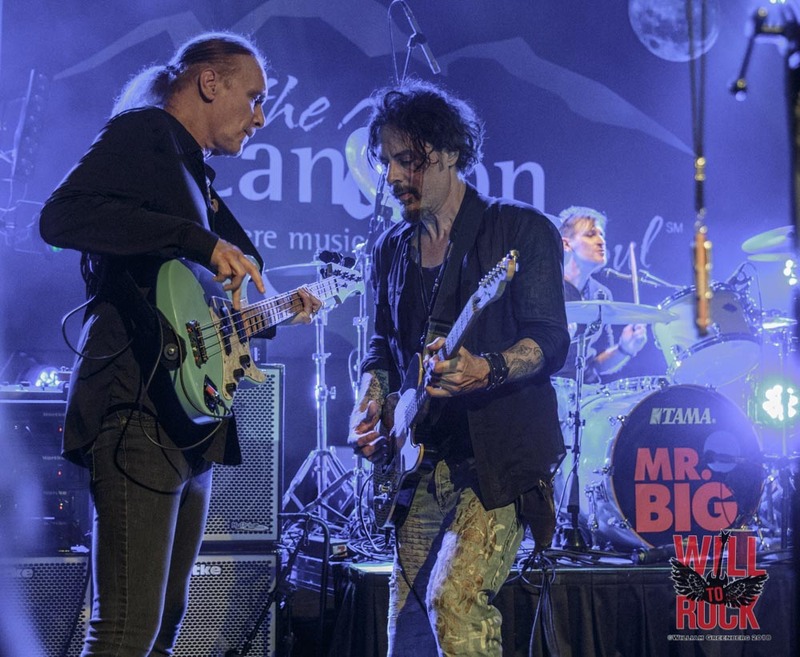 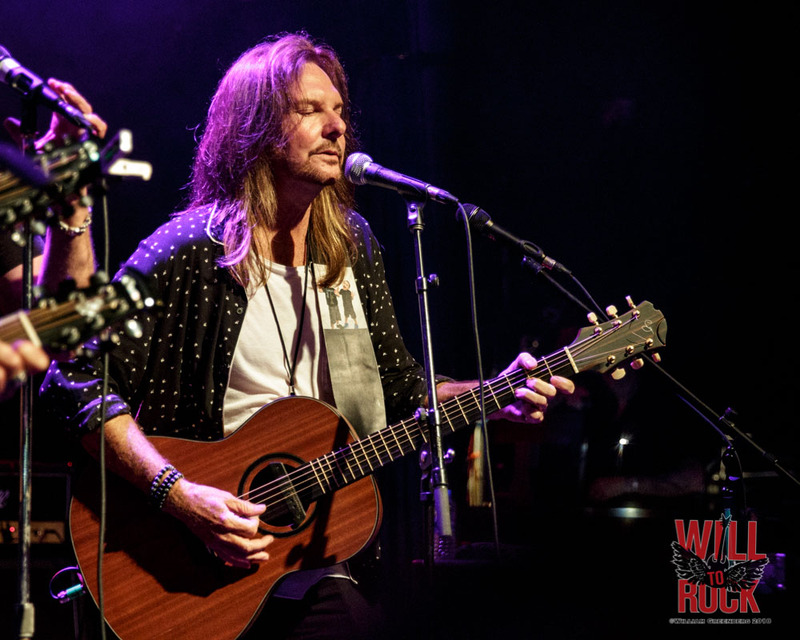 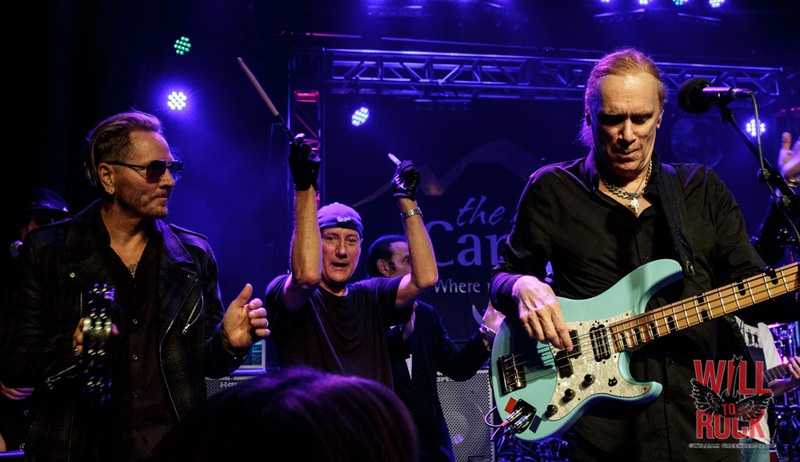 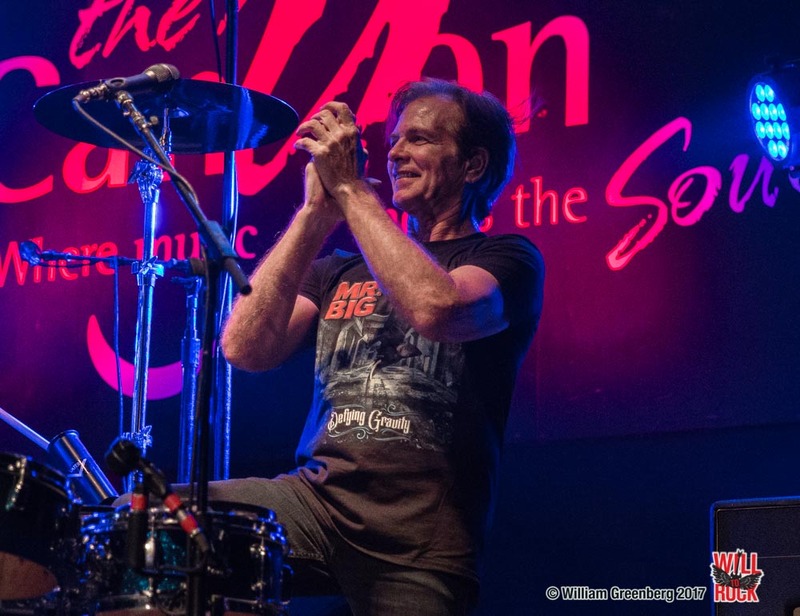 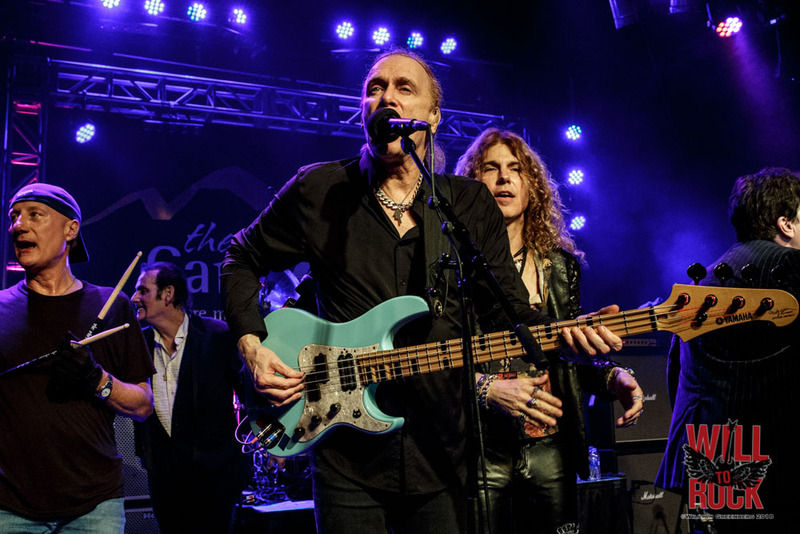 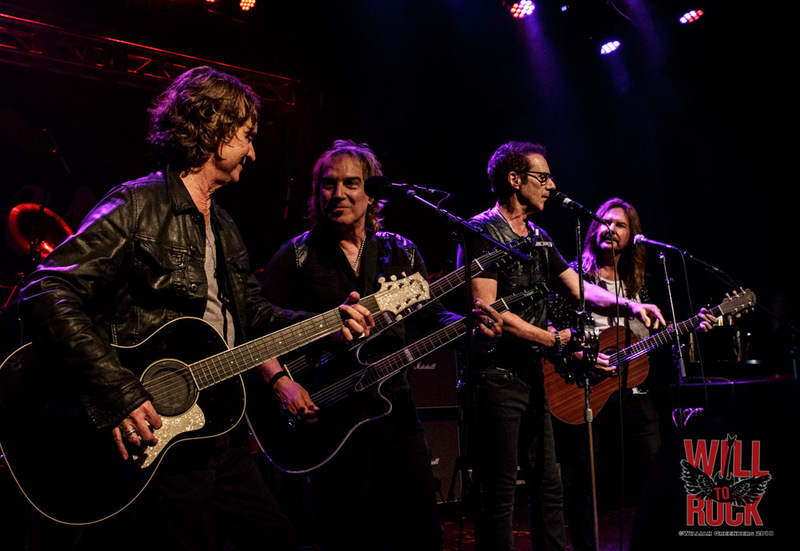 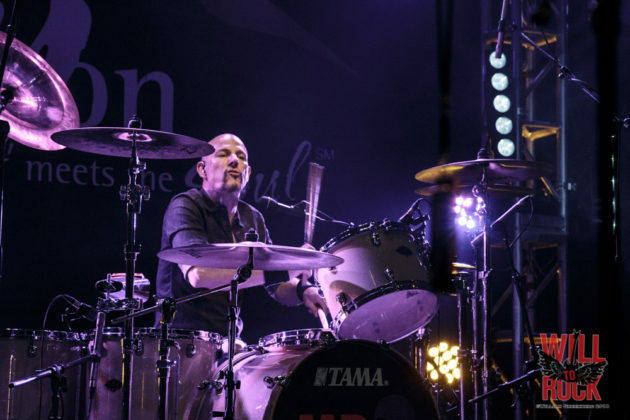 On Wednesday, May 23rd, Mr. Big, Richie Kotzen and great number of Pat Torpey’s friends brought a lot of love to the Canyon Club in a wonderful tribute to the late drummer. 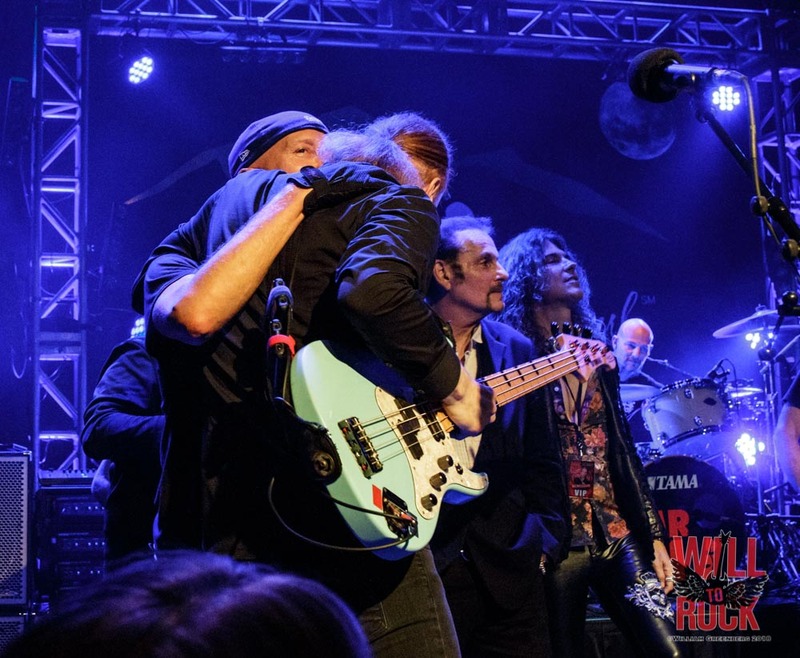 People traveled from all over the world to Agoura Hills to pay their respects and share their stories of meeting or seeing Pat through the years. 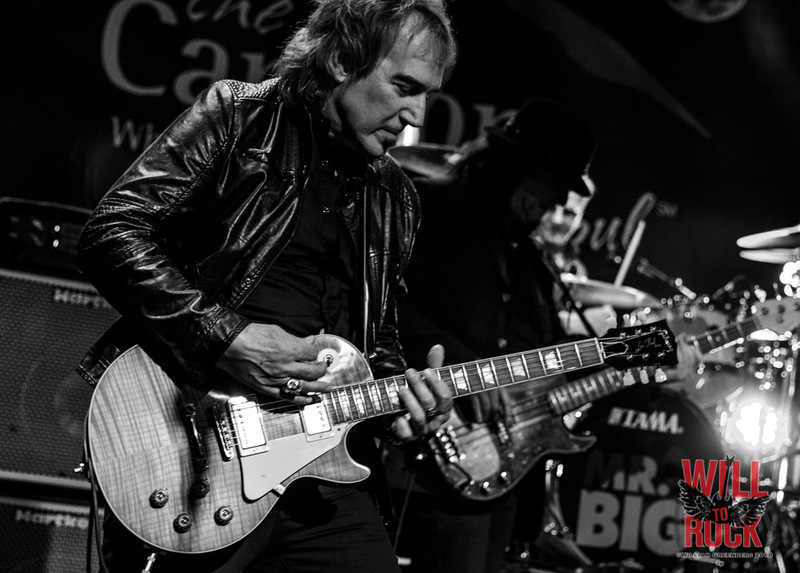 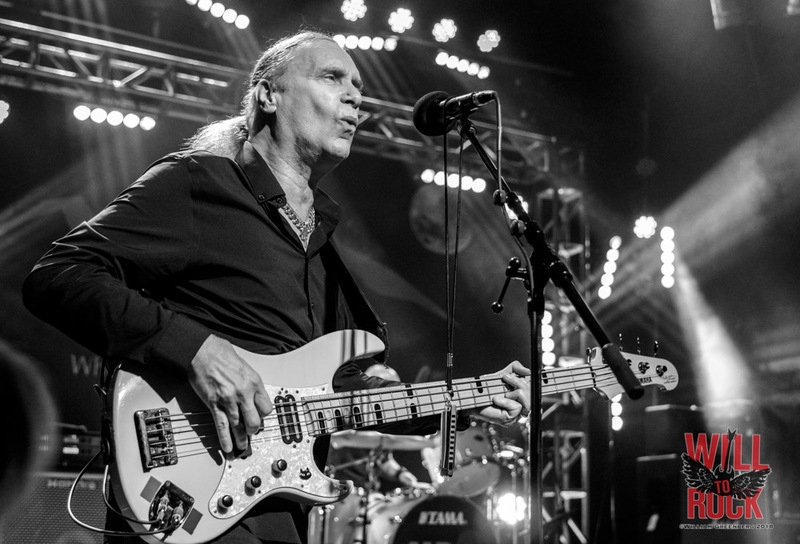 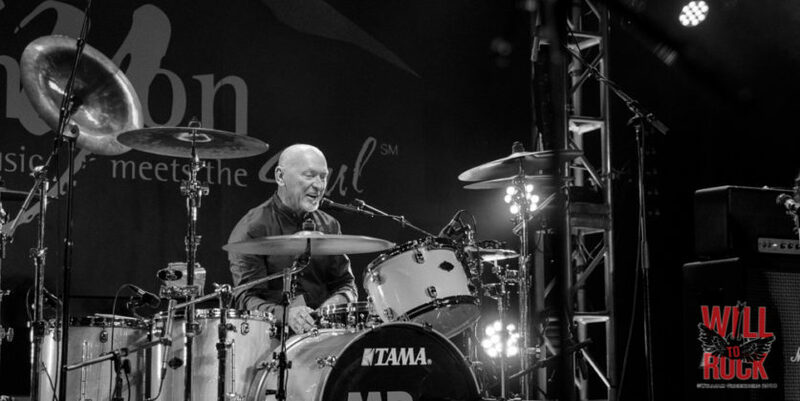 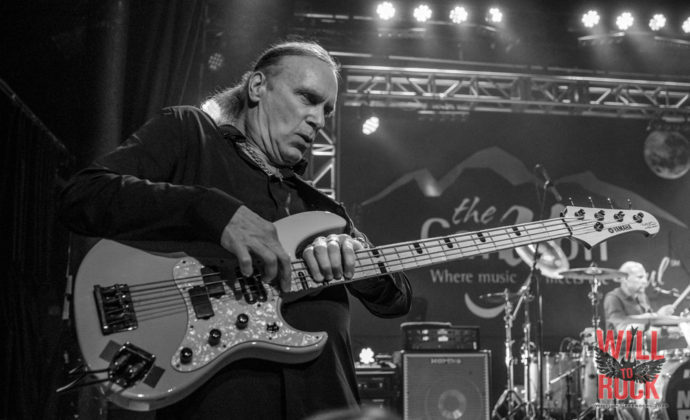 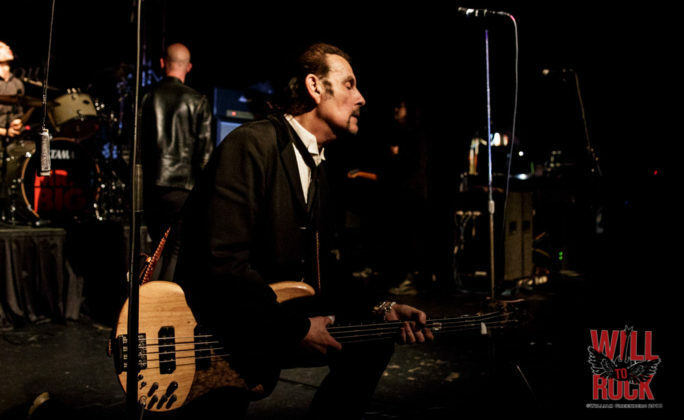 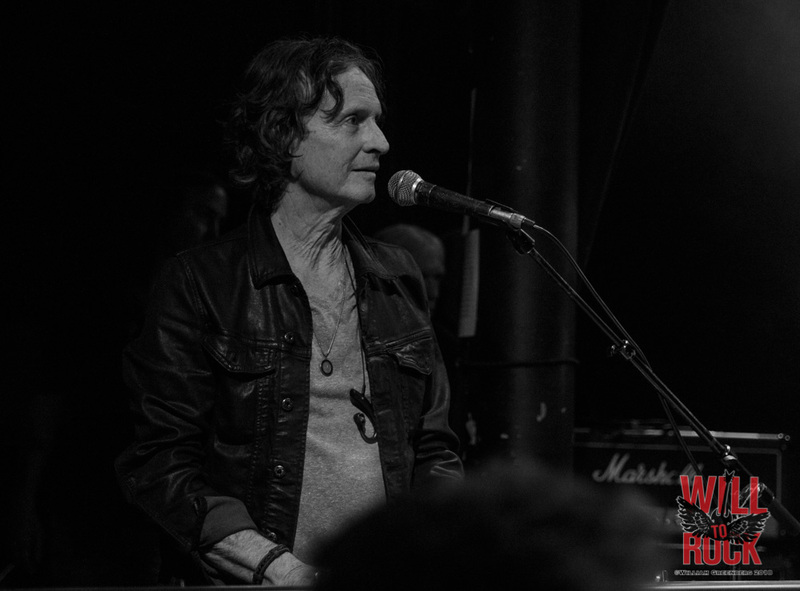 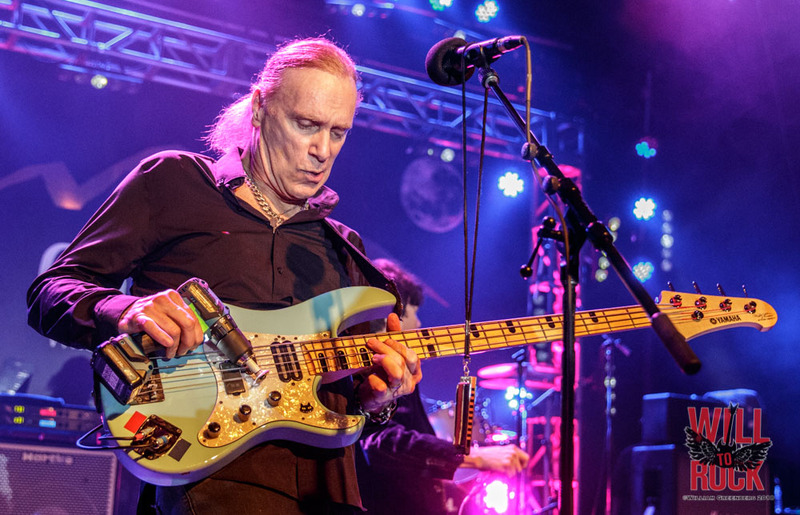 Being a part of the music industry for over 30+ years and playing and recording with the likes of Robert Plant, Tina Turner, Belinda Carlisle, The Knack and appearing on shows such as American Bandstand and Solid Gold allowed Pat’s path to cross a wide variety of people. All who attended shared the same sentiment; that Pat was an incredible drummer, and an even better person. 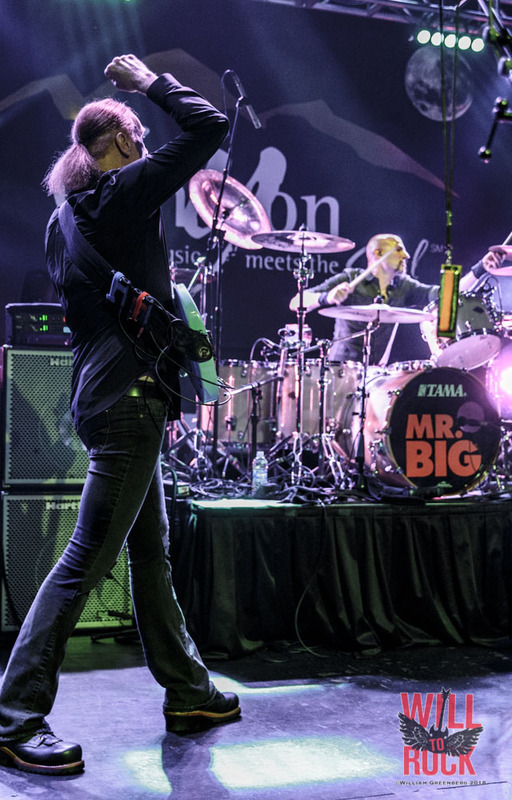 Before any band hit the stage, a video montage of Pat through the years with Mr. Big played on the large screen to the delight and applause of the packed crowd. 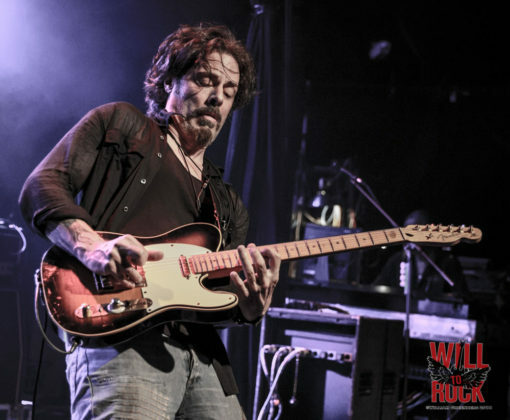 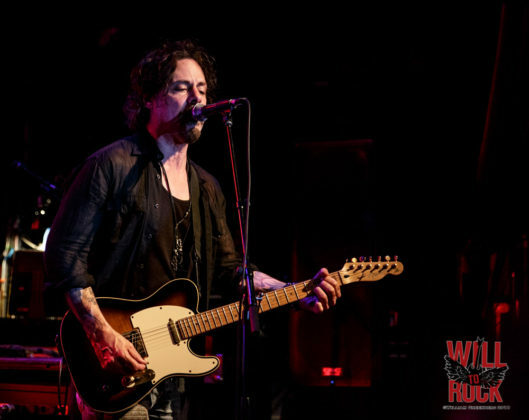 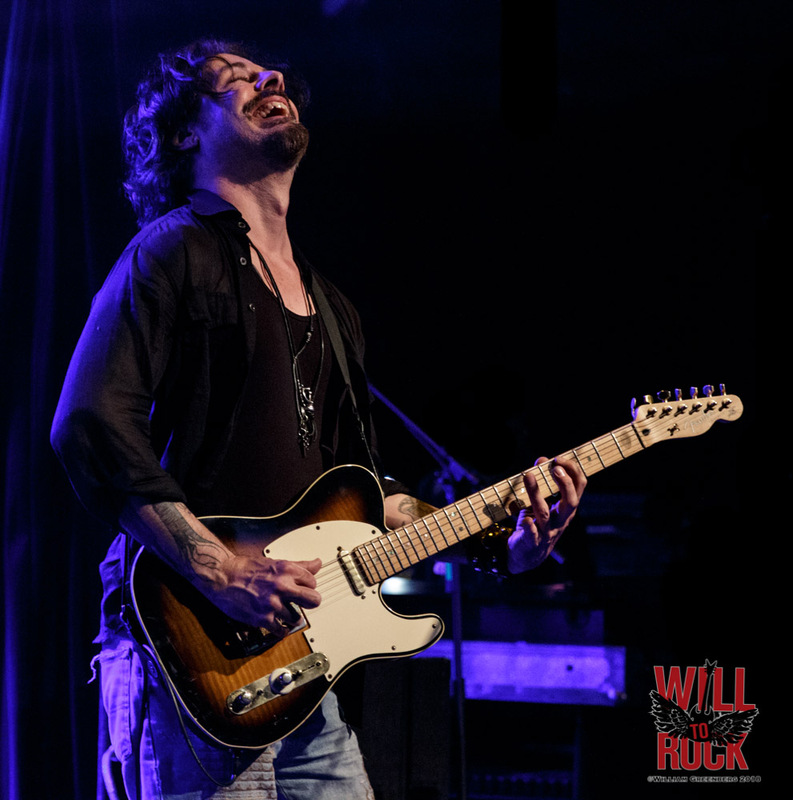 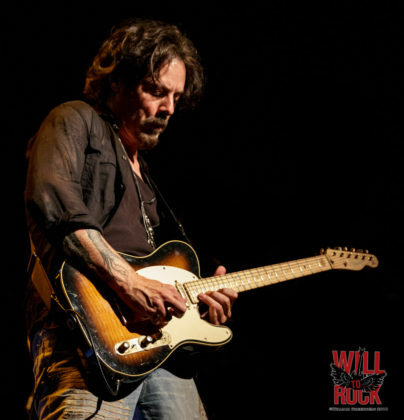 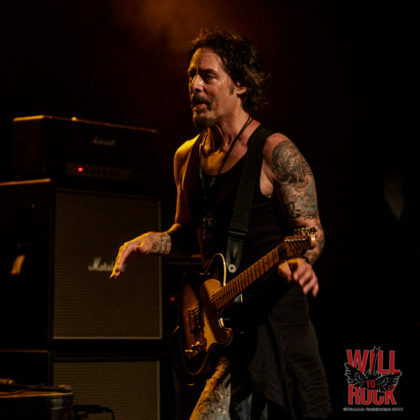 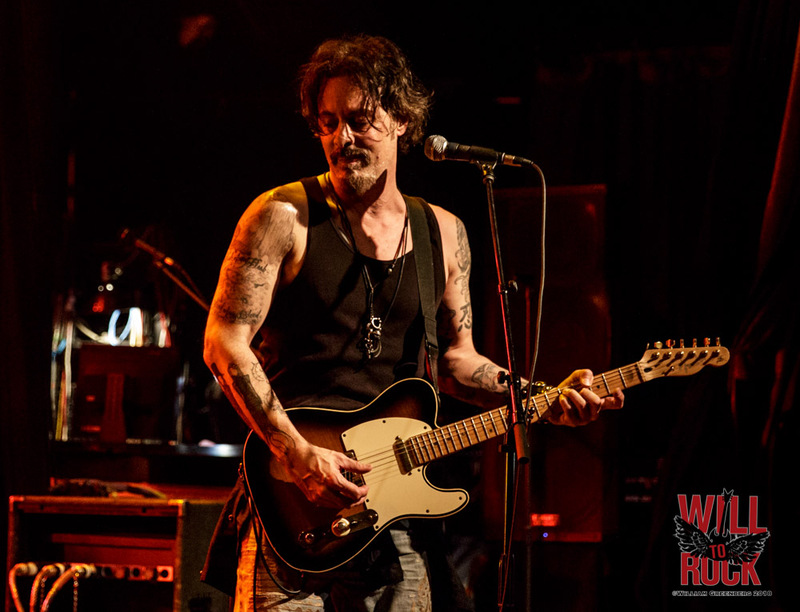 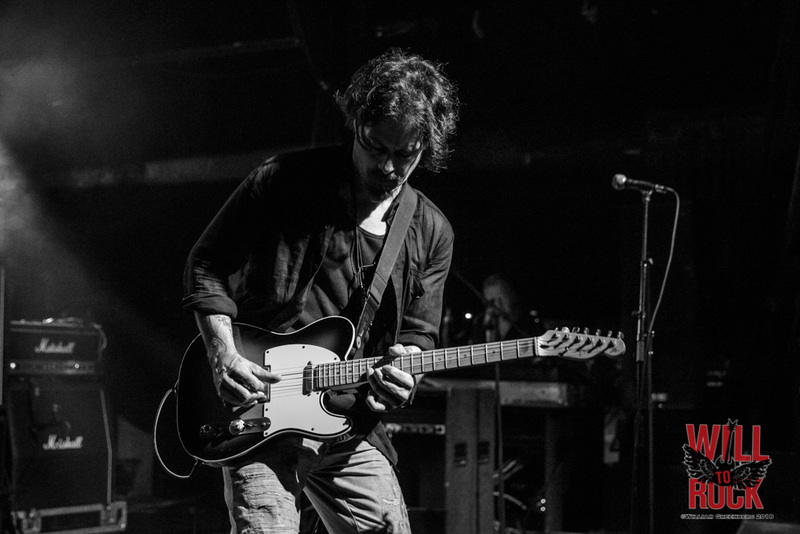 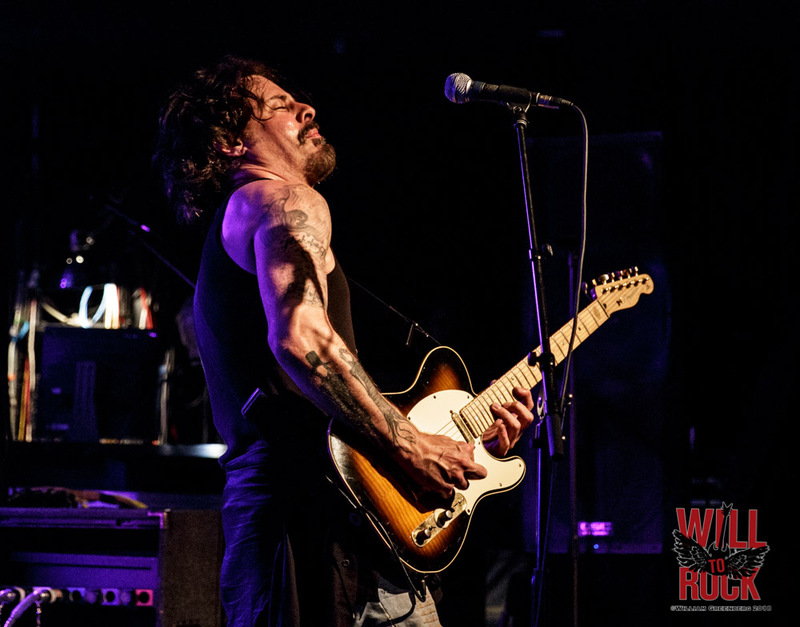 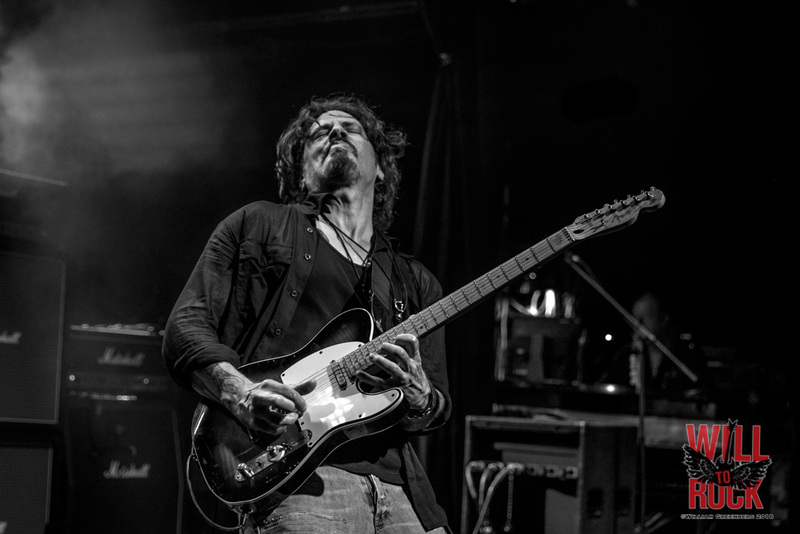 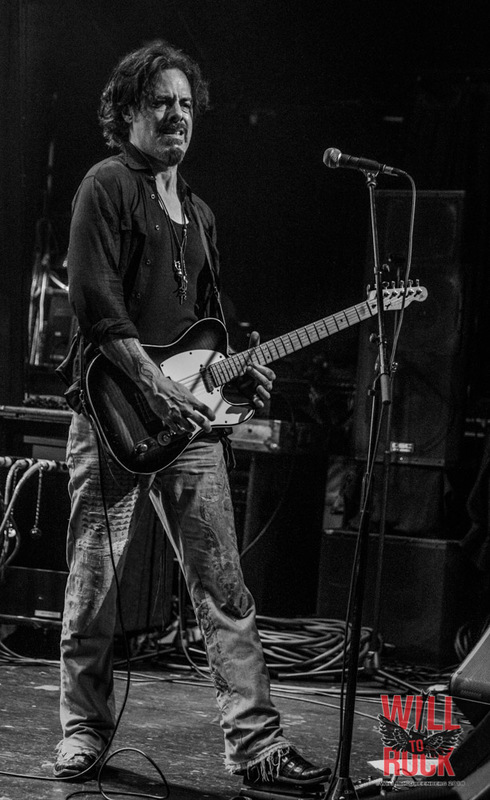 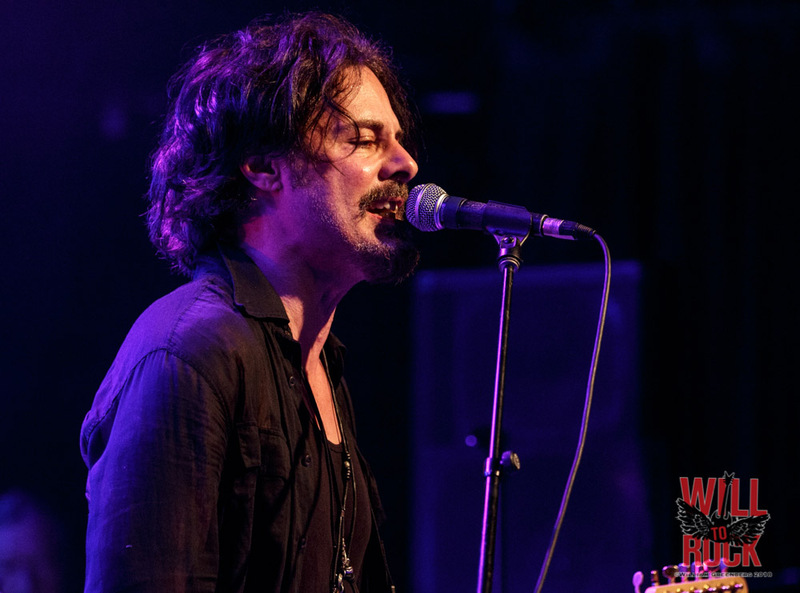 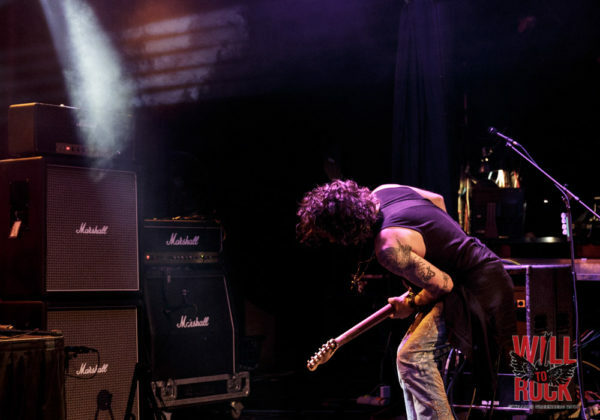 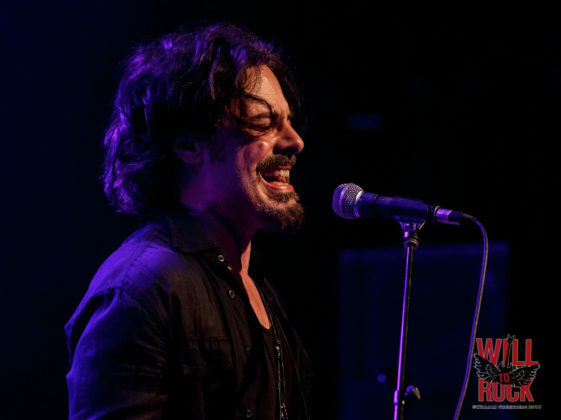 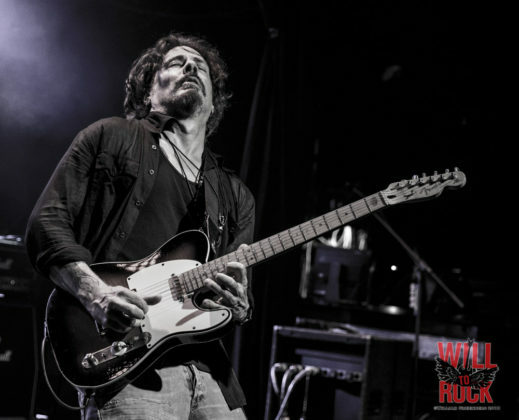 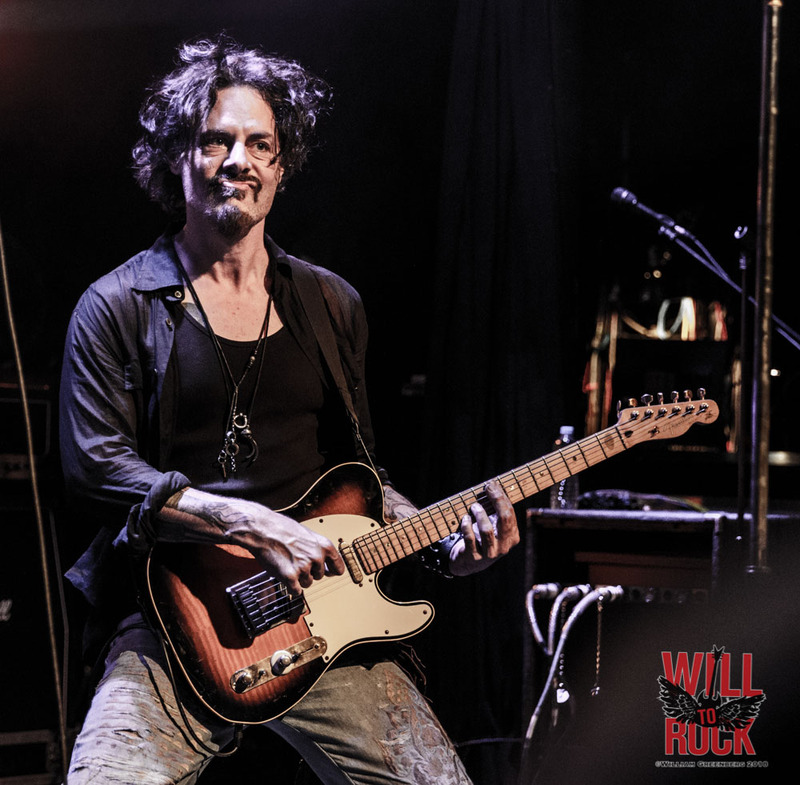 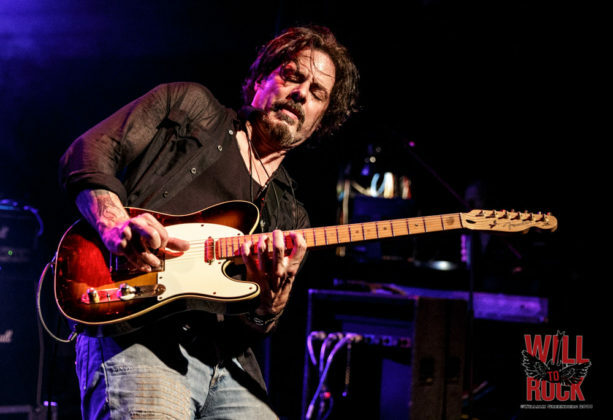 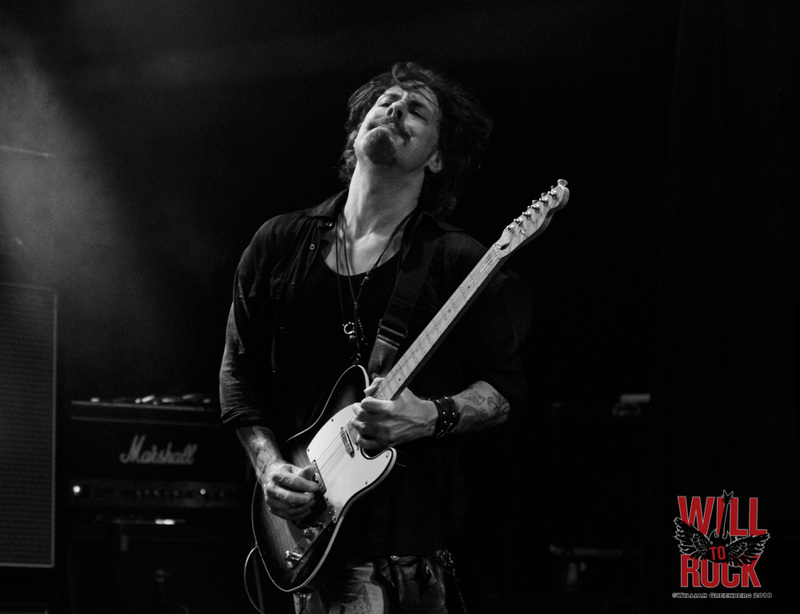 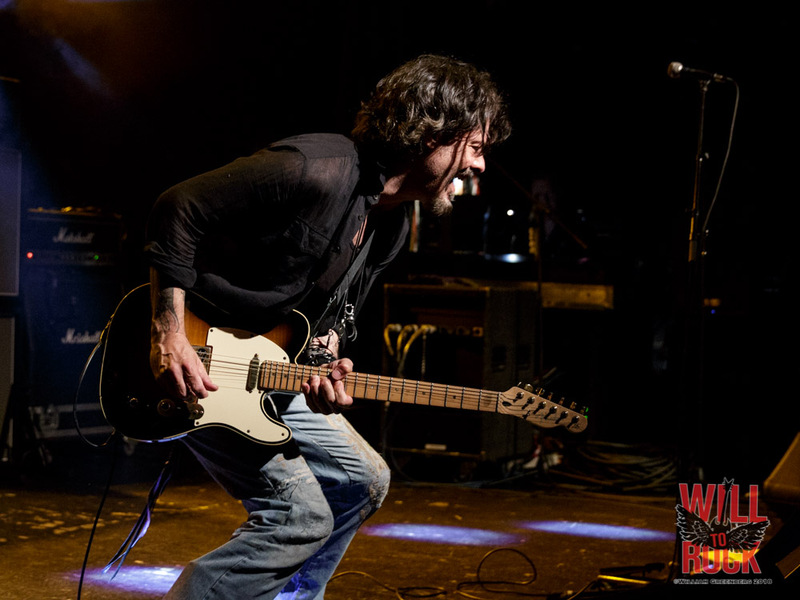 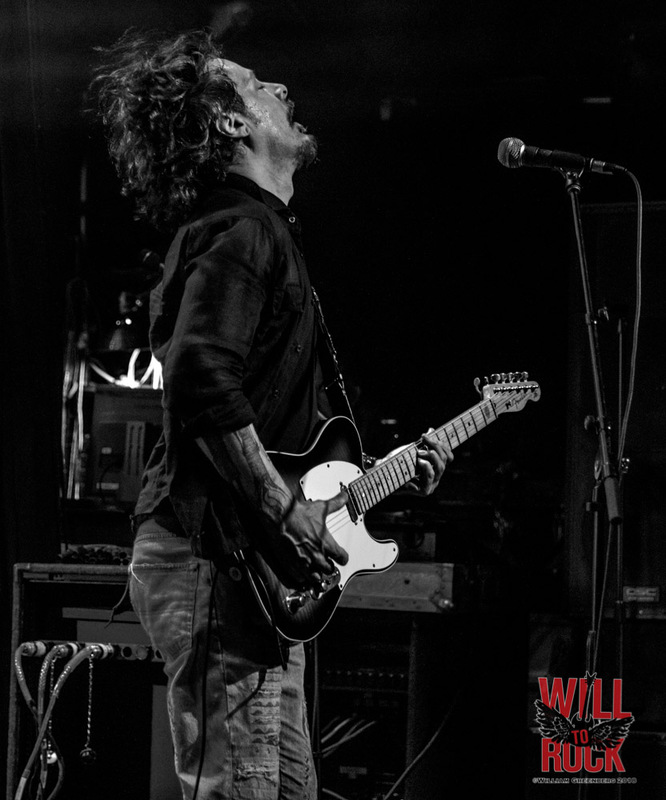 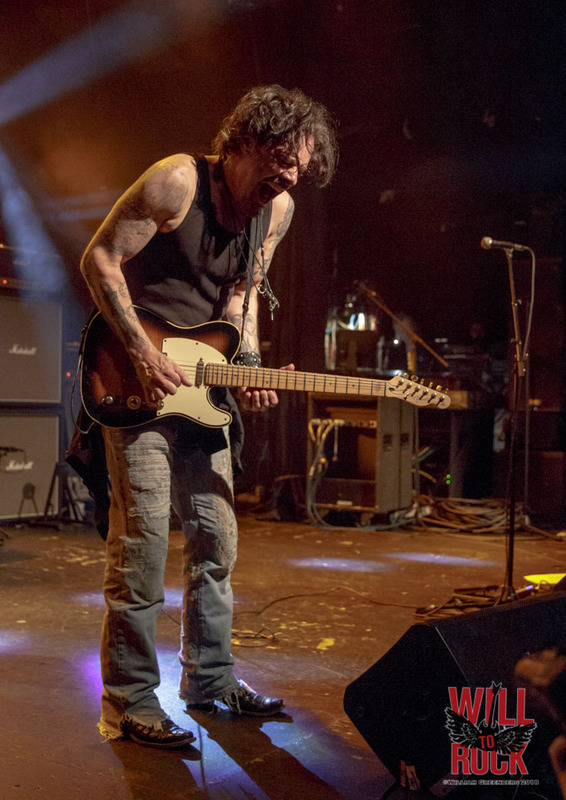 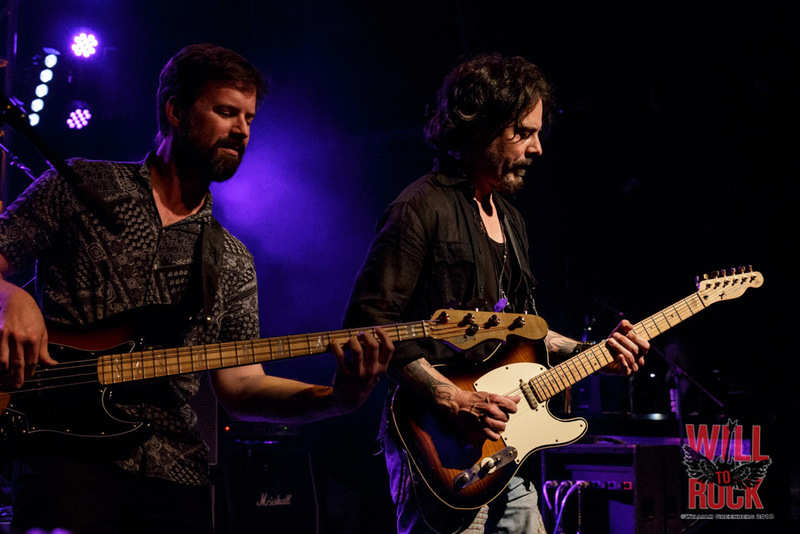 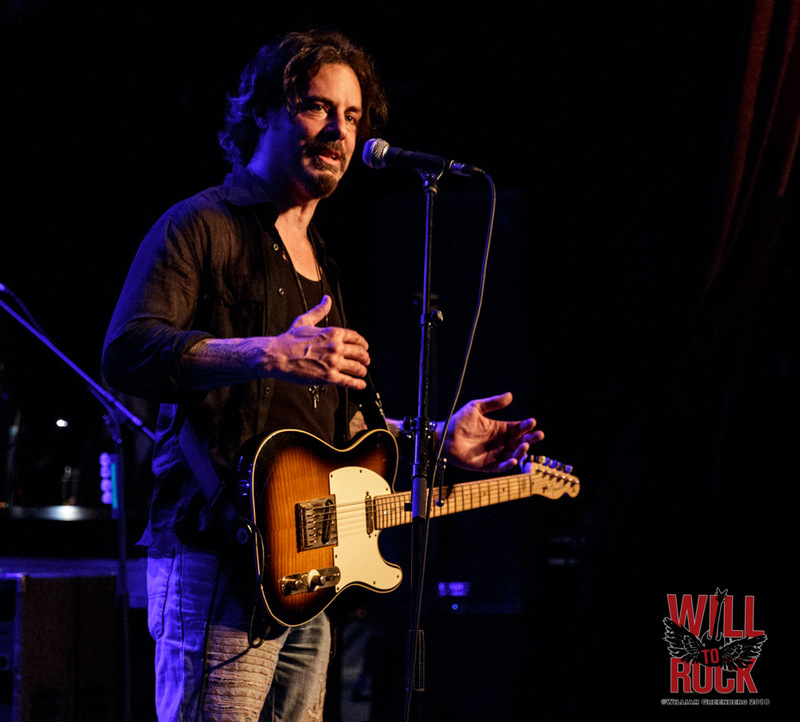 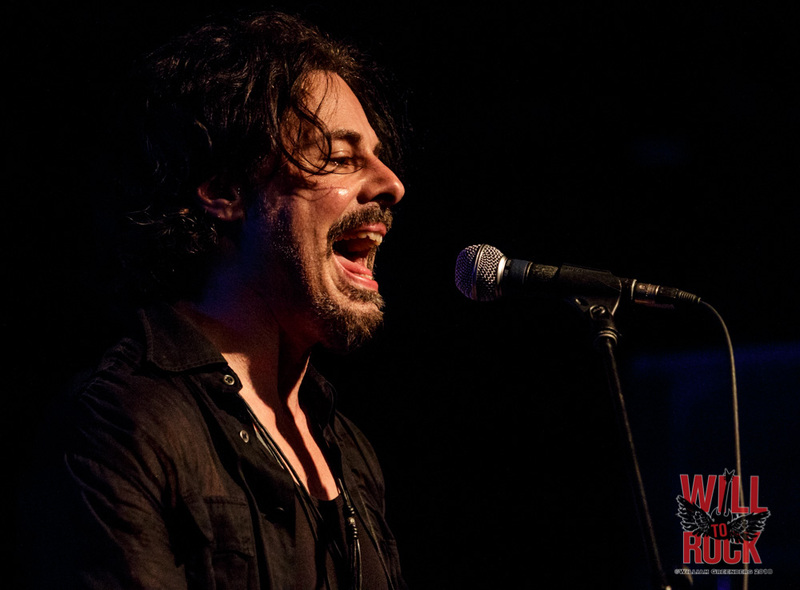 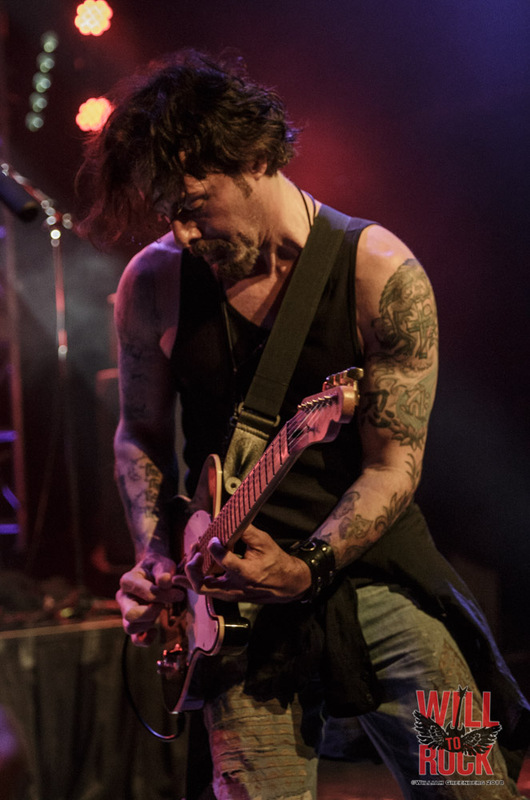 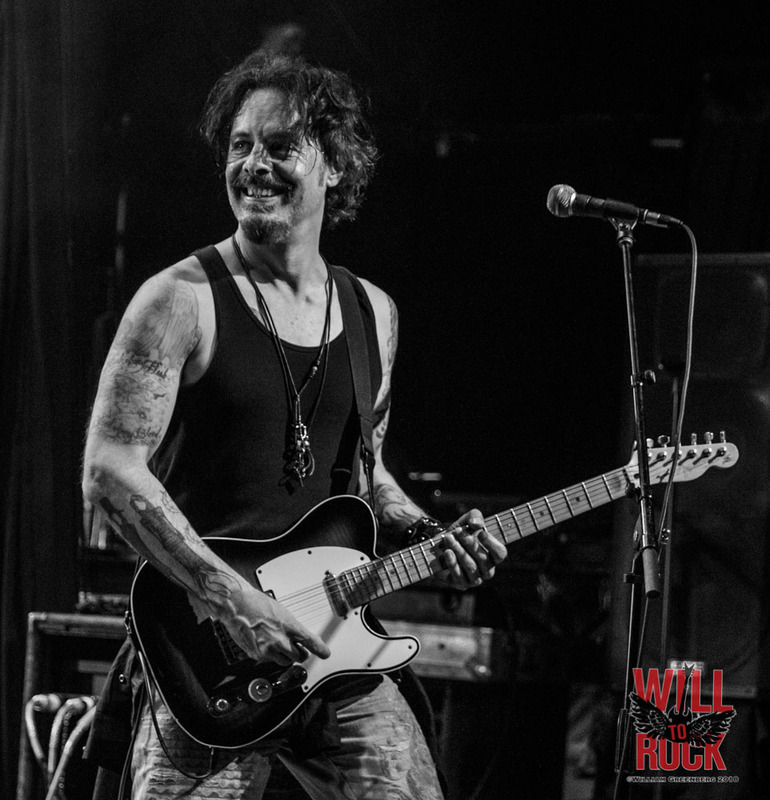 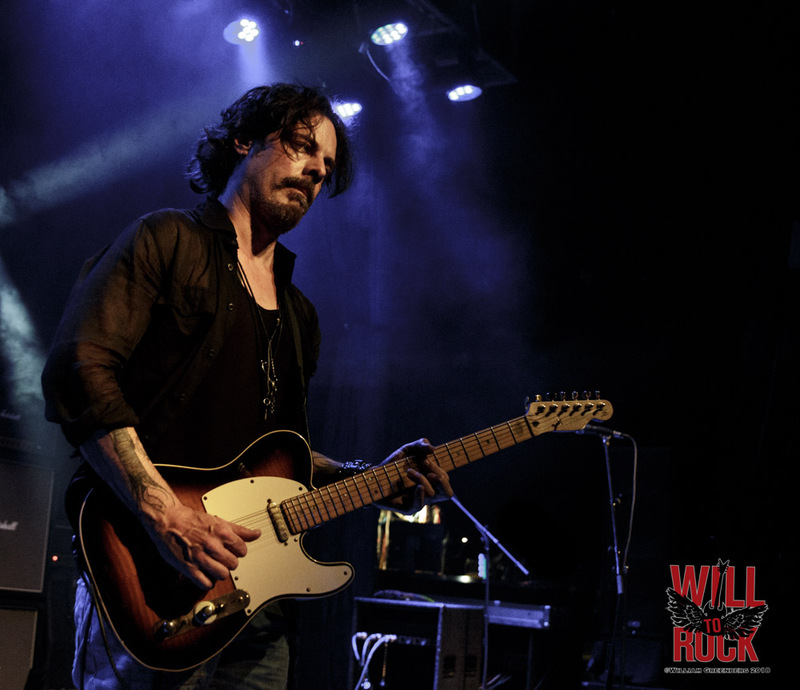 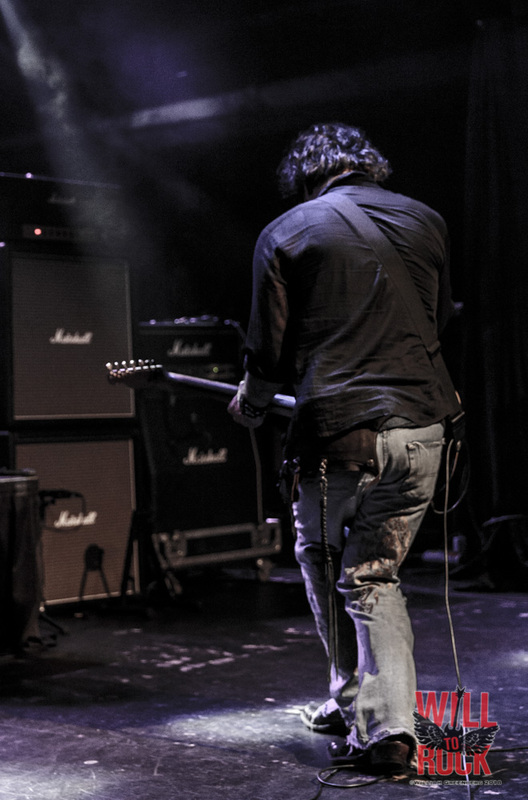 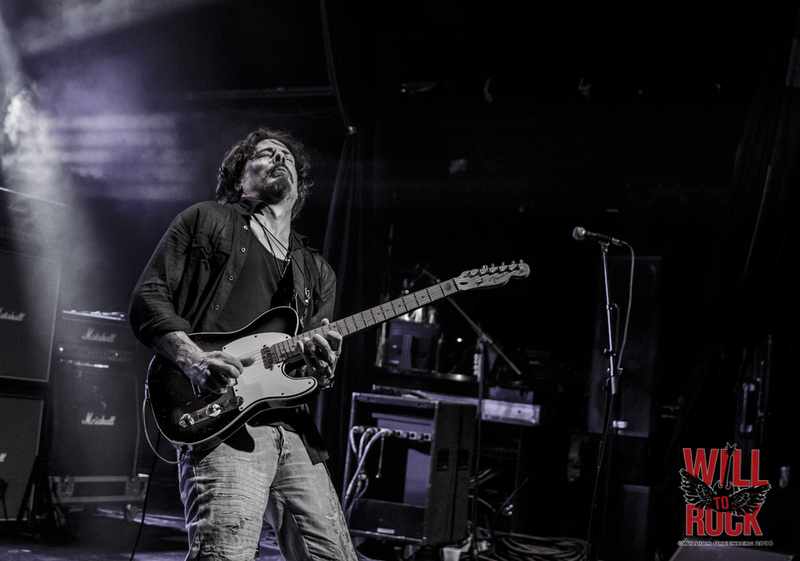 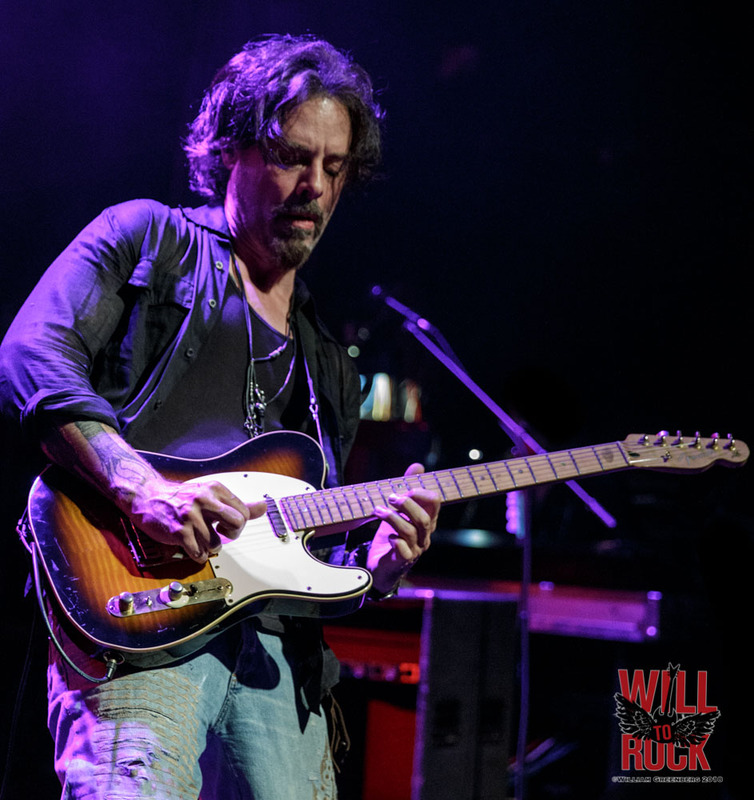 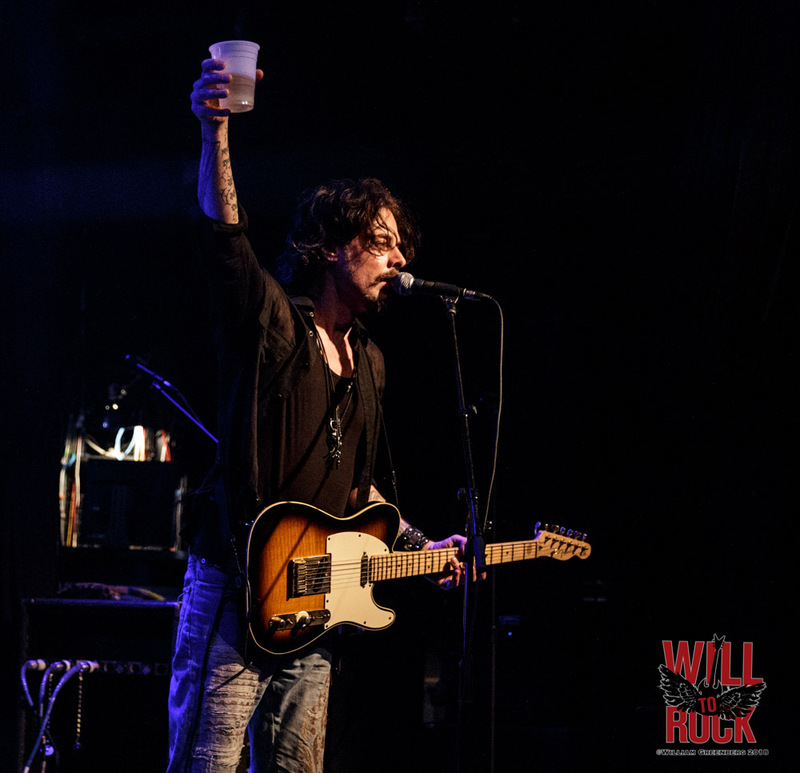 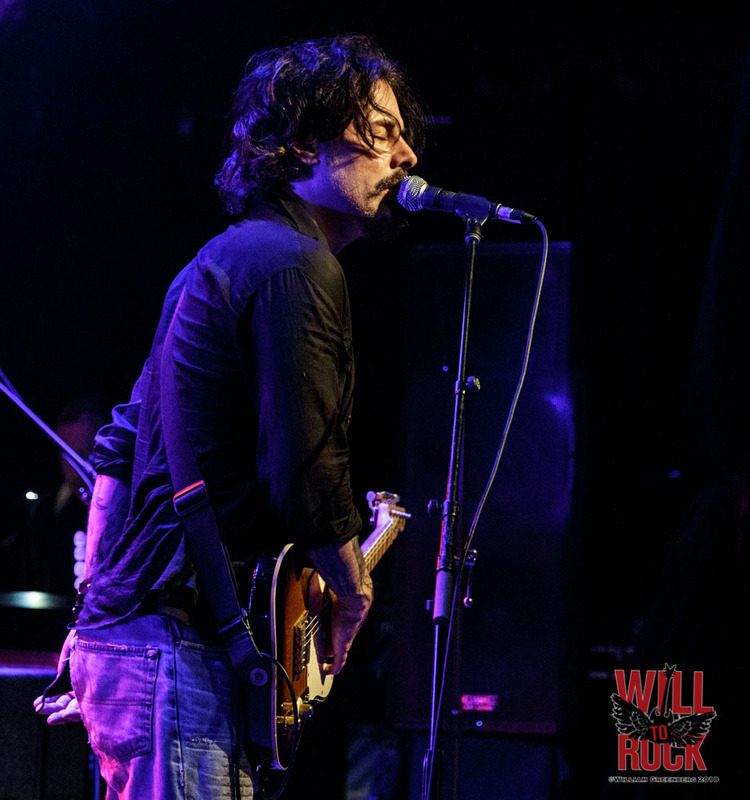 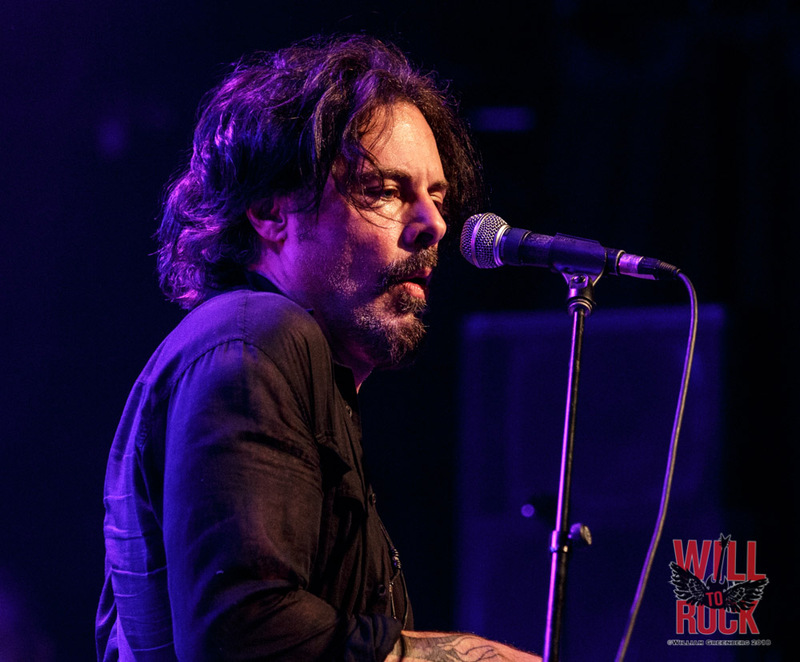 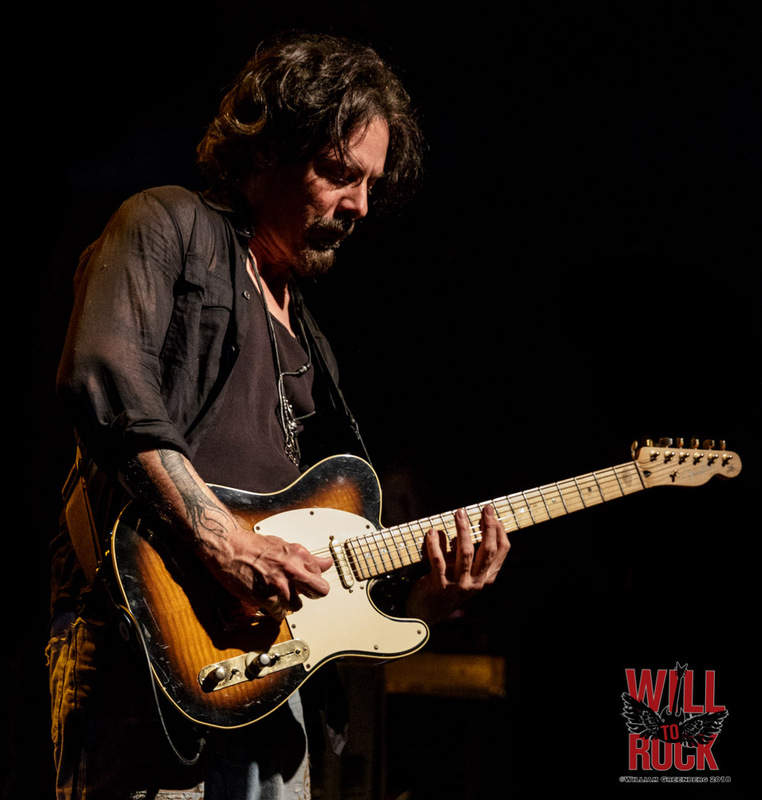 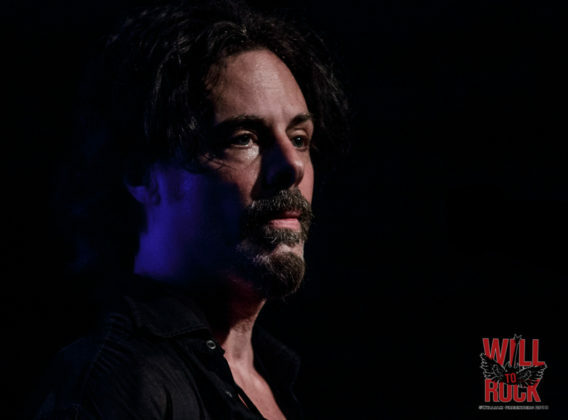 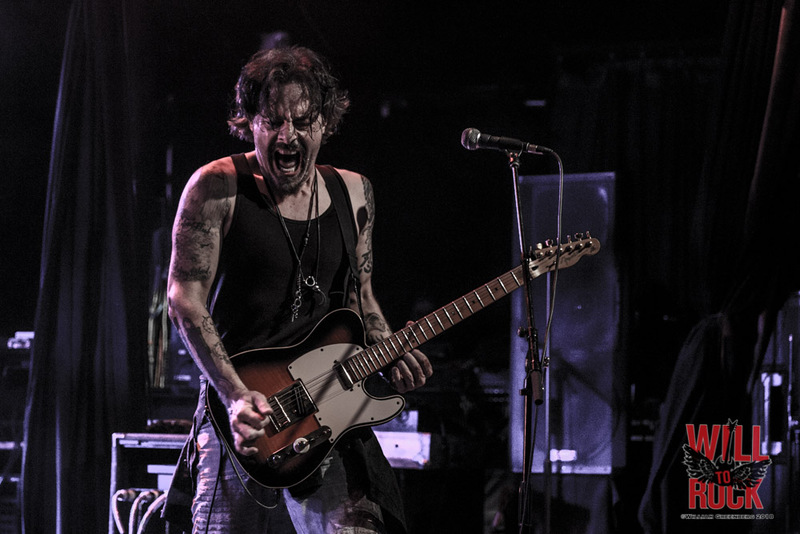 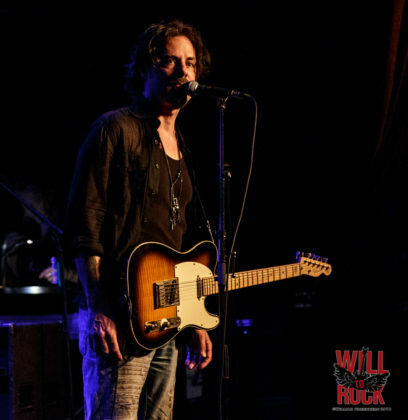 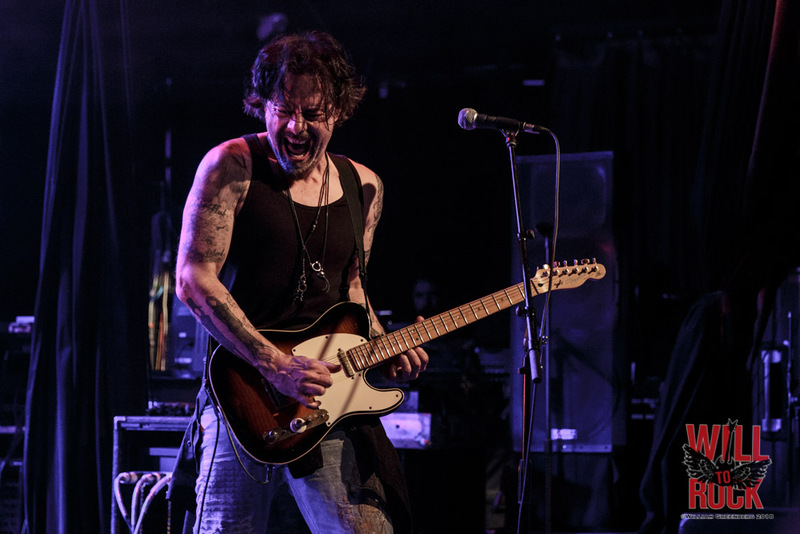 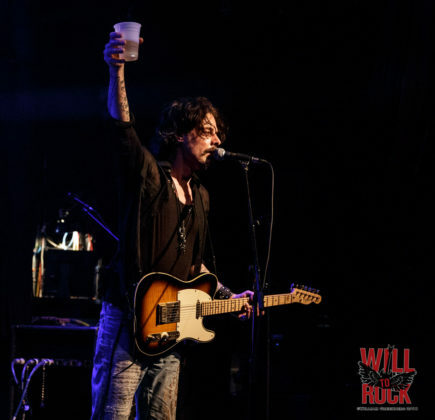 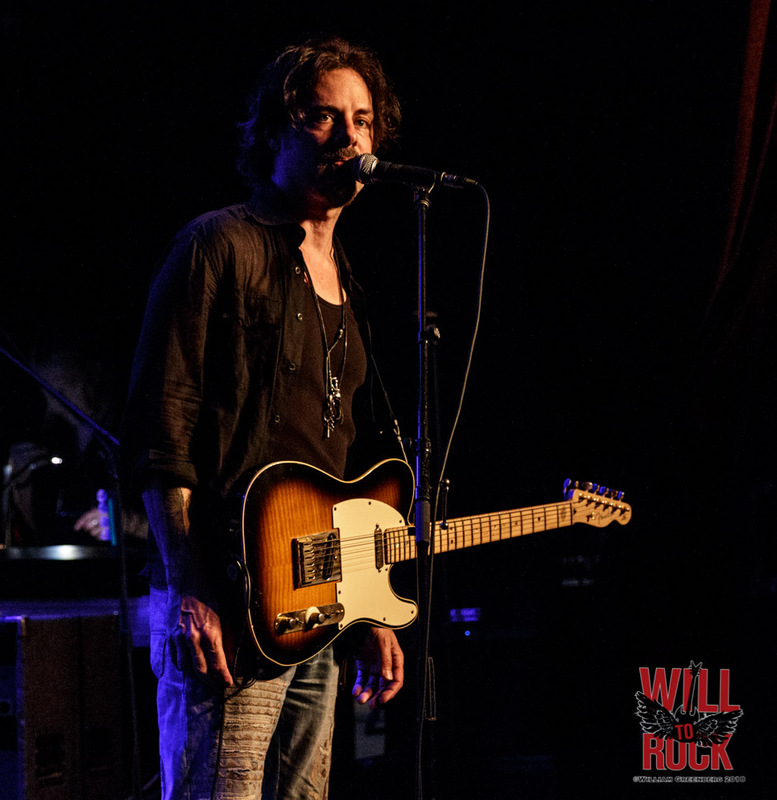 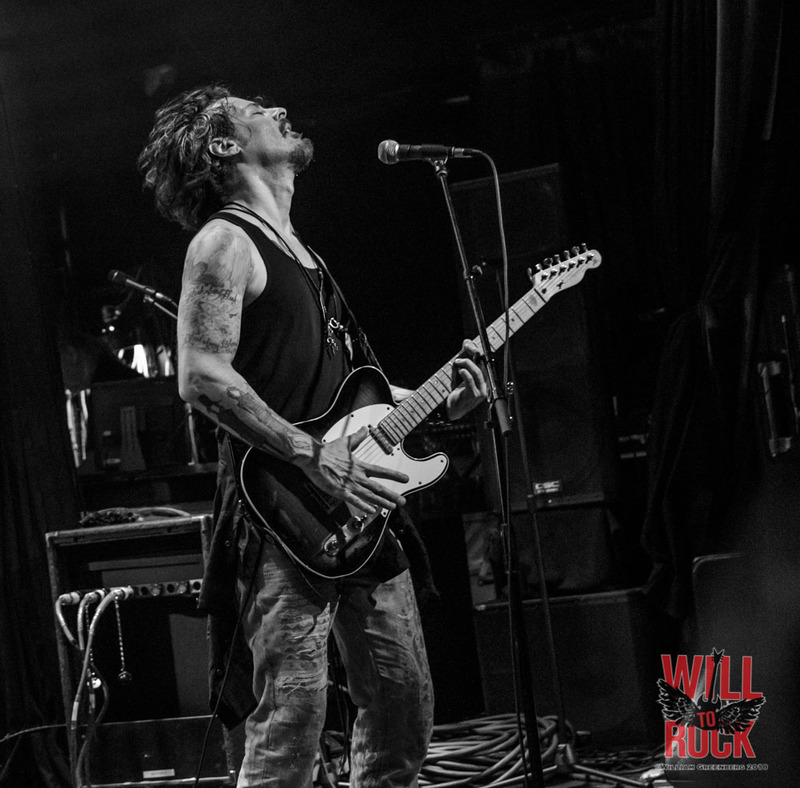 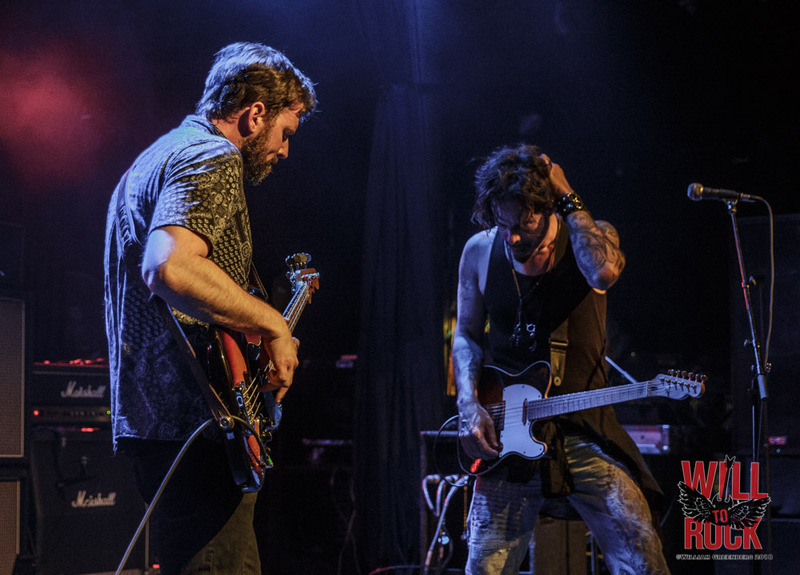 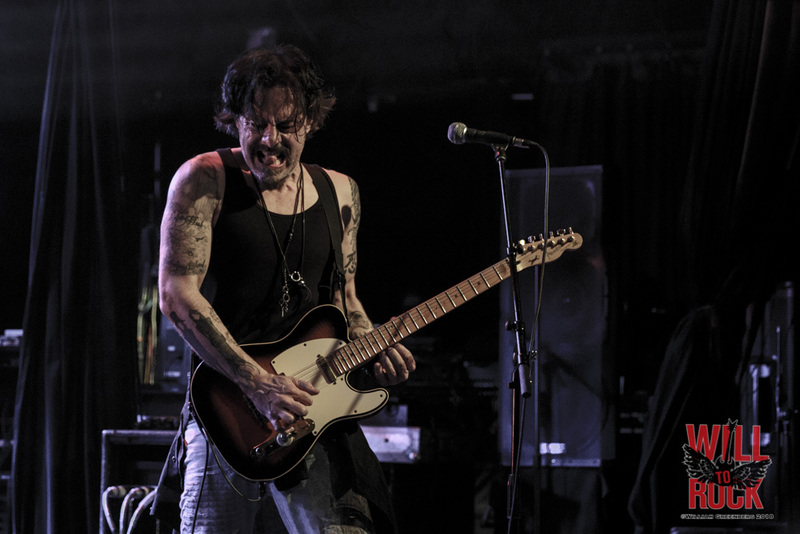 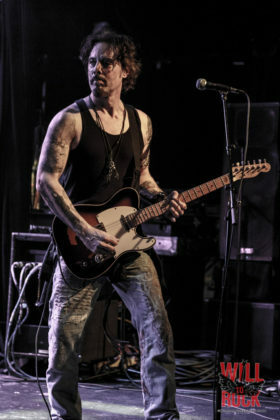 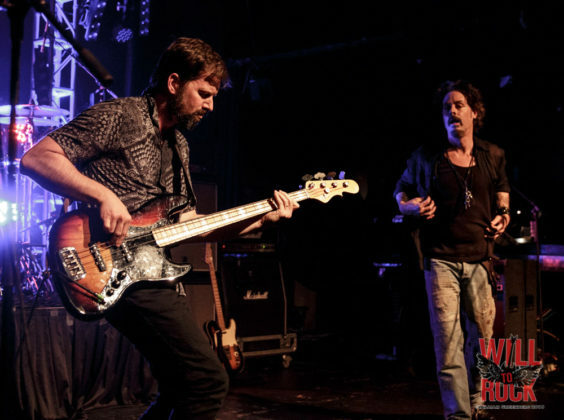 Richie Kotzen (Mr. Big guitarist from 1999-2002), along with bassist Dylan Wilson and drummer, Mike Bennett kicked off the evening. 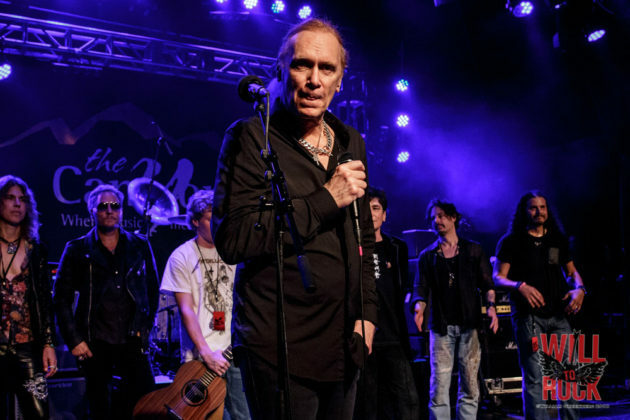 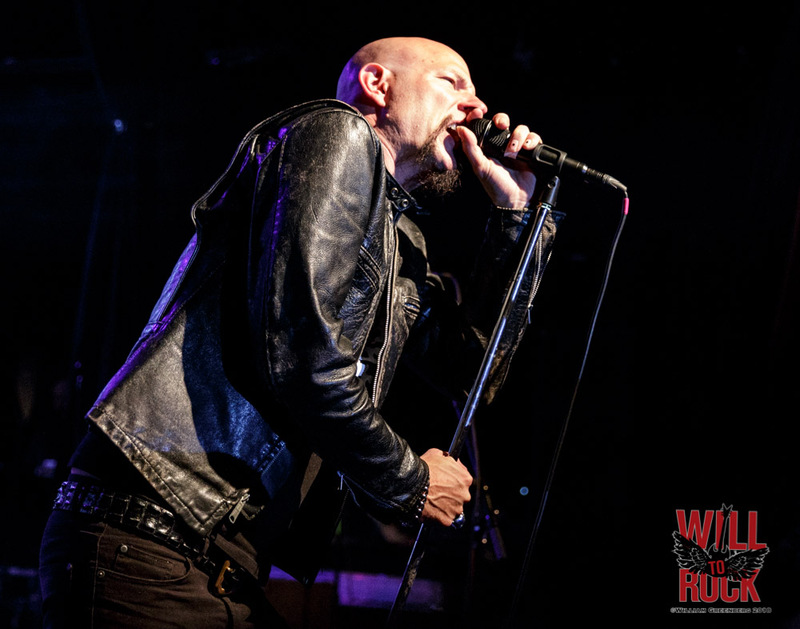 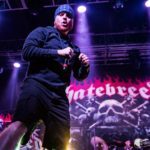 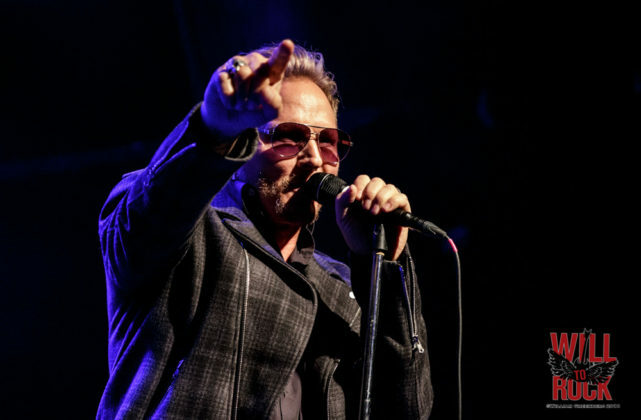 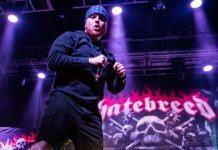 Richie began by offering a few words expressing how it sucked to be here under these circumstances but that they would try to honor Pat the only way they knew how…through their music. 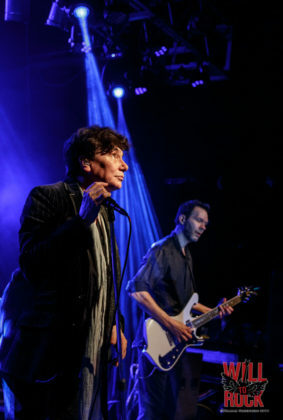 With that the band kicked into “Your Entertainer” which started a 45 minute set that exuded the usual expert musicianship along with a ton of soul. 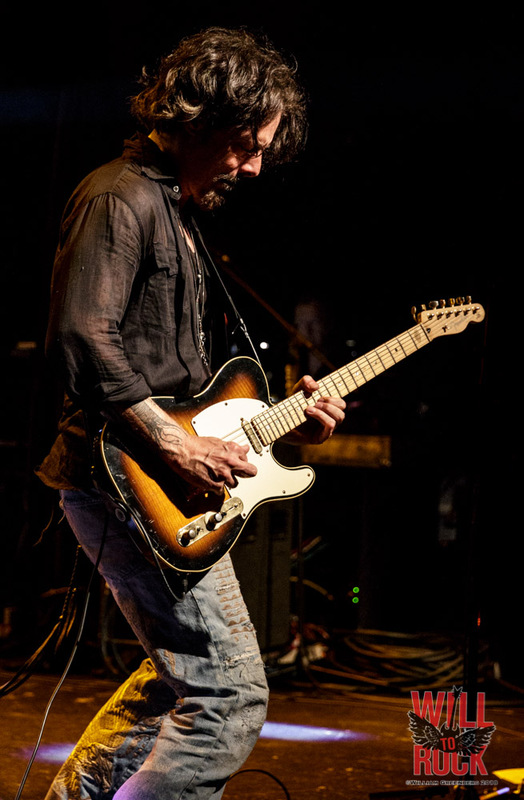 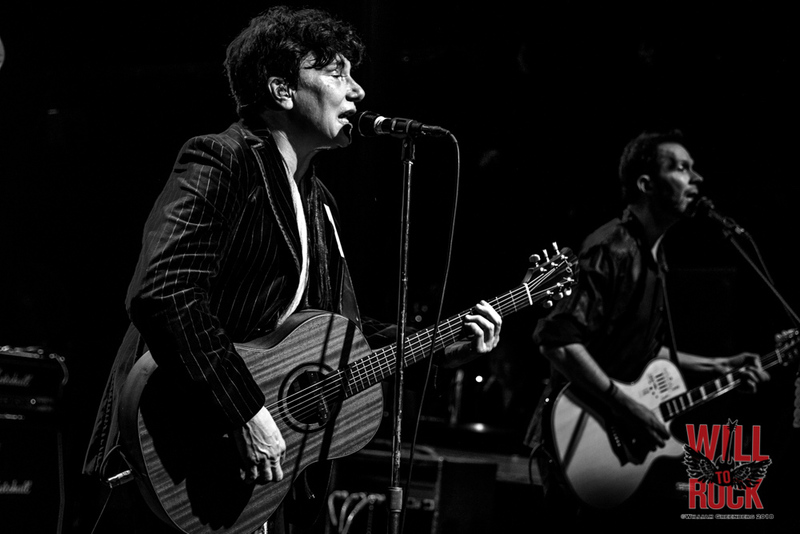 There’s not much more I can say about Richie that I haven’t said before, but he is a mesmerizing musician to watch. 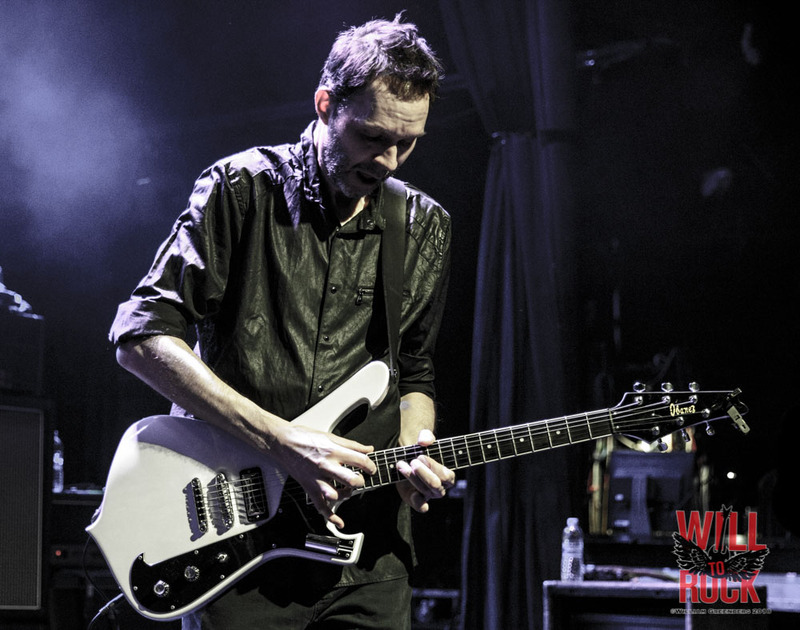 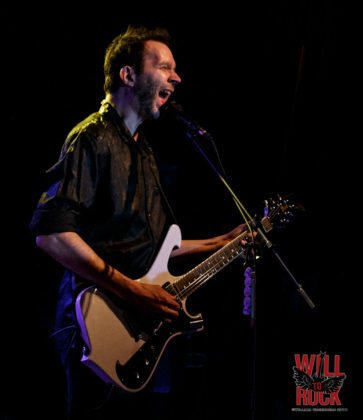 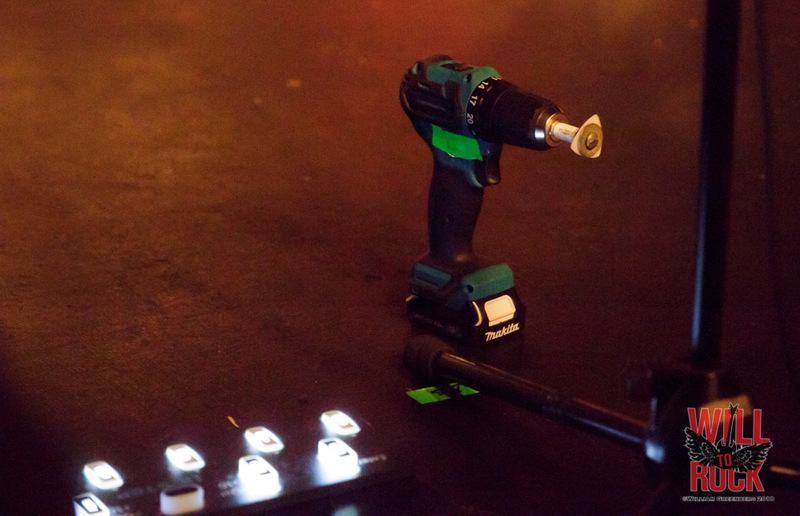 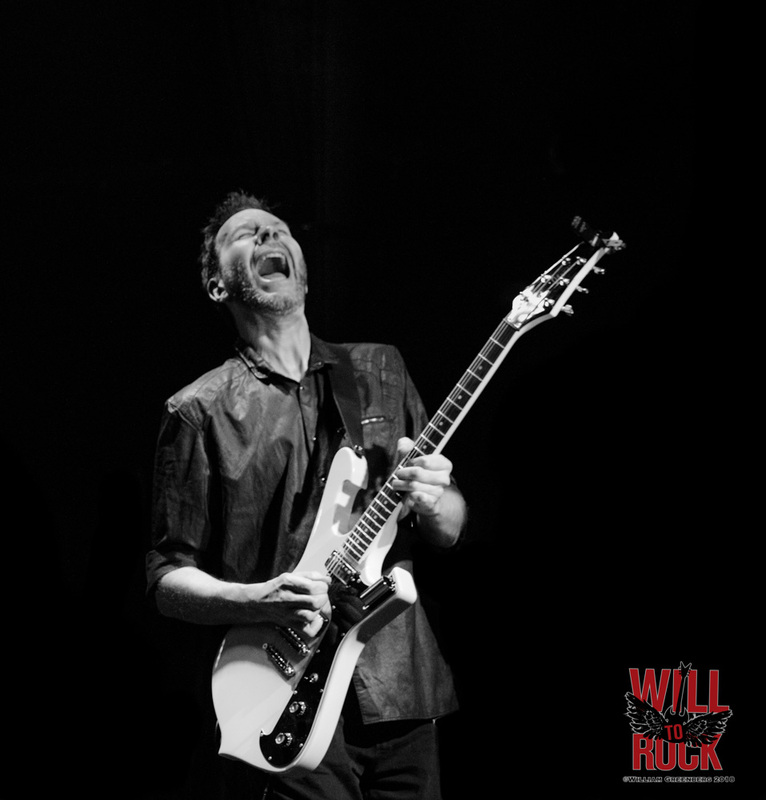 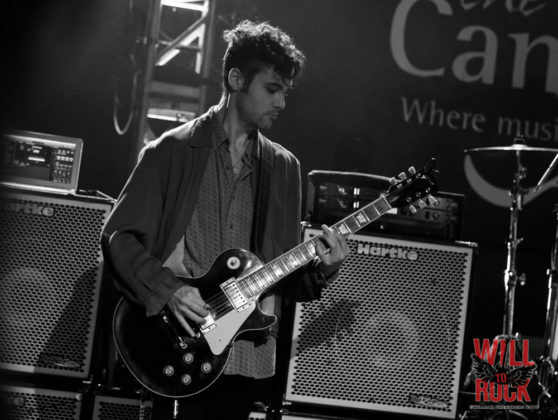 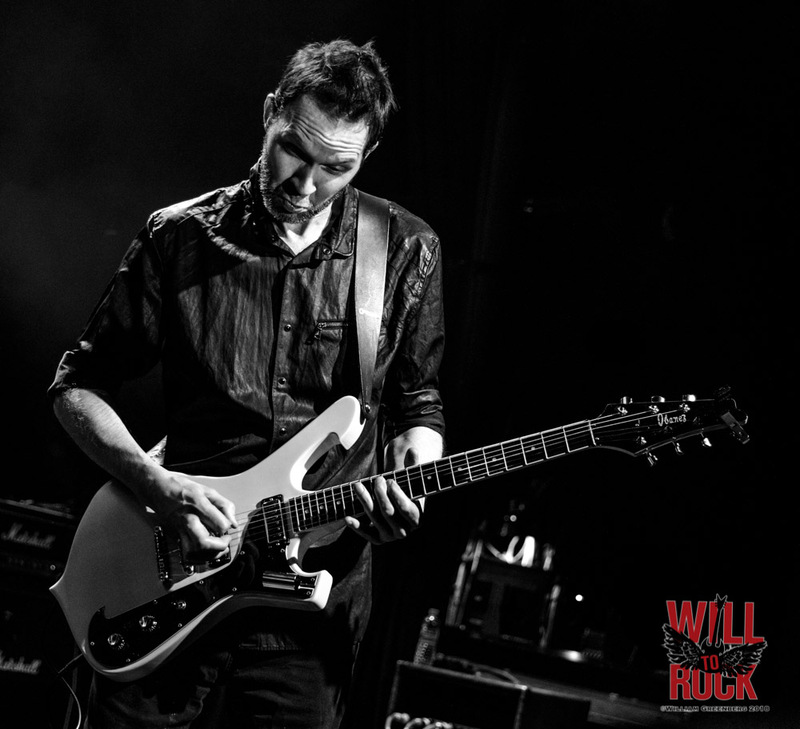 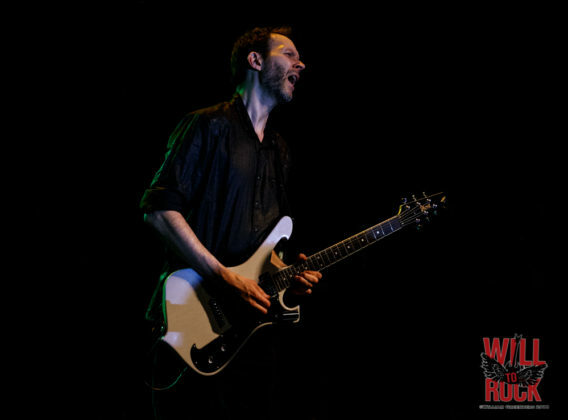 The only thing that competes with the intensity of his fret work is the crispness, range and feeling in his voice. Each of his songs is a winding journey through emotion. He usually defies genres, but tonight was certainly a night to rock. 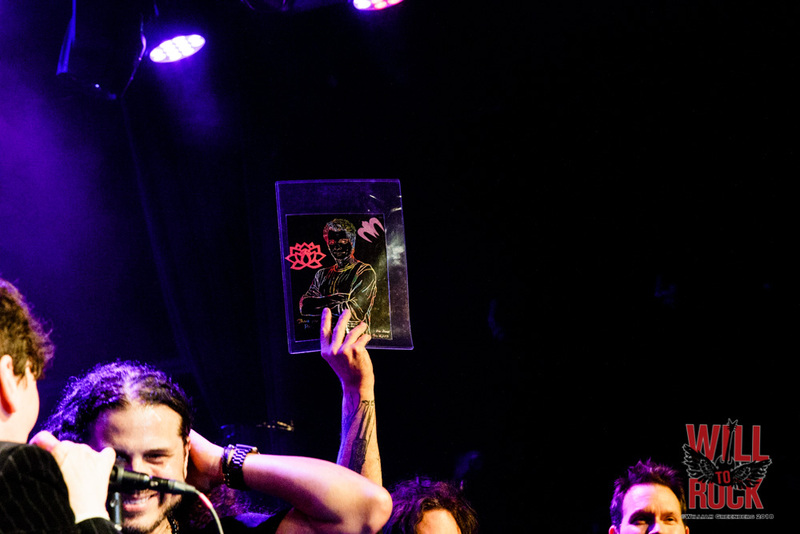 I’ve mentioned before how amazing Dylan and Mike are and dammit, I’m mentioning it again! 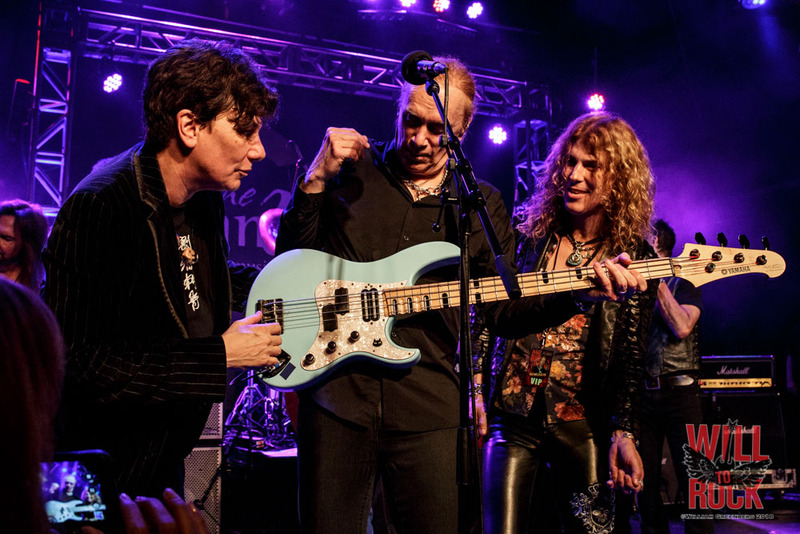 Playing with Richie has to be akin to riding a roller-coaster while trying to balance a glass of water on your head, and this rhythm section doesn’t allow a drop to spill. 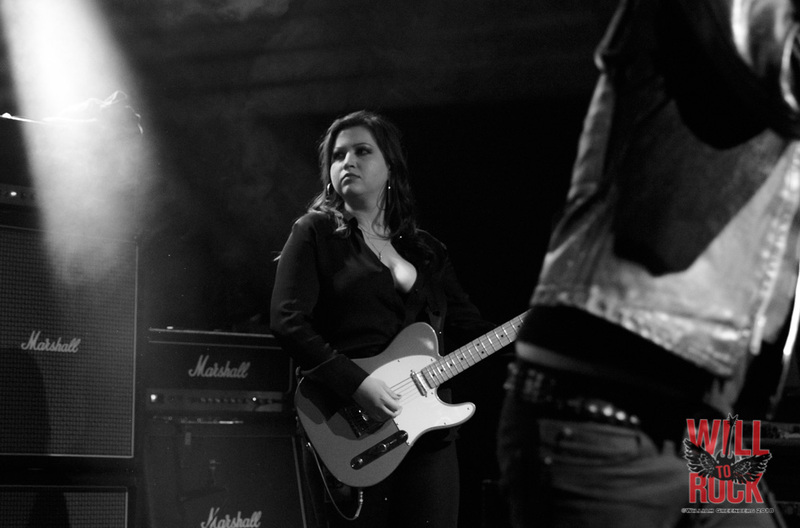 A 3 minute album cut could take 10 minutes when they’re on stage and they handle every curve, drop and turn flawlessly. Tonight was a quick trip through some of Richie’s catalog from the past 10 years or so… including “Bad Situation“, “Love Is Blind“, “Fooled Again“, “Help Me” and an extended version of “Fear“. 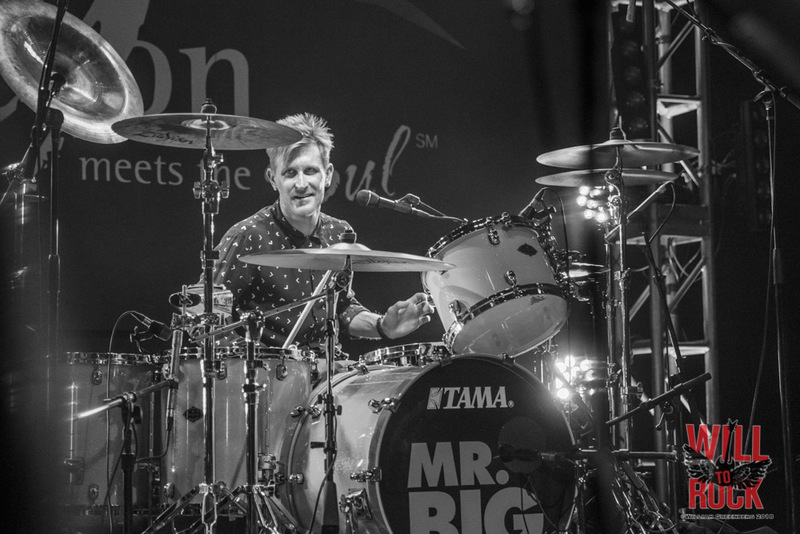 Before Mr. Big took to the stage, another video montage played including a Pat drum solo filmed on Mr. Big’s first tour that included him singing “Yesterday” by one of his favorite bands, The Beatles. 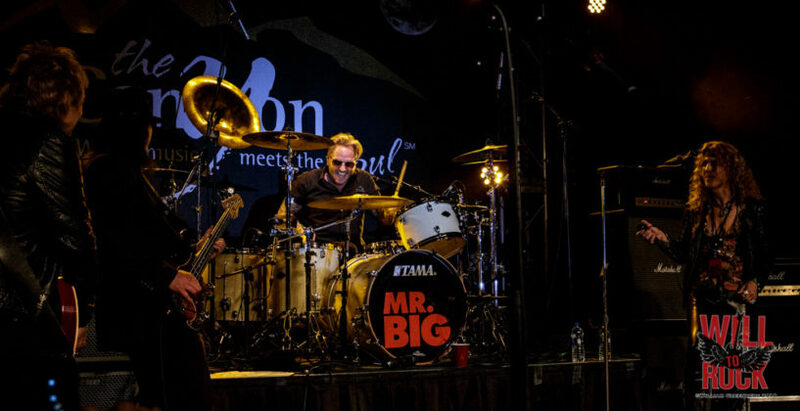 It would be safe to say that this probably wasn’t the easiest show Mr. Big has ever had to play. 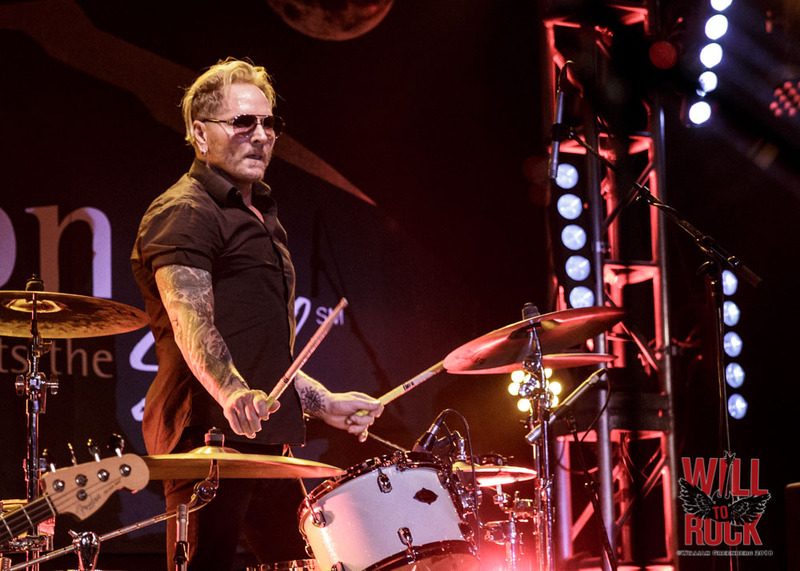 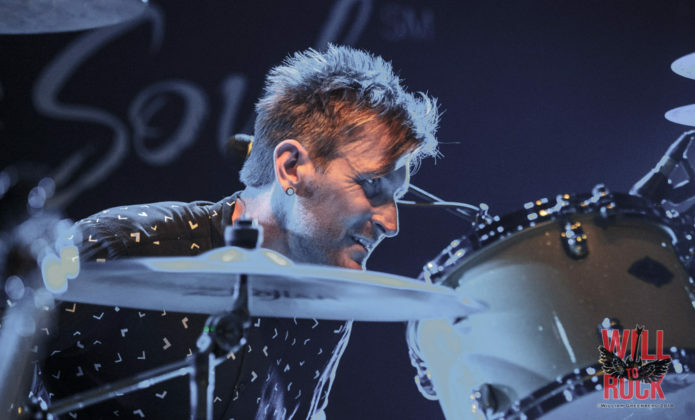 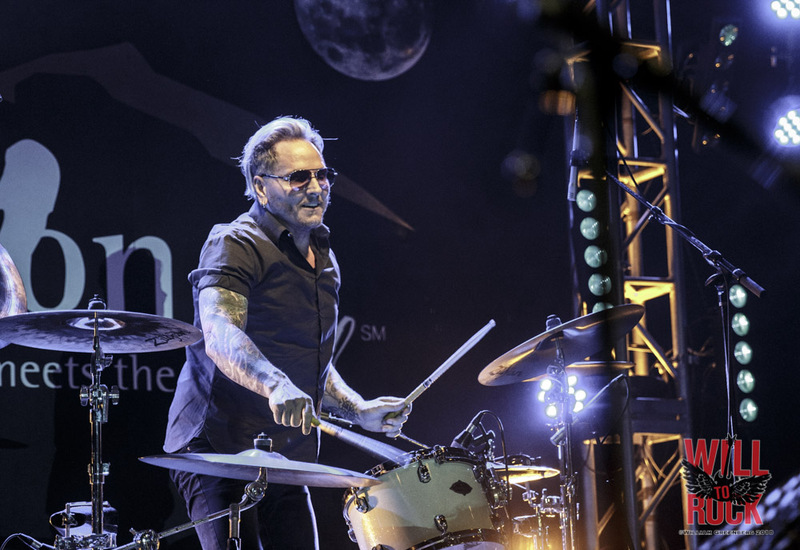 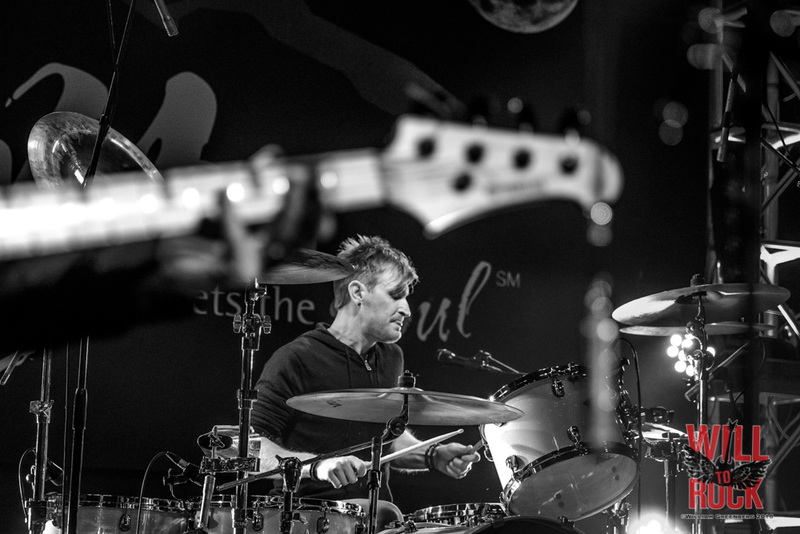 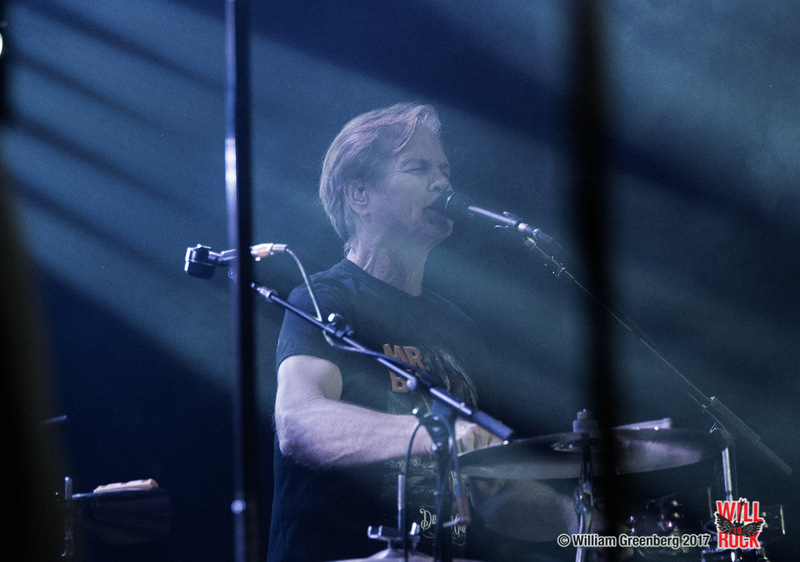 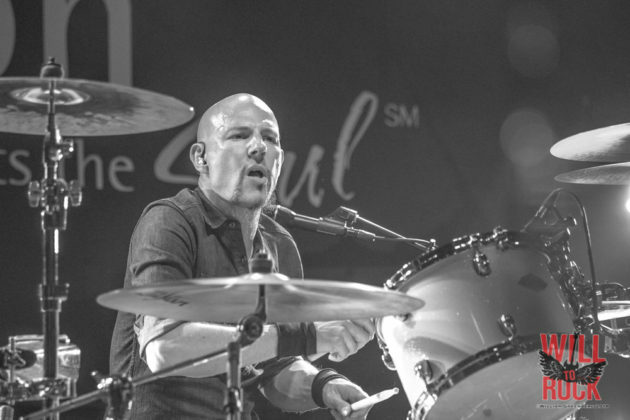 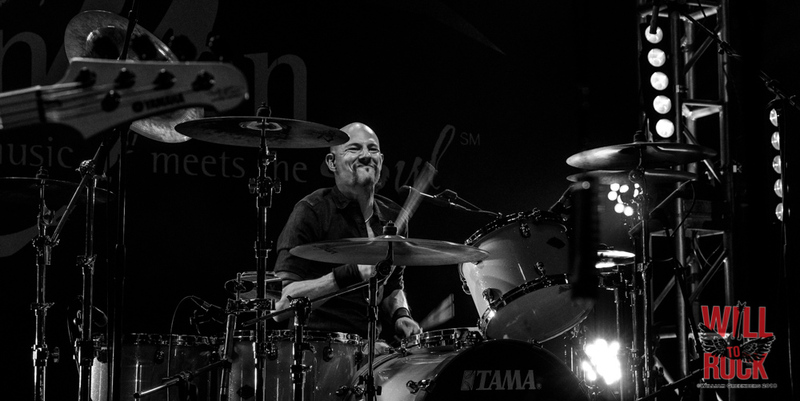 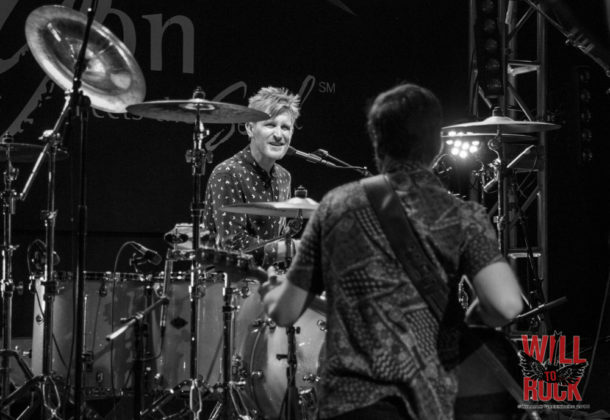 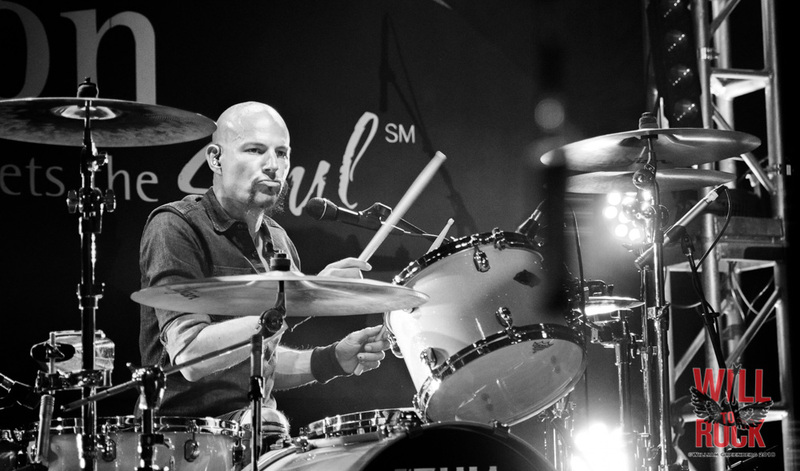 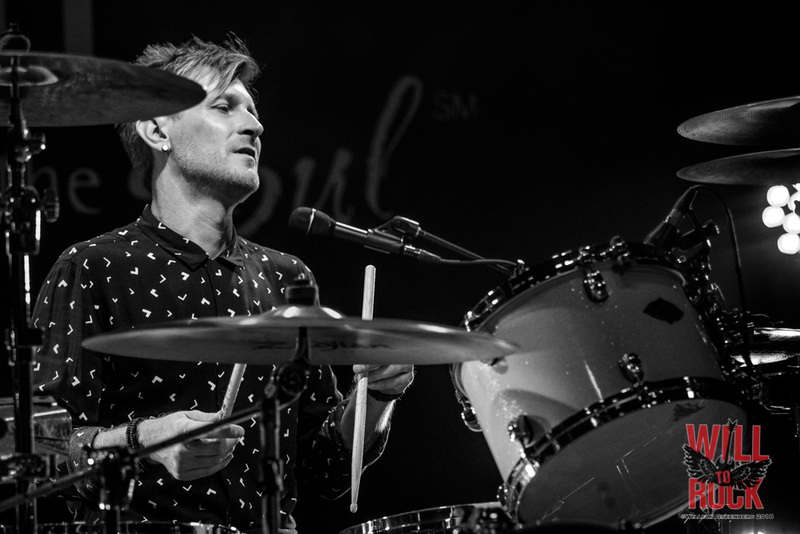 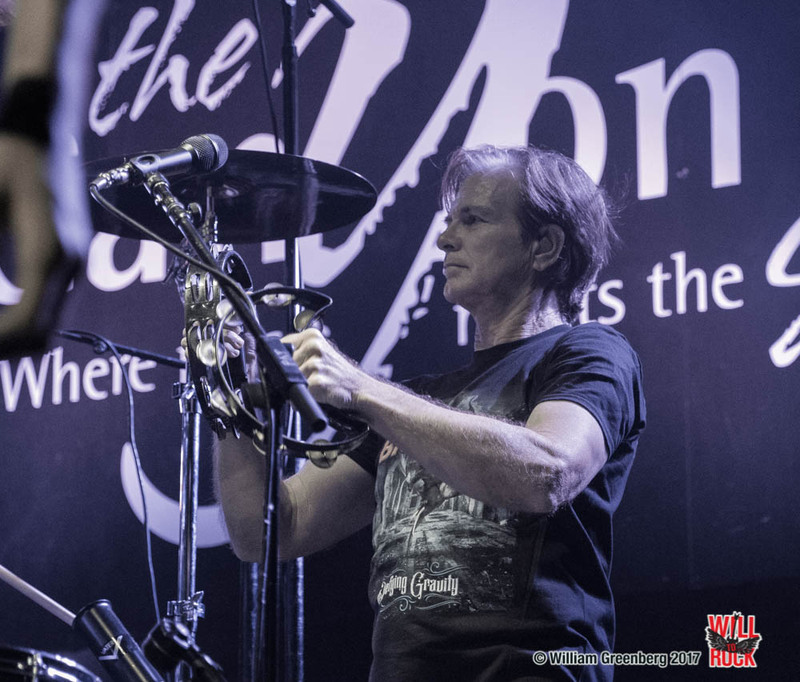 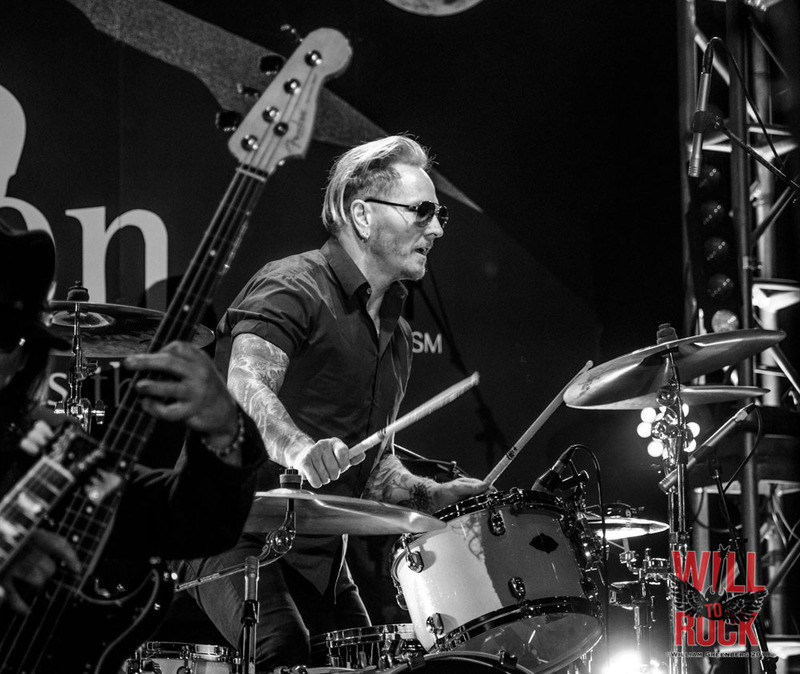 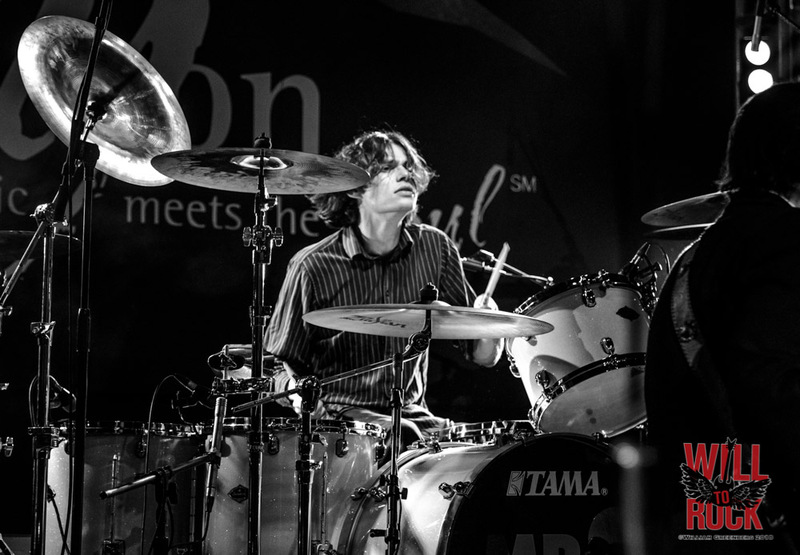 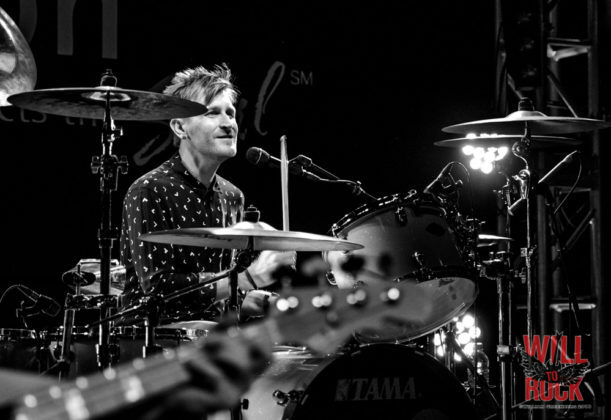 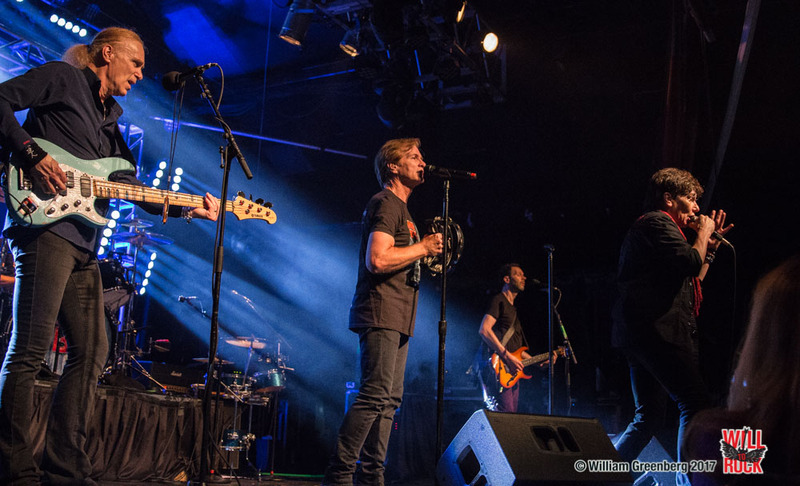 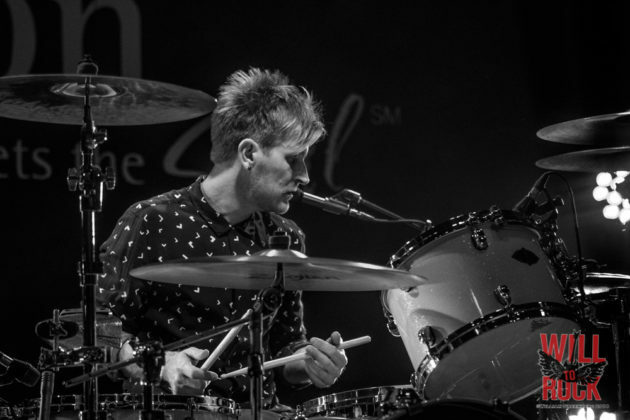 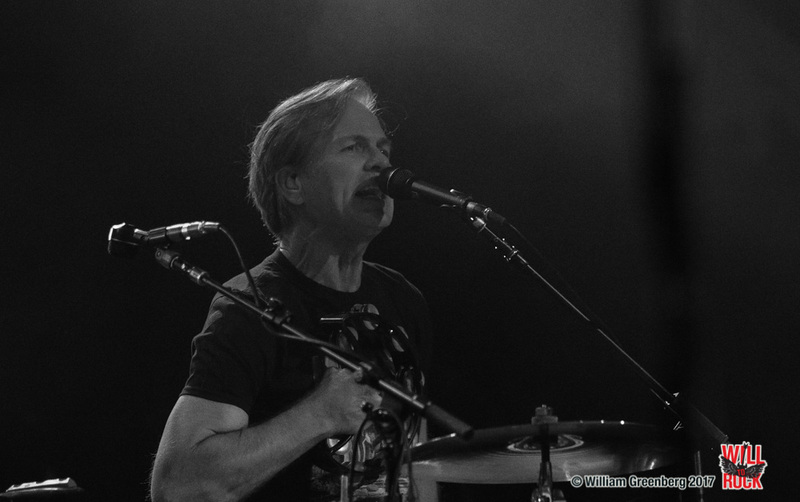 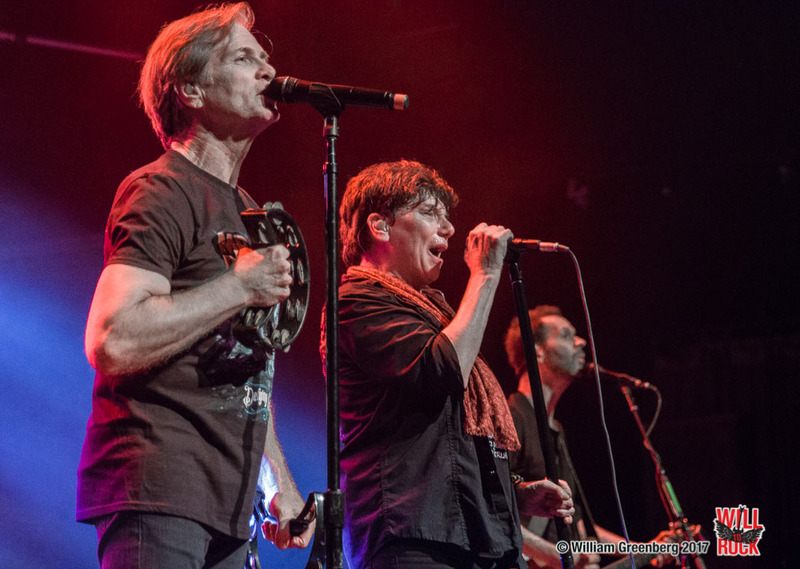 For the first time since their formation, Pat Torpey wasn’t there behind the kit, helping with additional vocals or adding his percussive talents in some way. 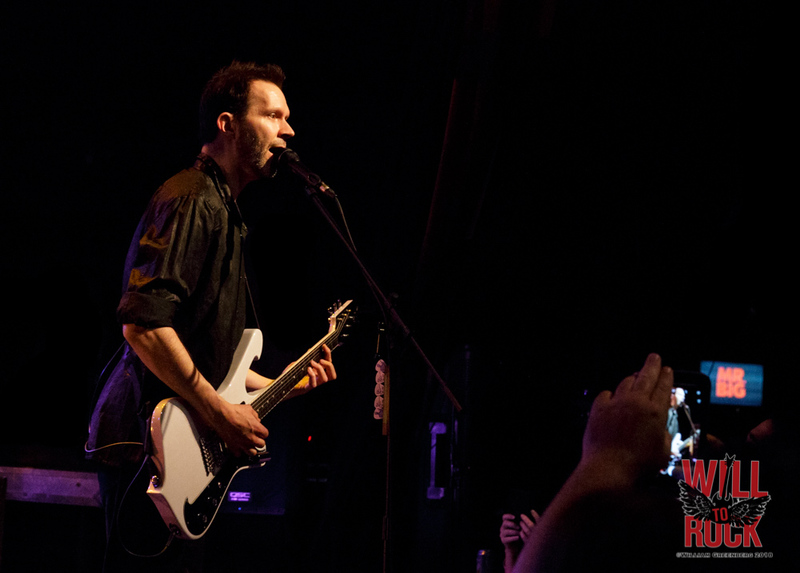 It would also be safe to say that for this night, Pat was front and center. 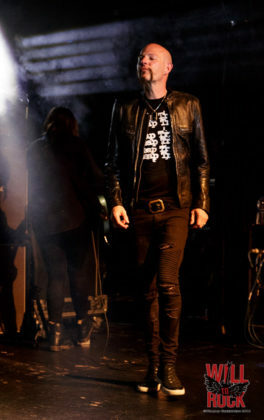 At least in the hearts and minds of every person that took the stage, helped with the show or had the chance to watch. 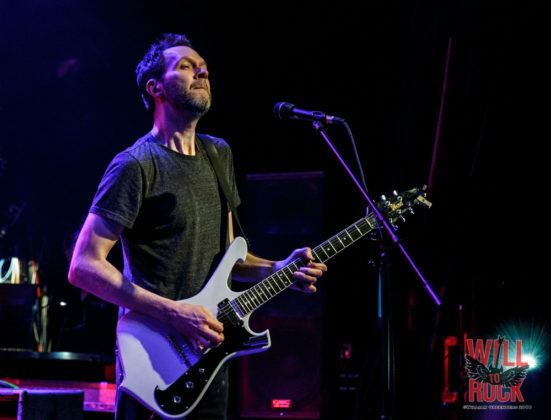 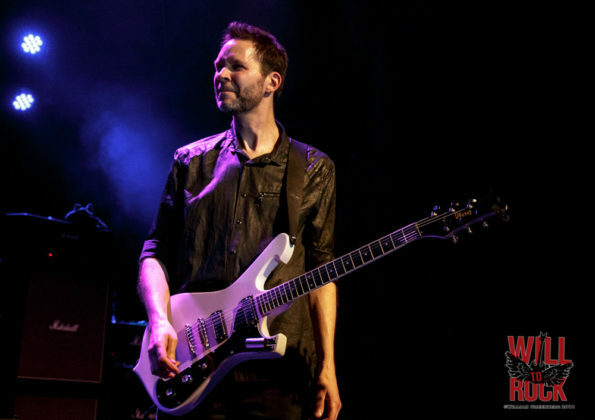 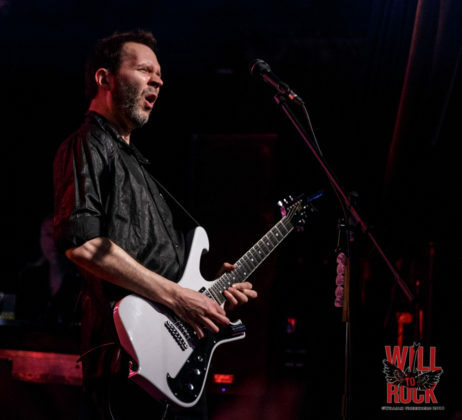 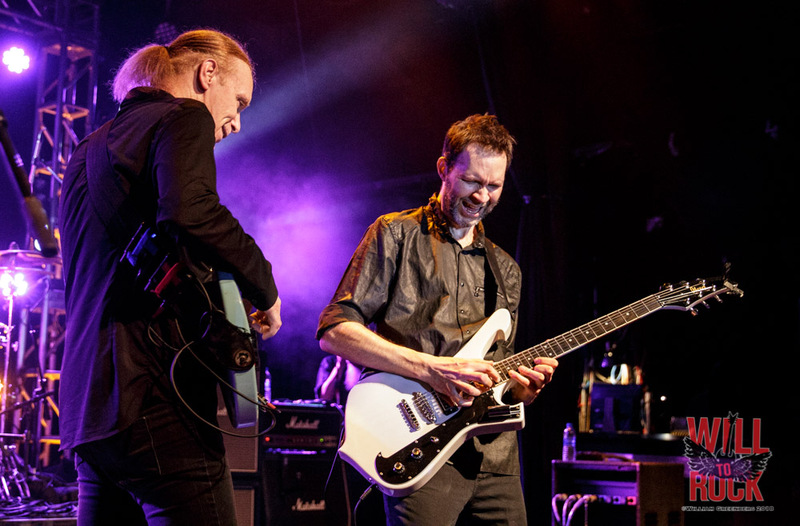 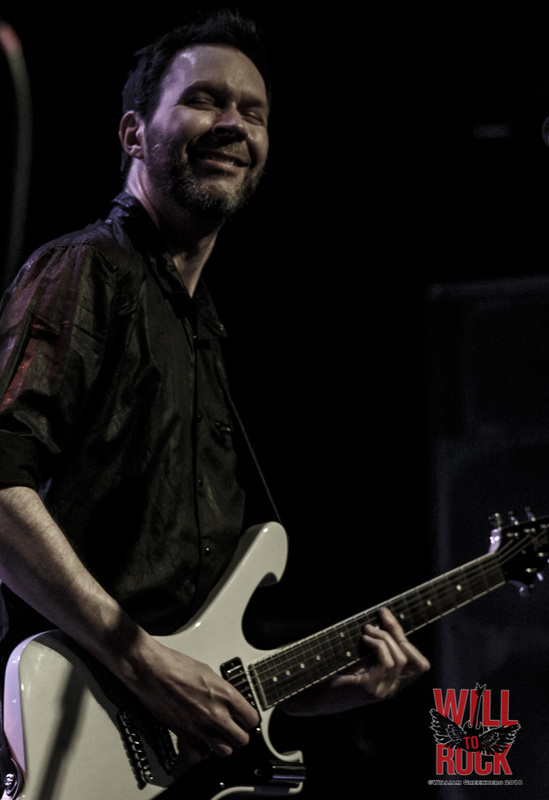 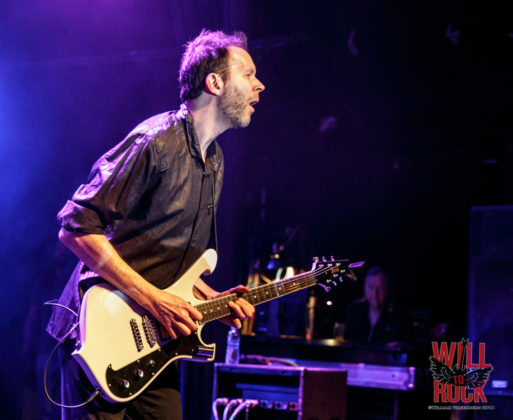 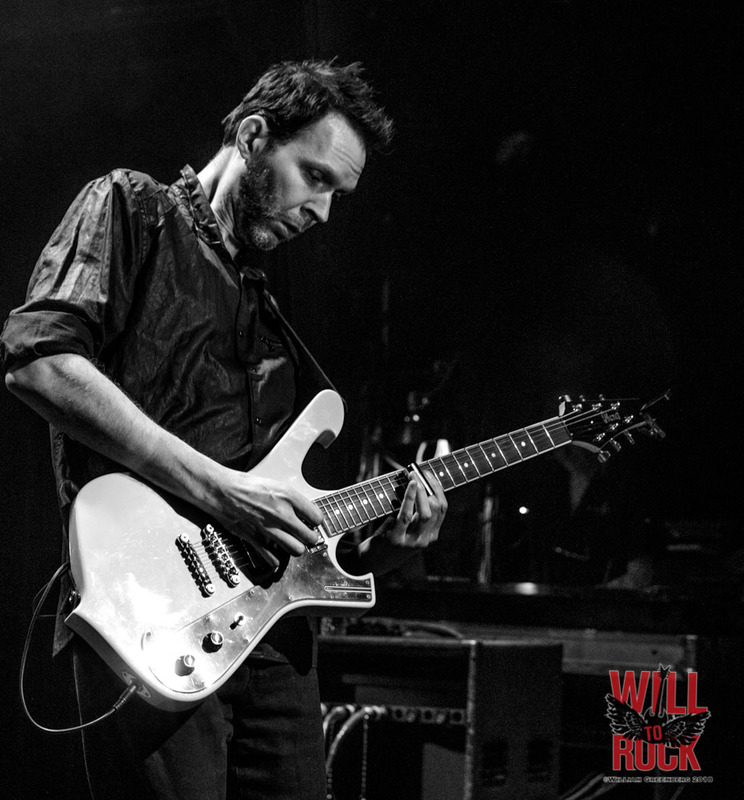 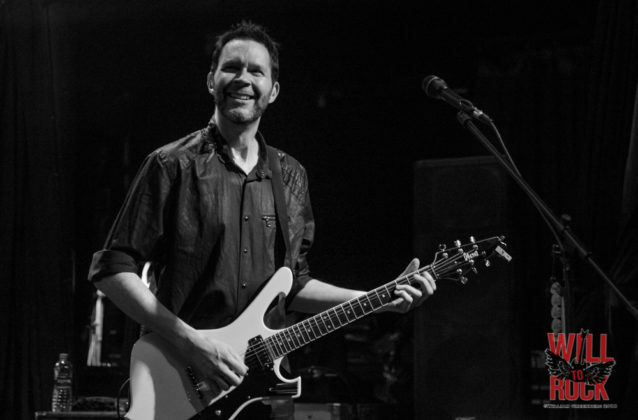 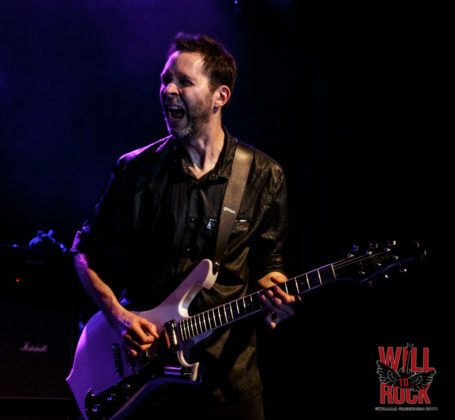 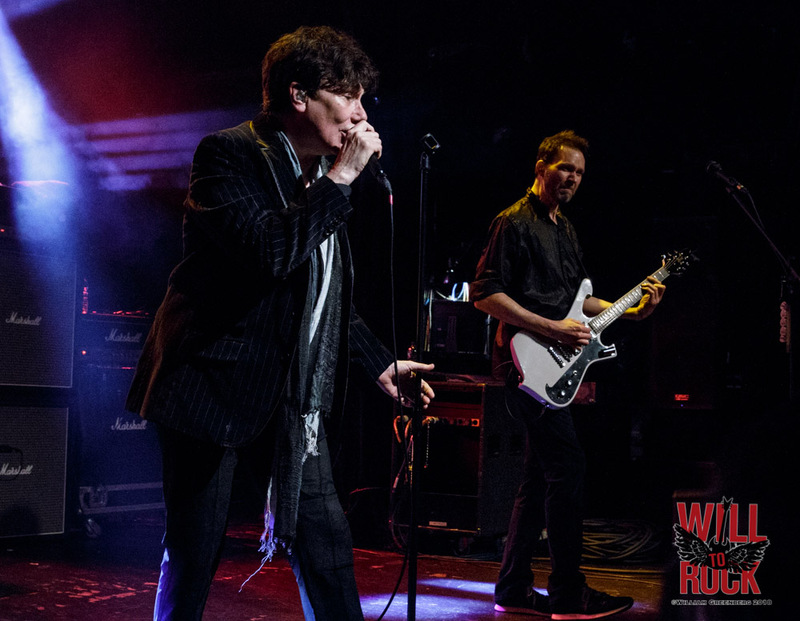 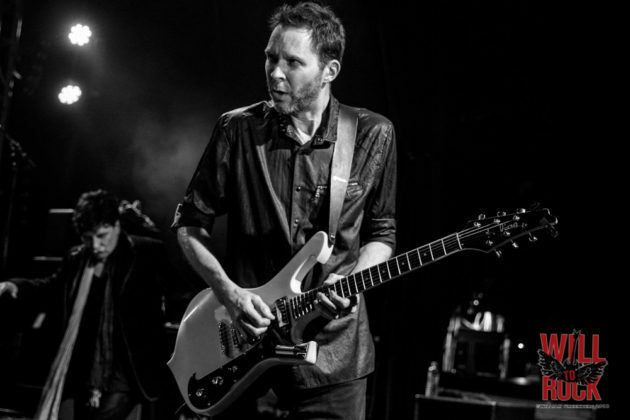 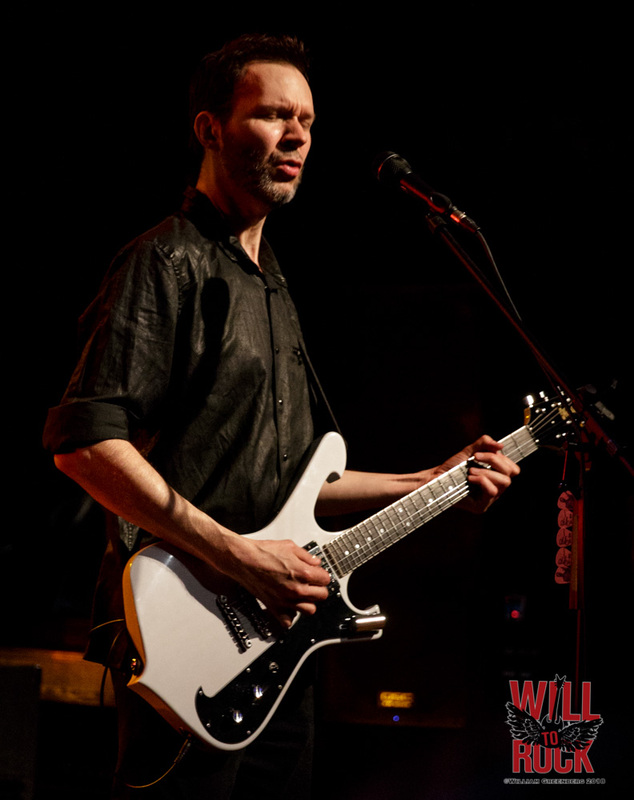 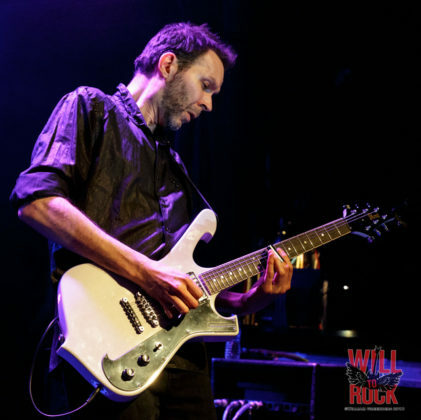 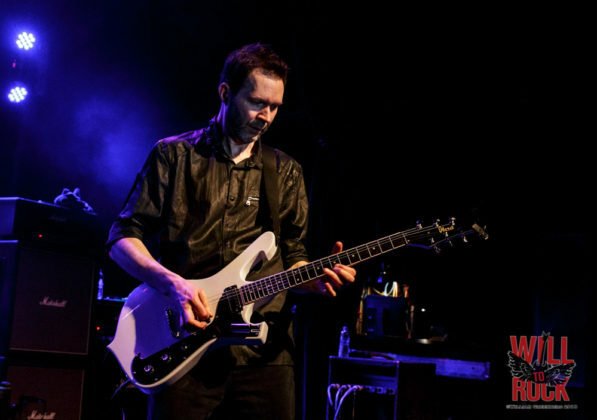 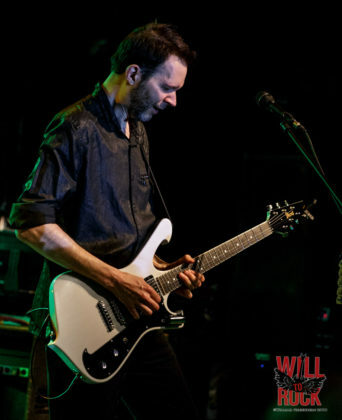 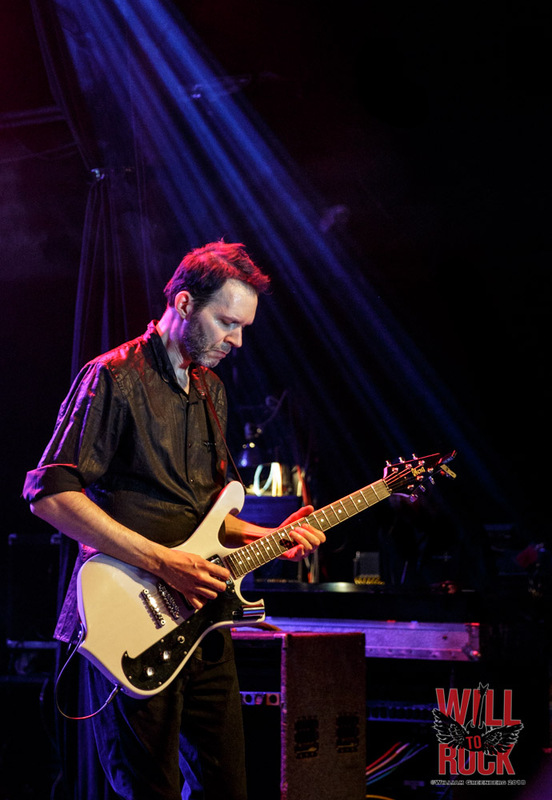 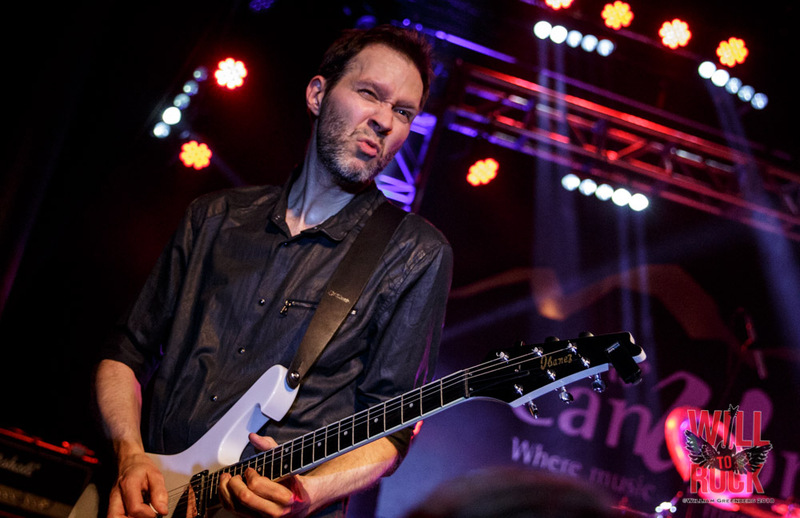 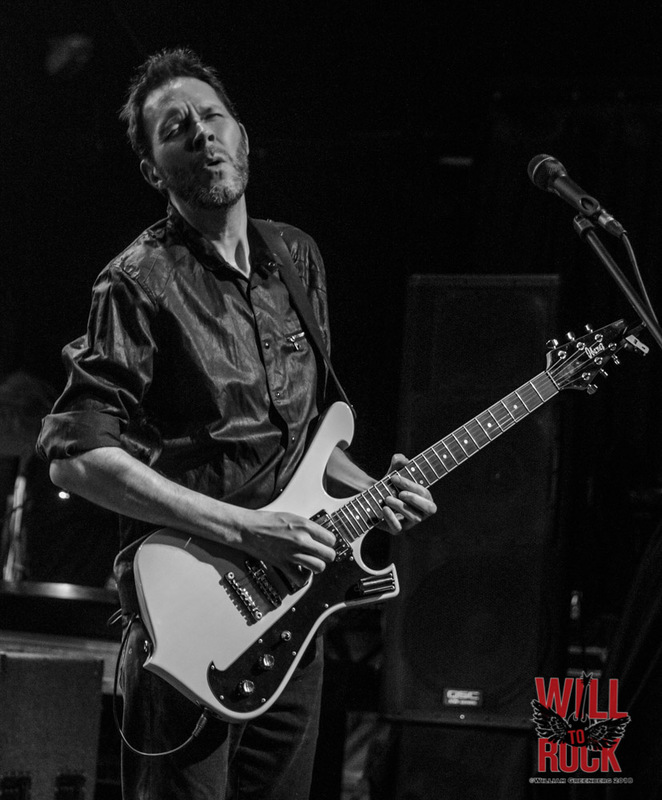 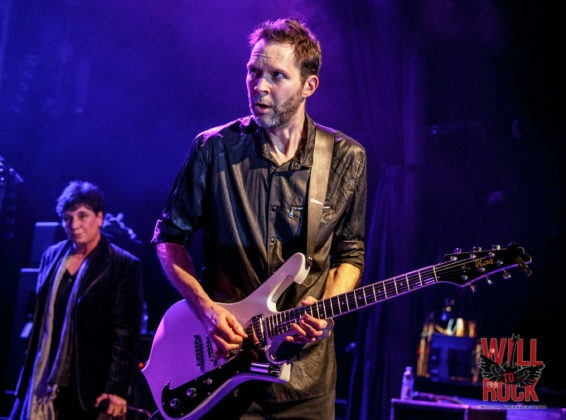 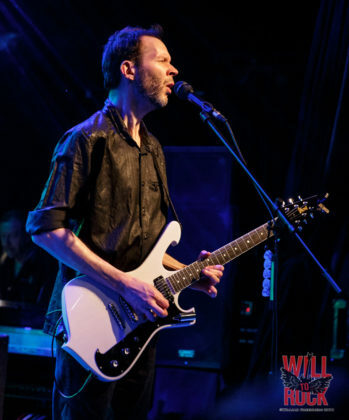 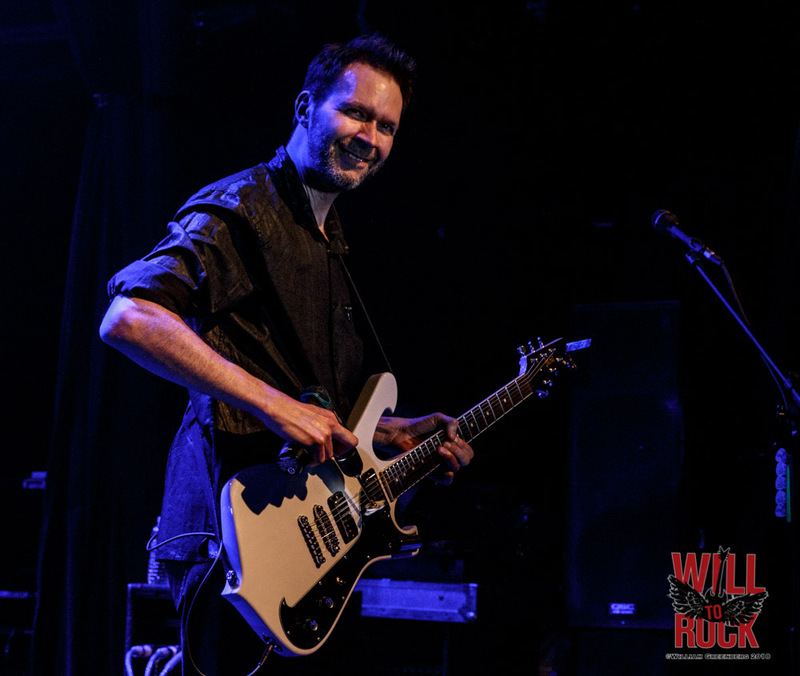 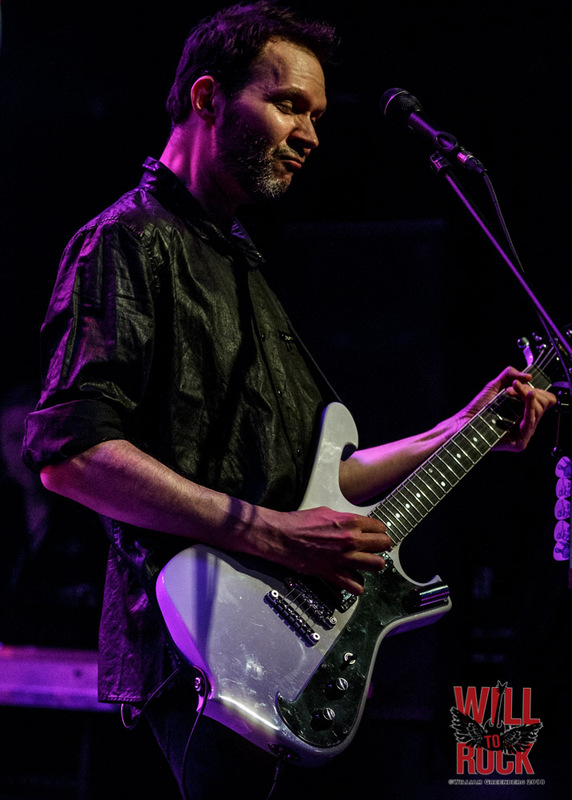 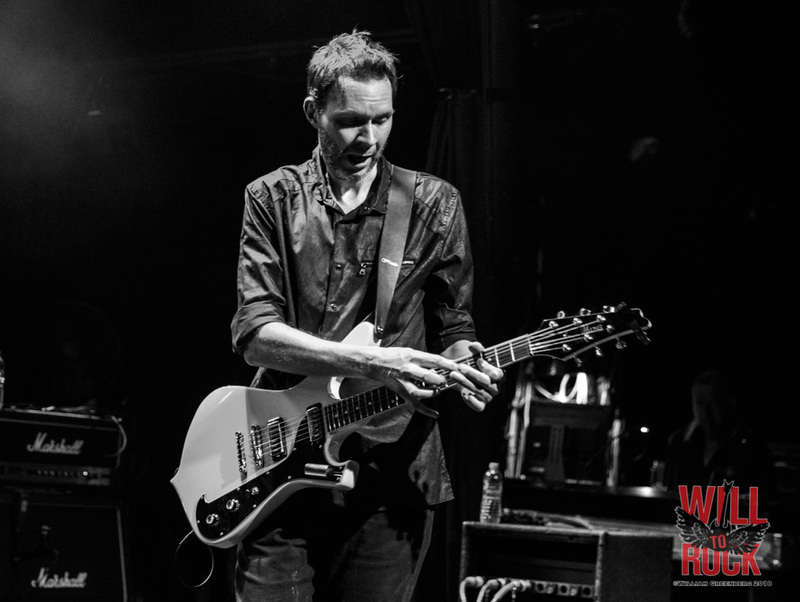 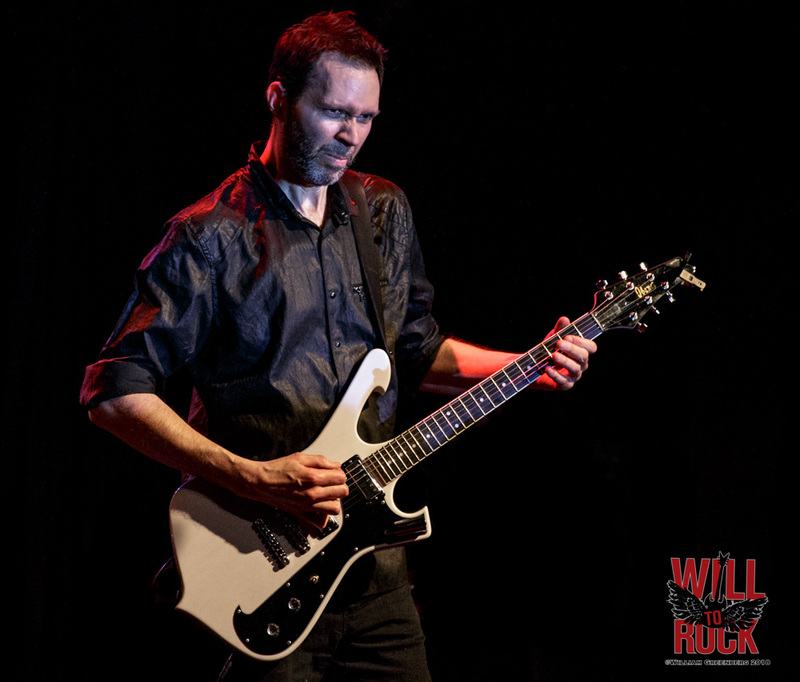 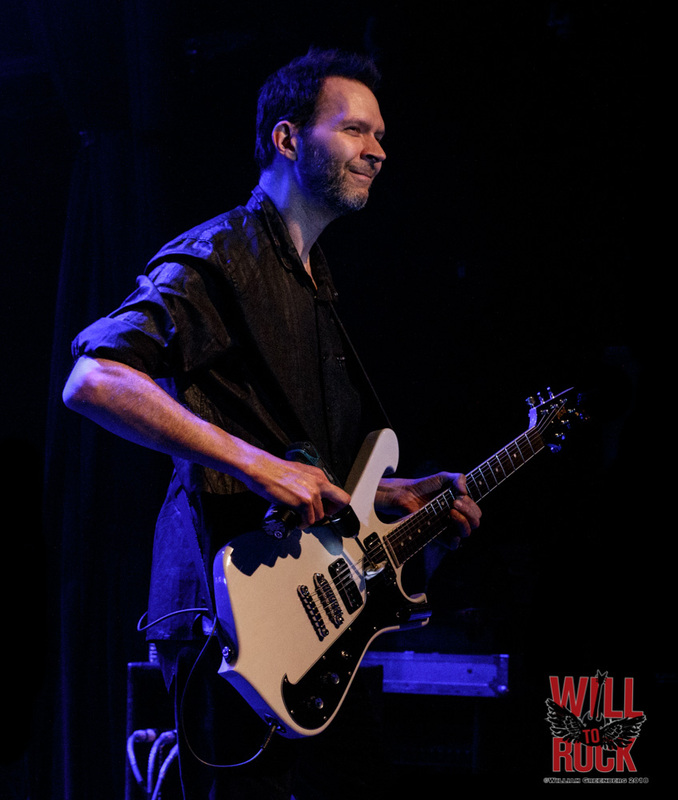 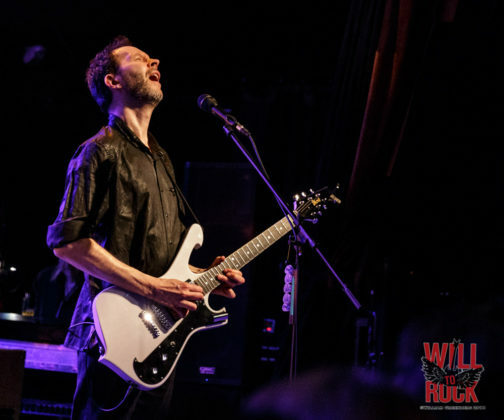 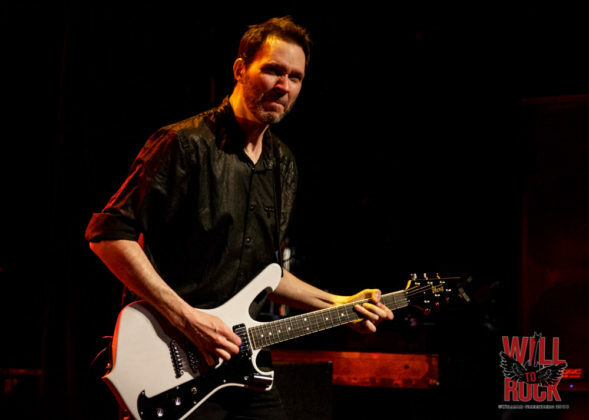 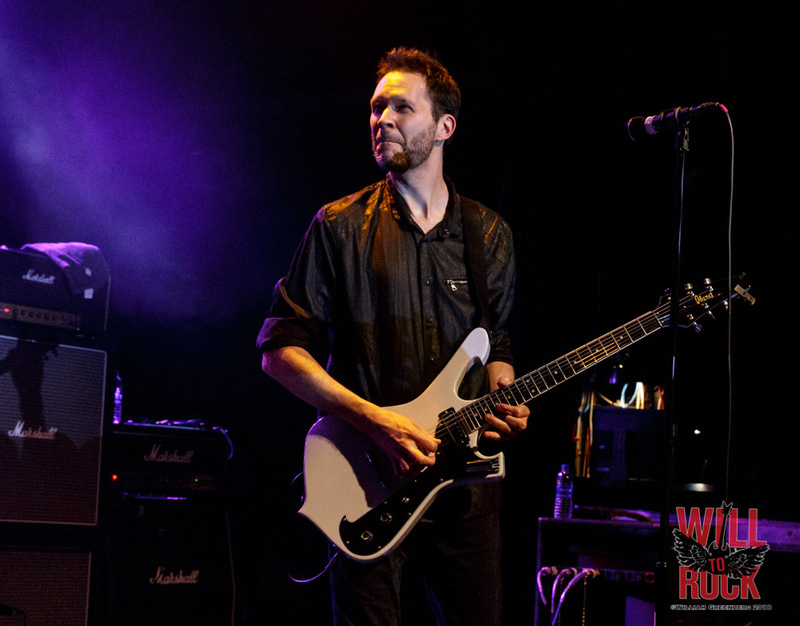 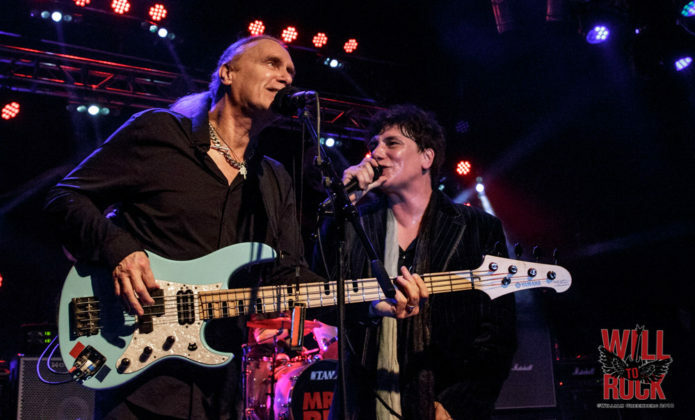 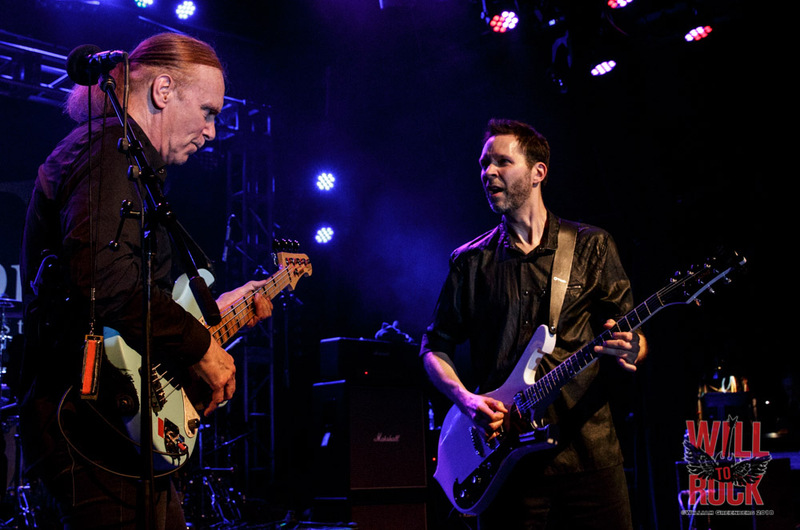 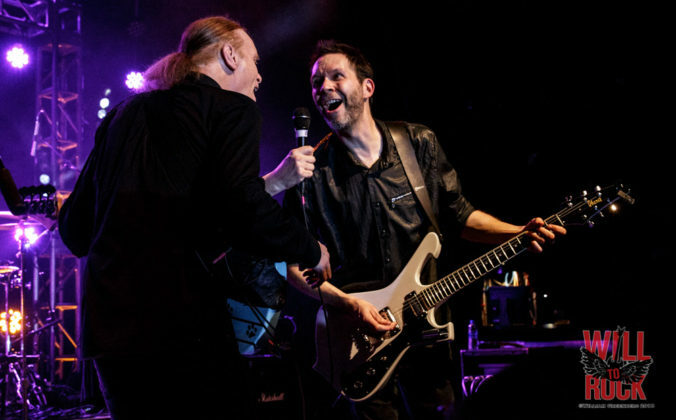 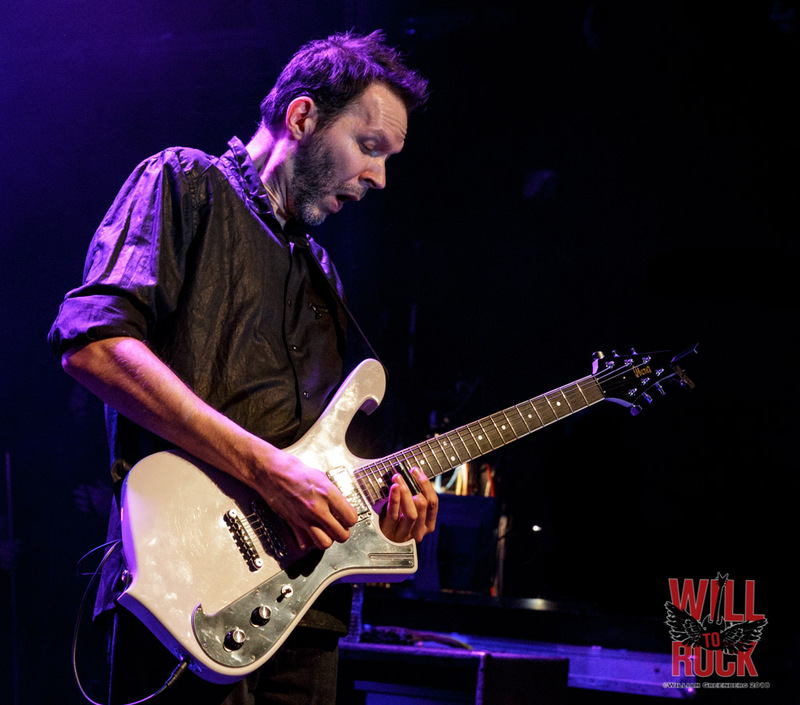 Eric Martin, Paul Gilbert, Billy Sheehan and Matt Starr put on a hell of a show in honor of their late bandmate. 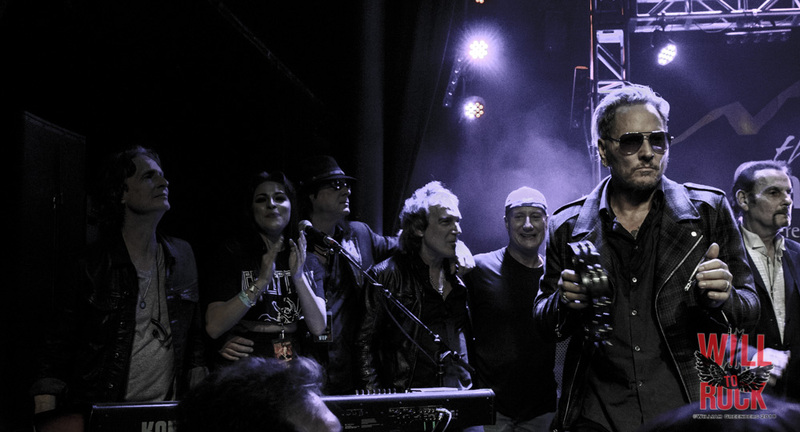 It wasn’t a solemn occasion; they rocked in his memory. The energy from the crowd, that included a large contingent who came all the way from Japan just for this show, was electric. The band sounded amazing and they played their hearts out. 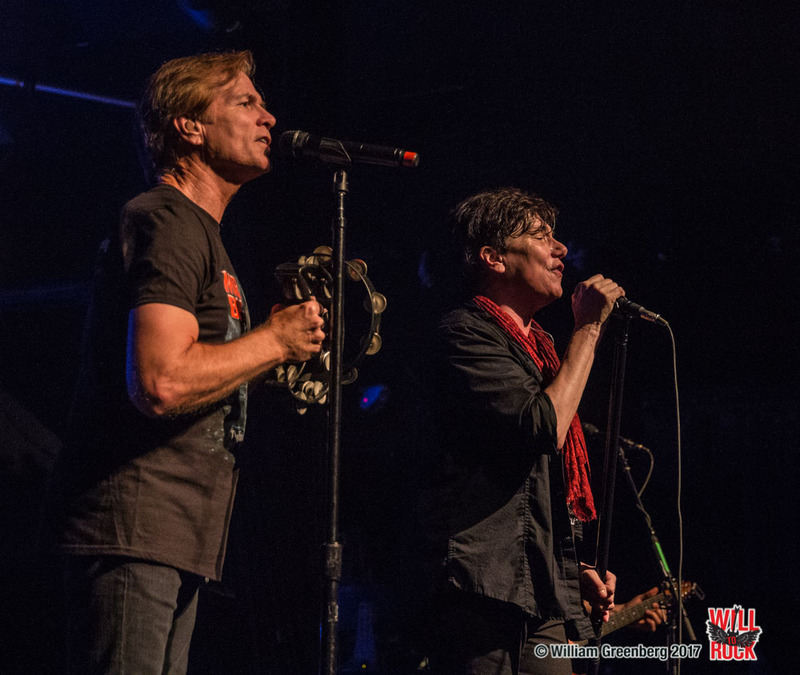 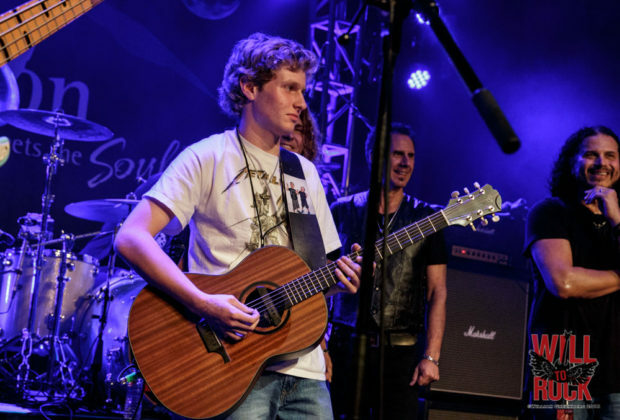 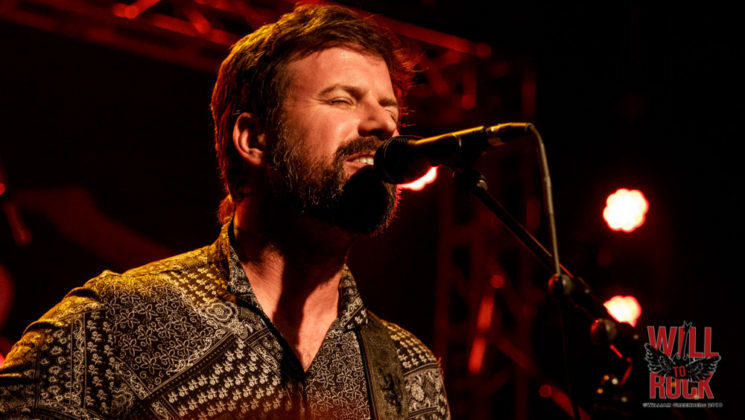 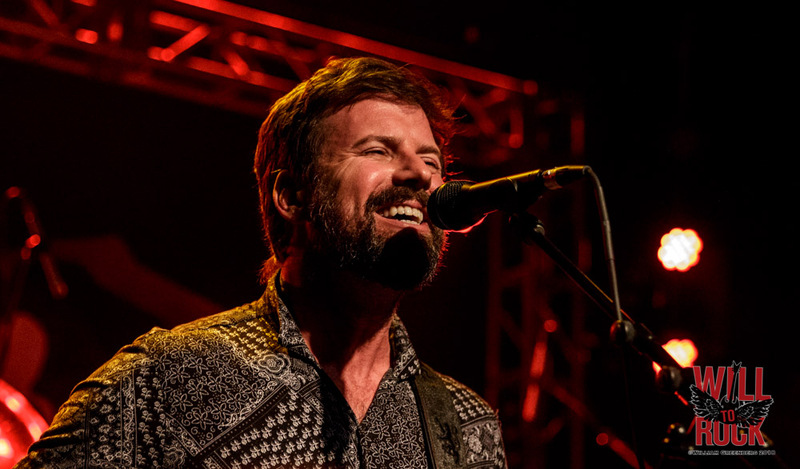 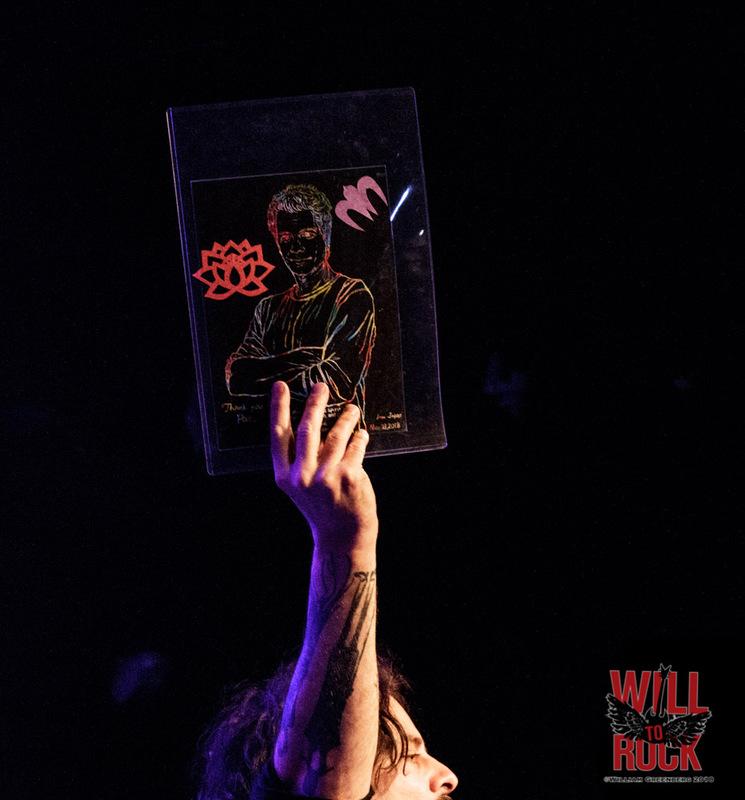 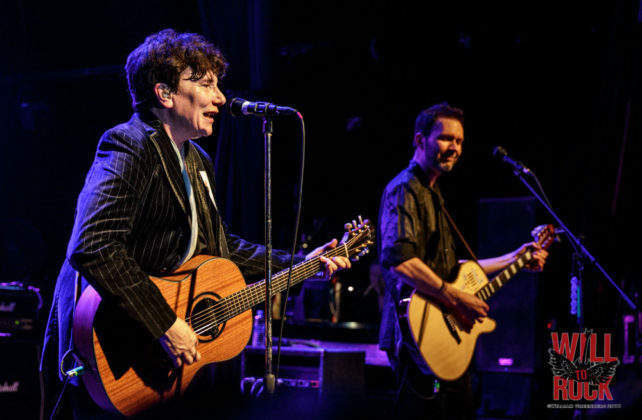 Eric and Billy took time through the show to offer some memories of Pat…How they met, favorite songs, tour stories, how dedicated Pat was to his family and friends; All of it making this show a little more intimate and certainly a very worthy tribute. 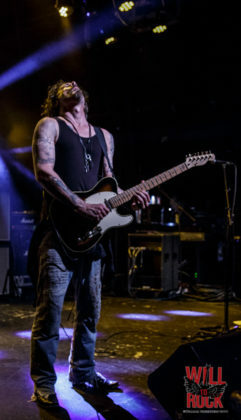 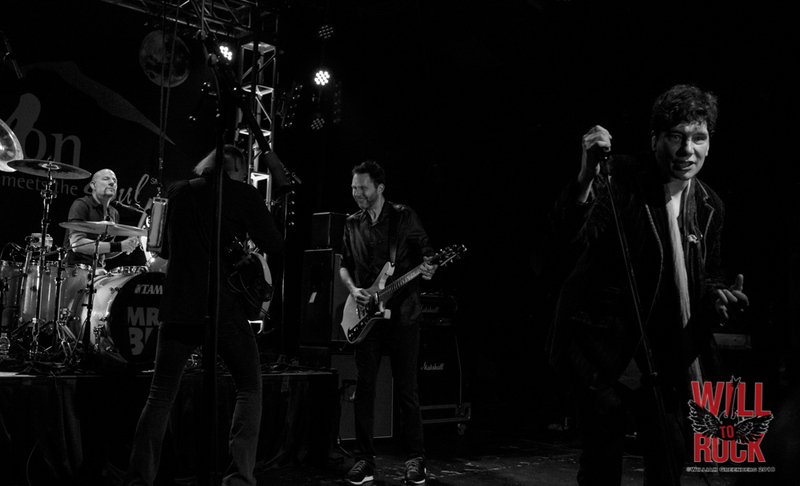 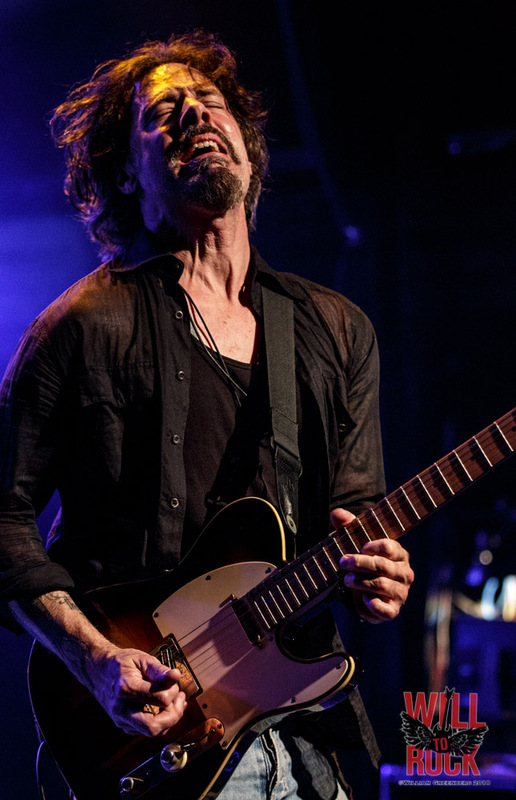 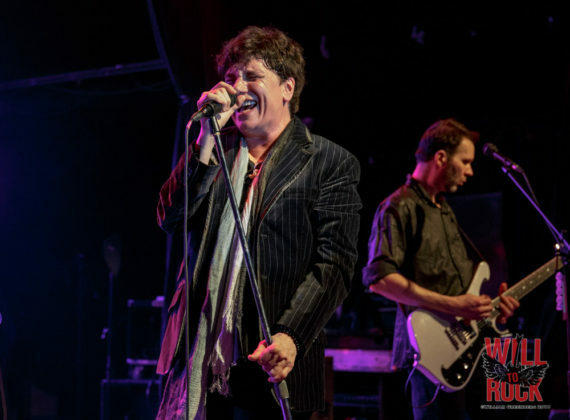 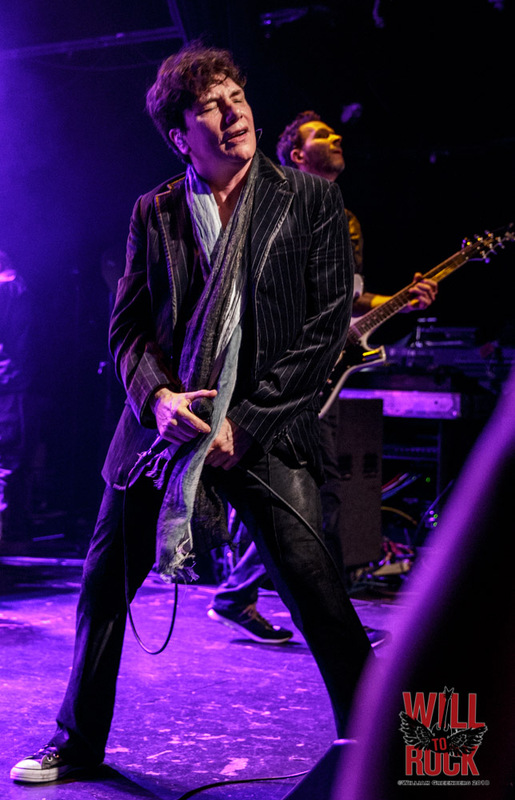 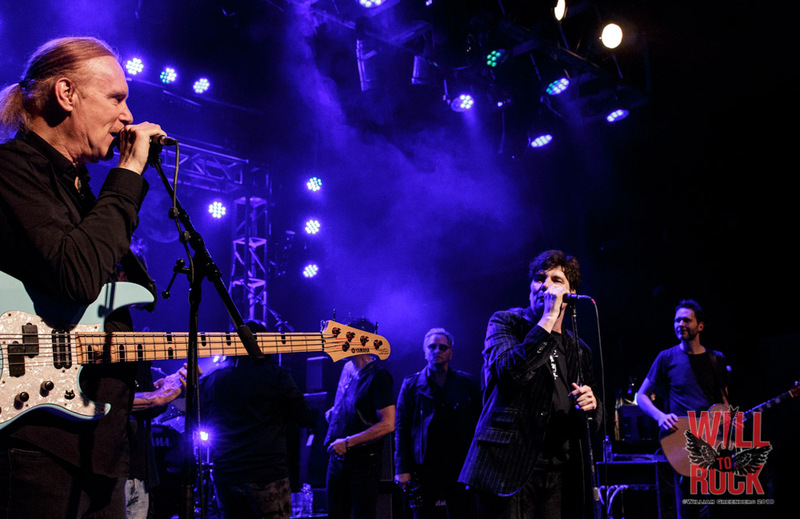 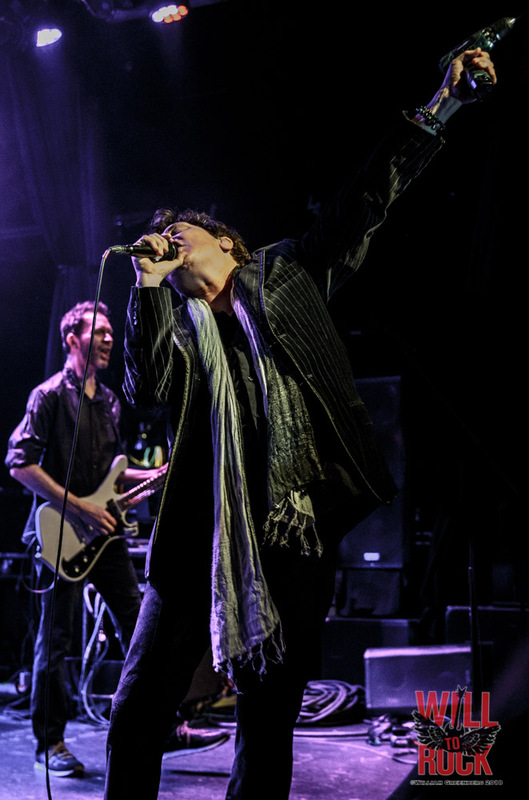 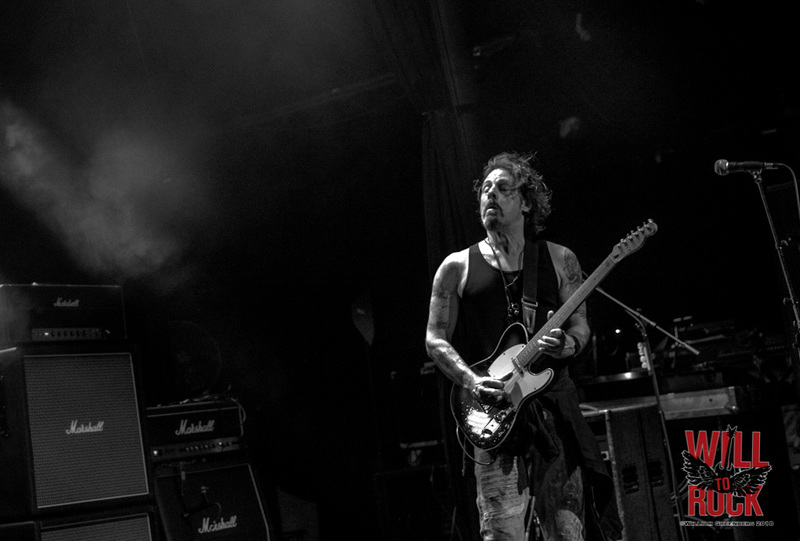 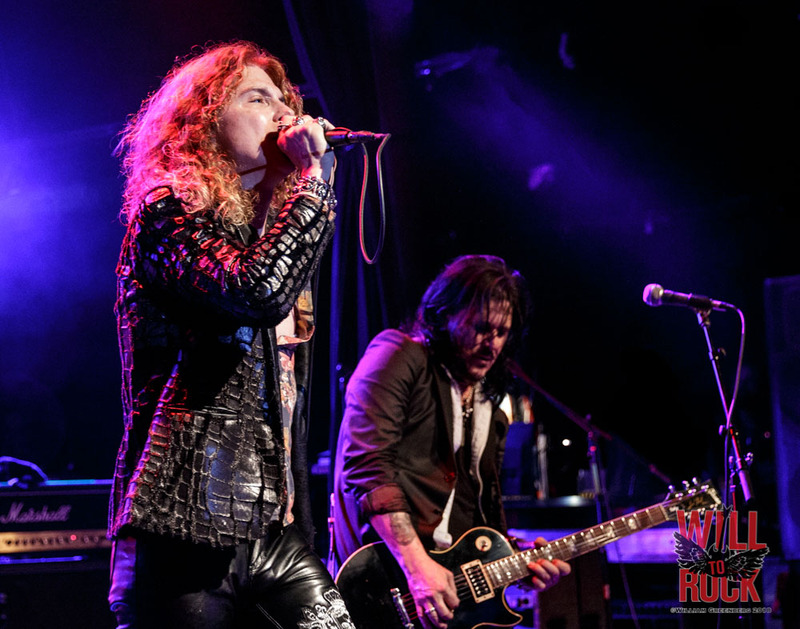 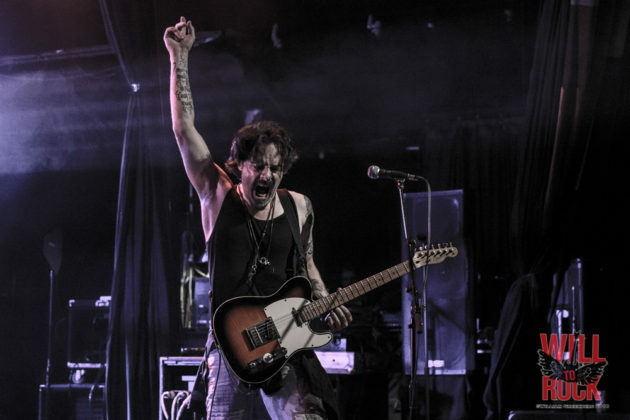 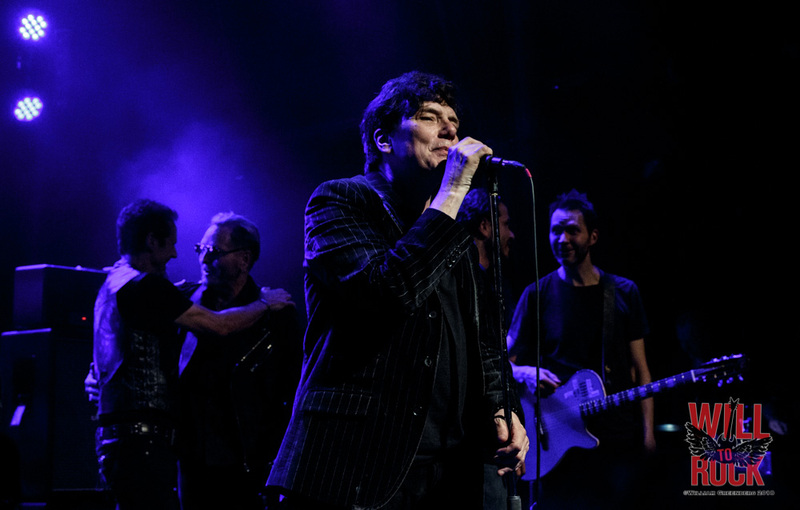 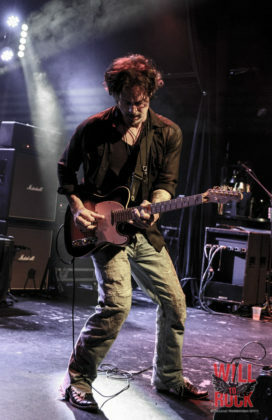 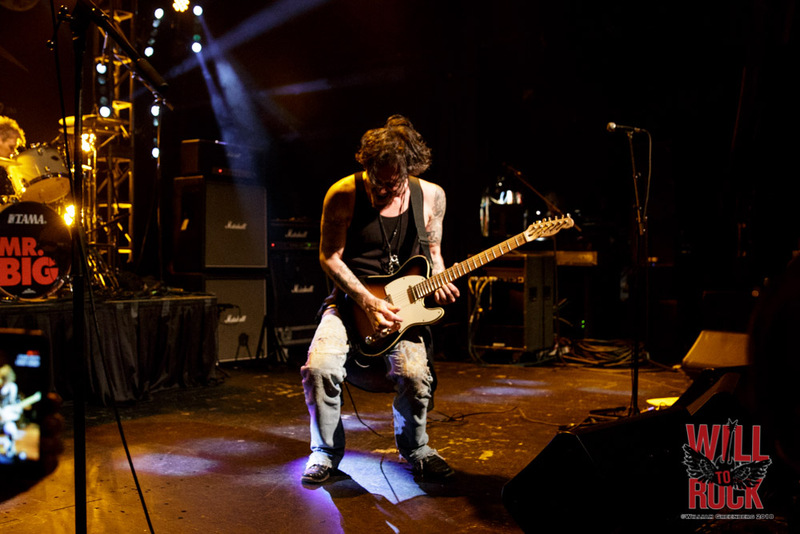 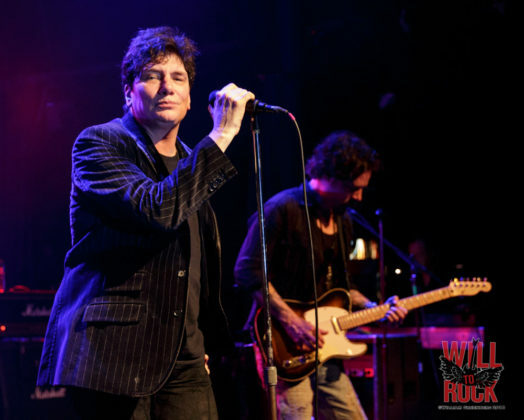 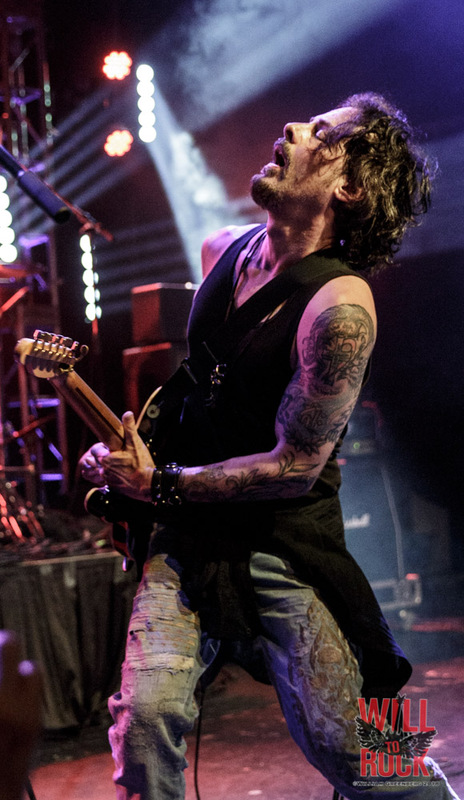 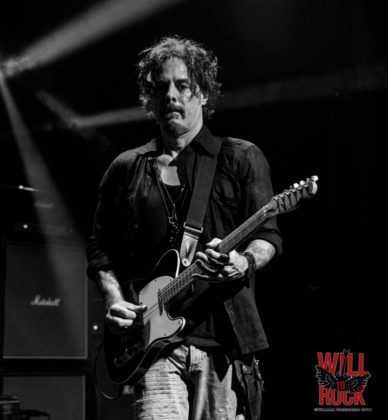 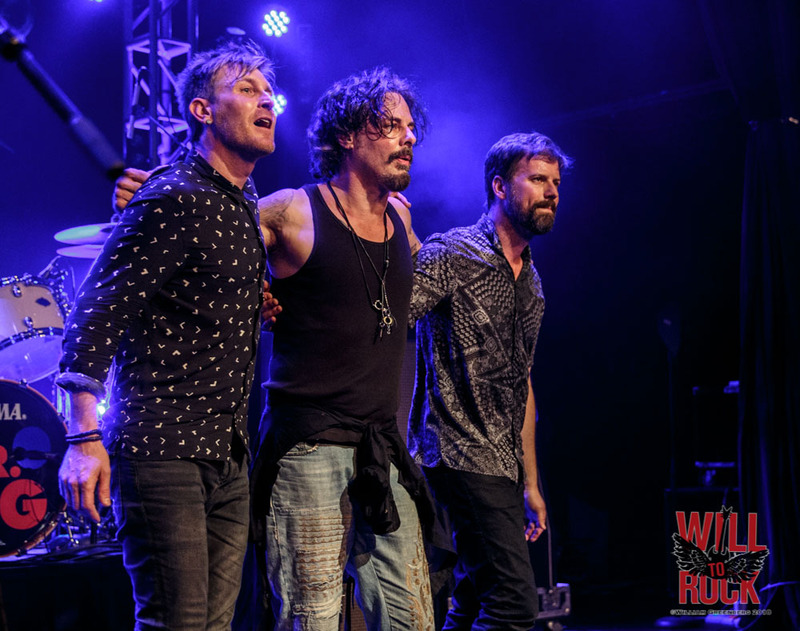 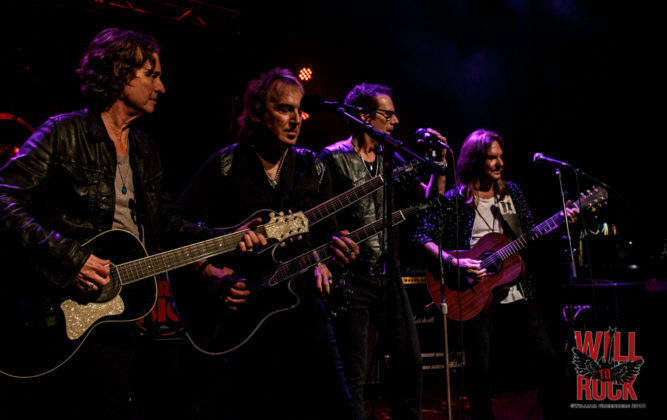 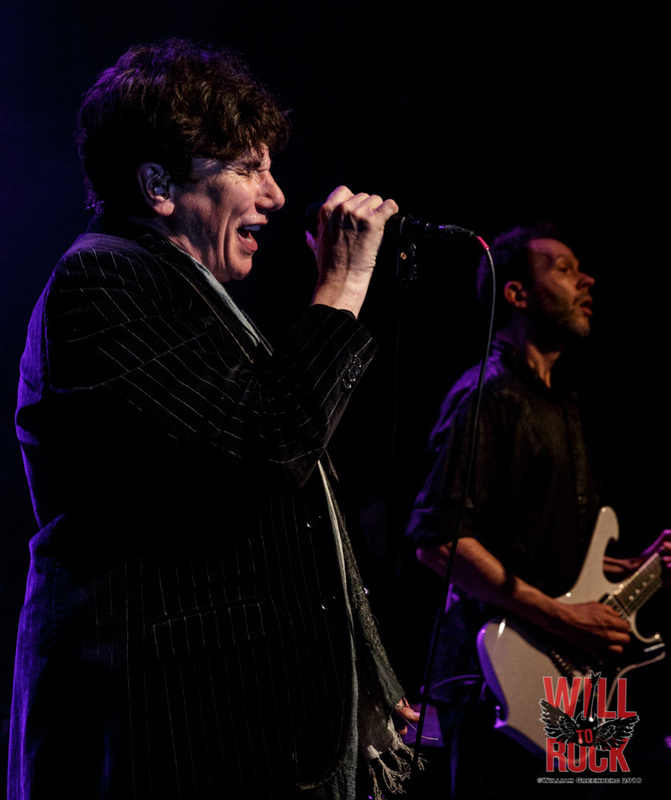 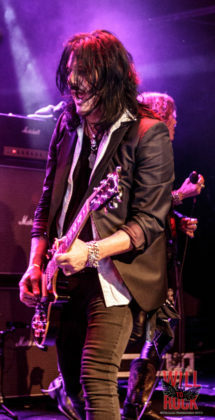 After the main set concluded, Former Mr. Big guitarist, Richie Kotzen (and along with Sheehan, a current “Winery Dog“), joined Eric, Billy and Matt on “Shine” from his second album with the band, “Actual Size“, and then 2 songs, “Dancin’ With My Devils” and “Superfantastic” from their first collaboration on “Get Over It“. Pat spent some time playing with “The Knack” and Prescott Niles (bass) with family members Gabe and Liv, along with Matt Starr on vocals played their biggest hit, “My Sharona“. 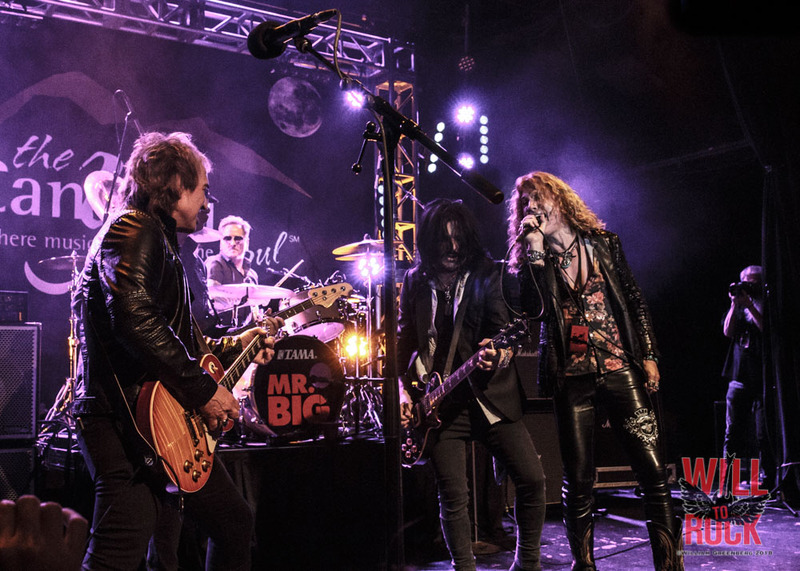 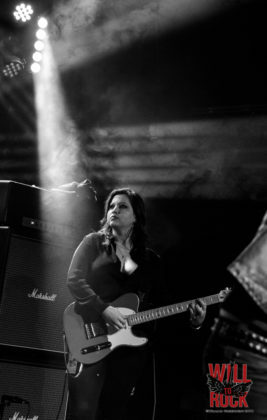 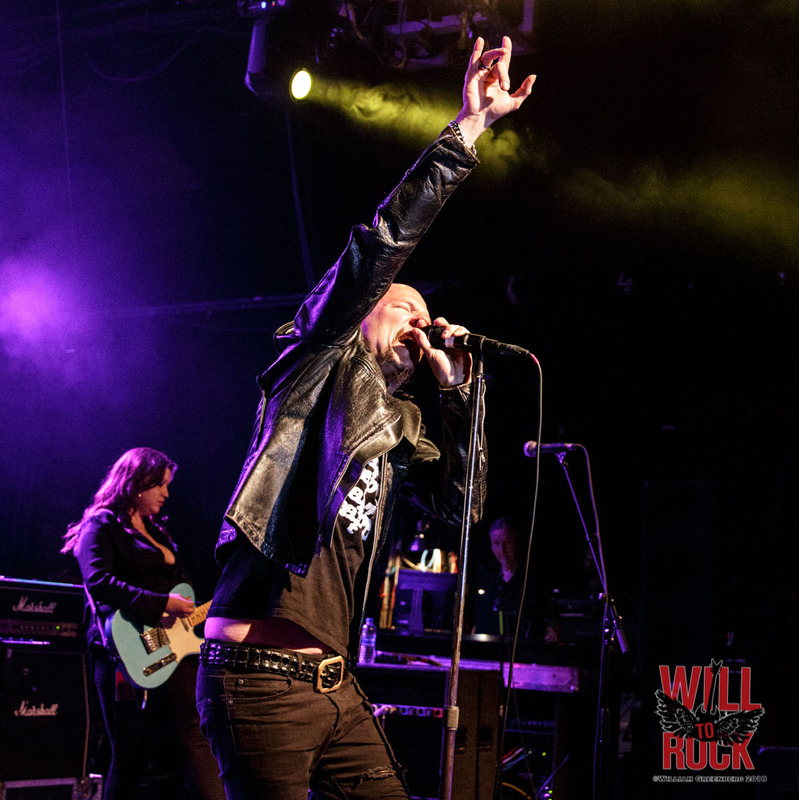 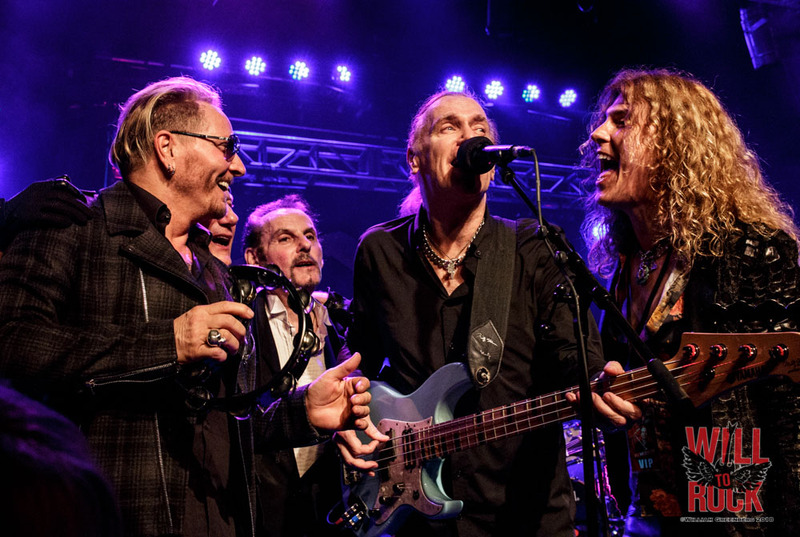 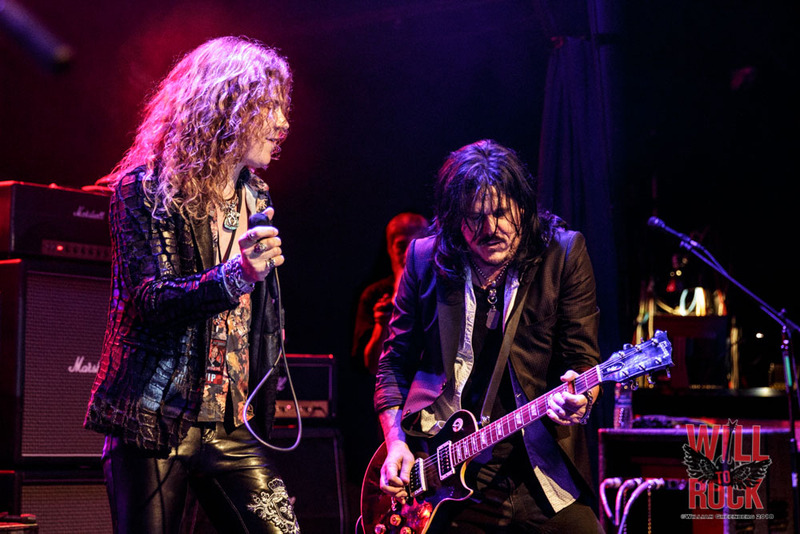 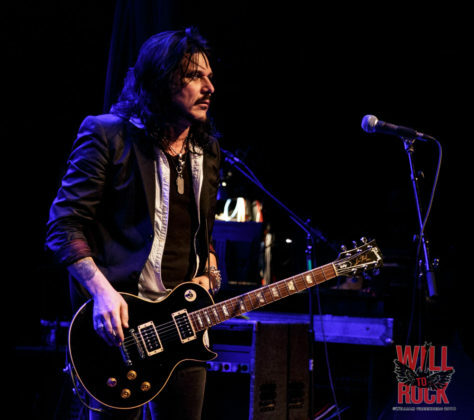 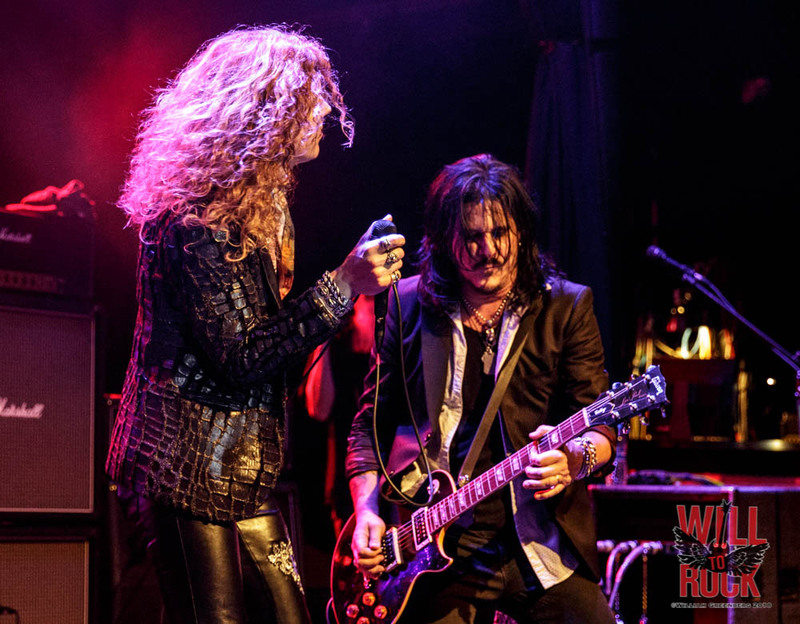 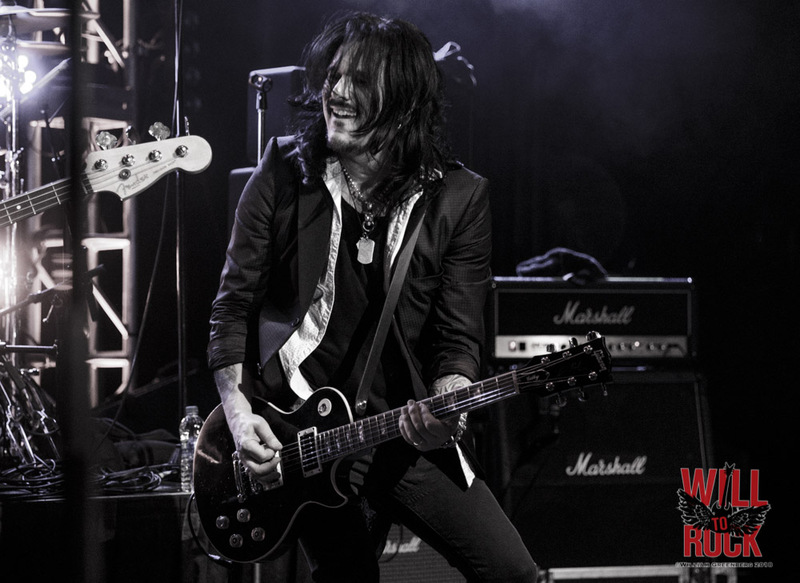 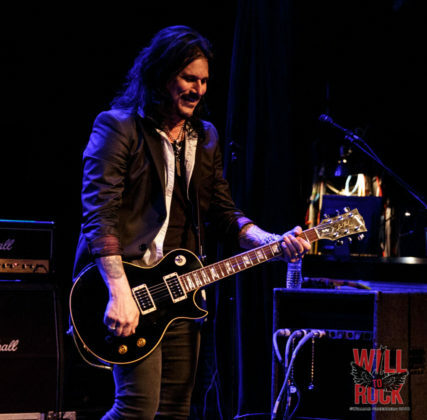 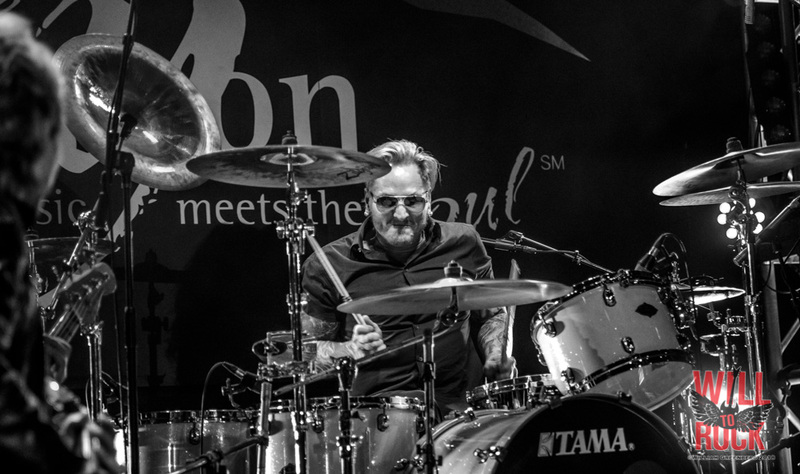 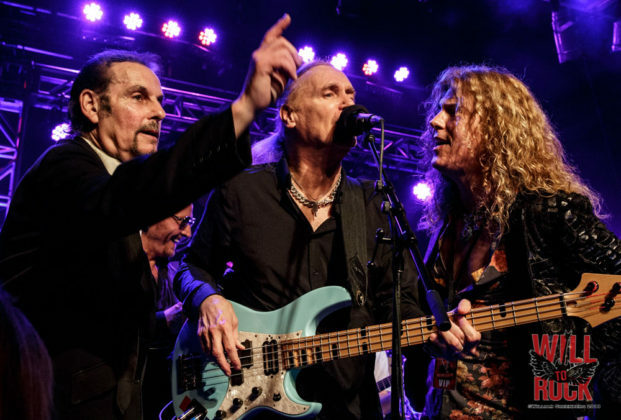 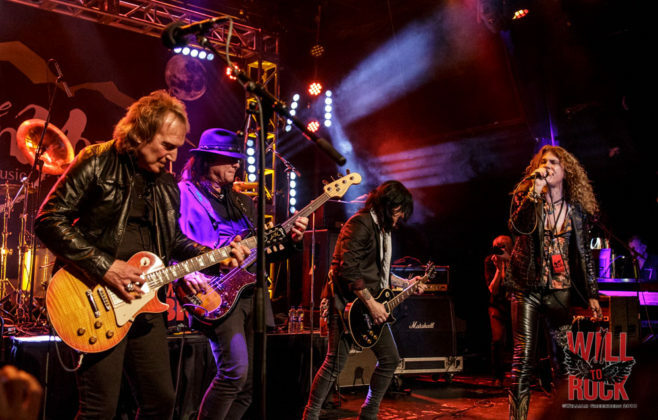 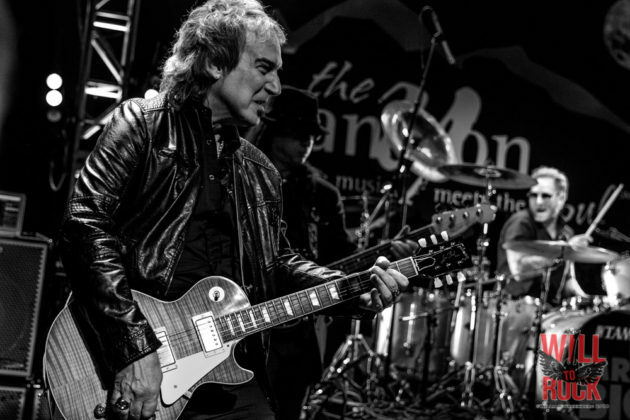 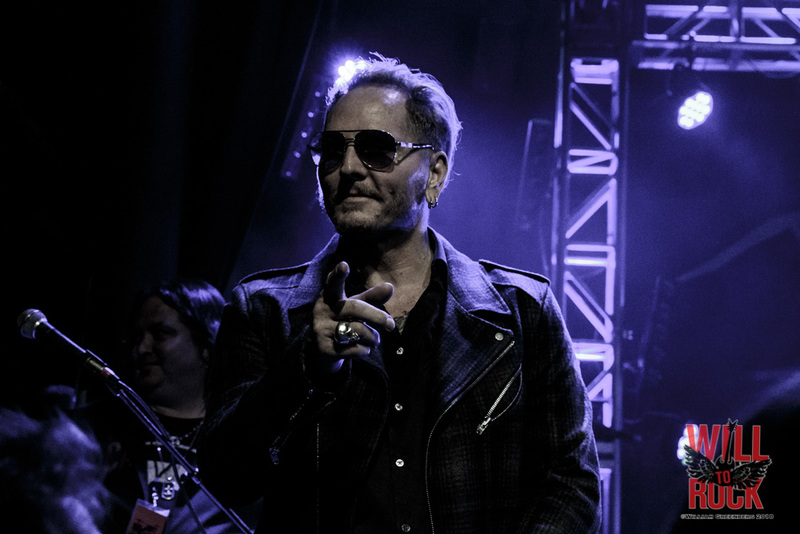 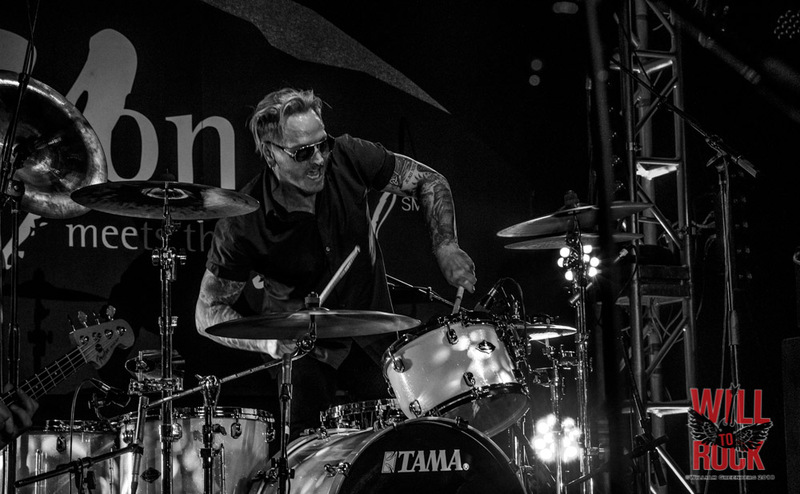 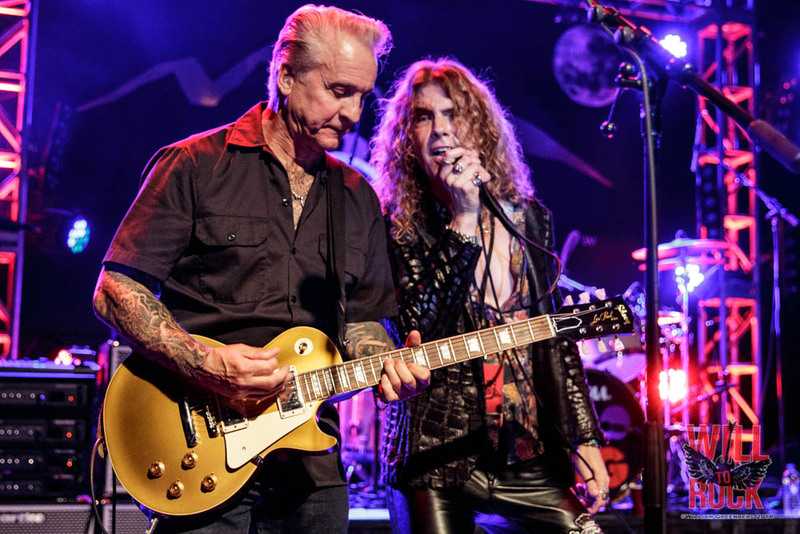 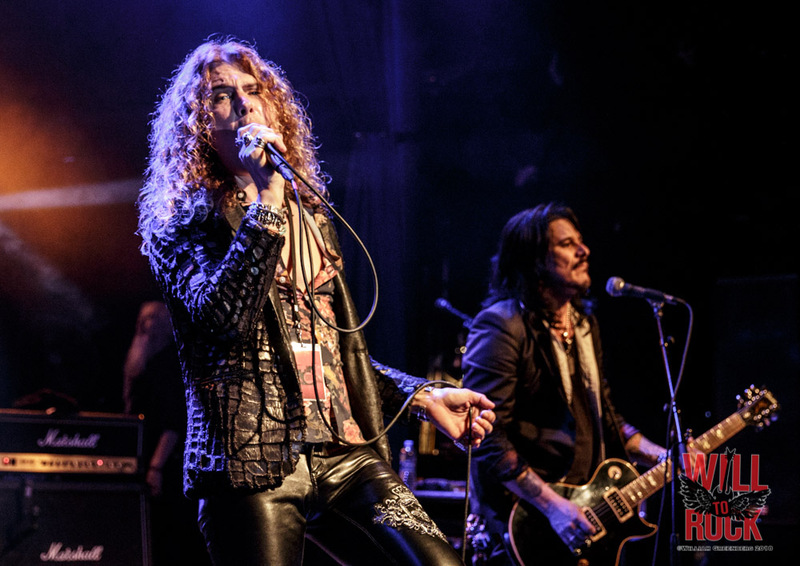 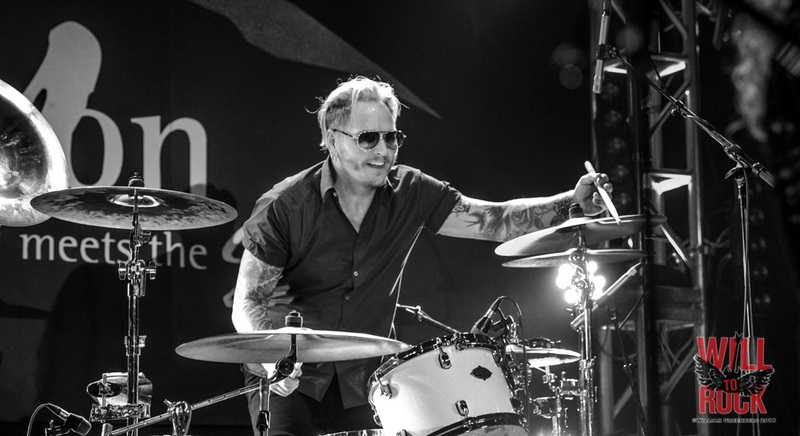 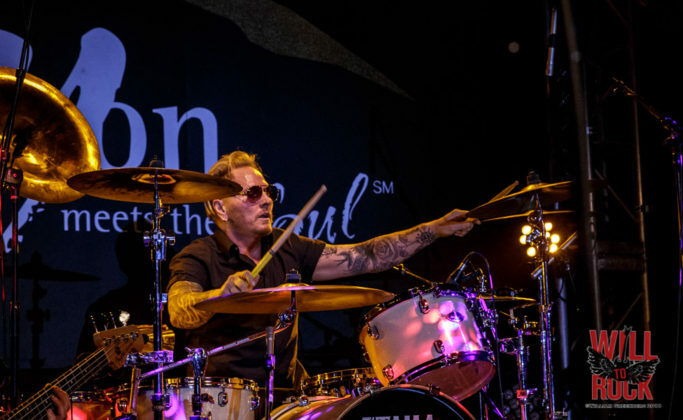 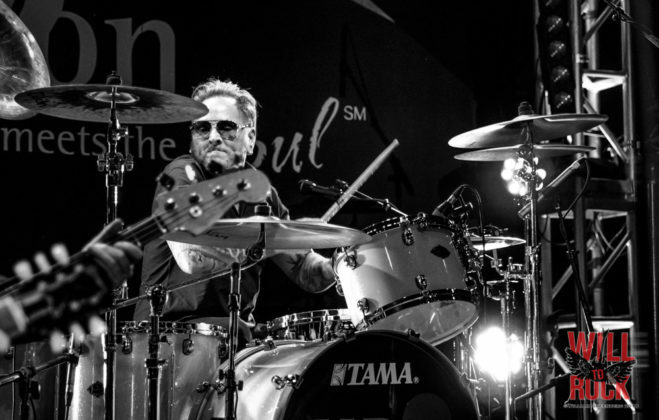 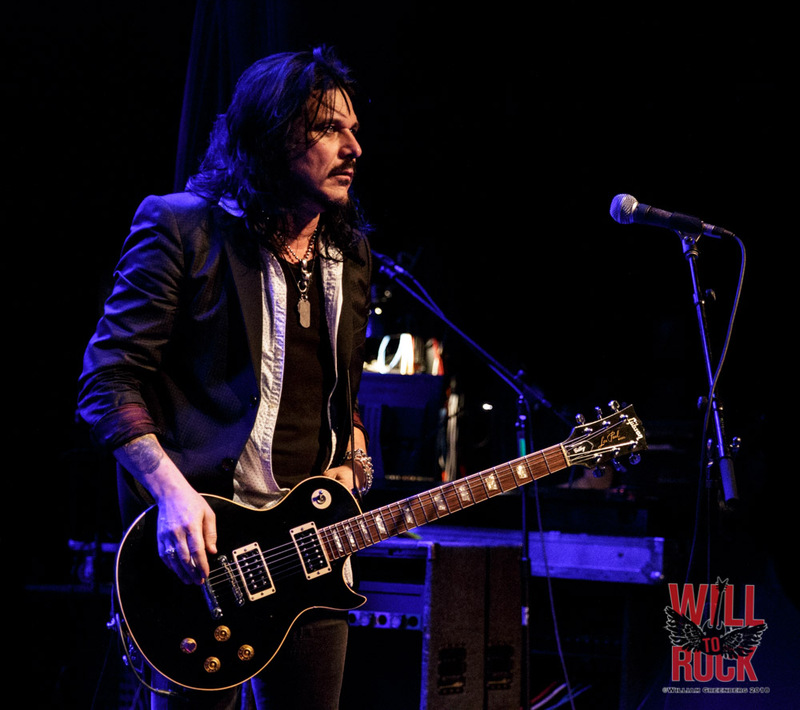 Also showing up to play and honor Pat were Matt Sorum (The Cult, Guns N Roses), Gilby Clarke (Guns ‘N Roses), Chuck Wright (Quiet Riot), Dave Amato (REO Speedwagon) and Keith St. John (Montrose) who jammed on some Zeppelin, Montrose and Hendrix tunes. 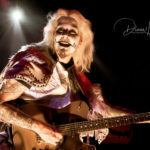 Friends of Pat, Neil Geraldo (Pat Benatar) and Myron Grombacher (Pat Benatar, Lita Ford) were joined by Billy and Keith St. John to take on The Beatles‘, “Helter Skelter”. 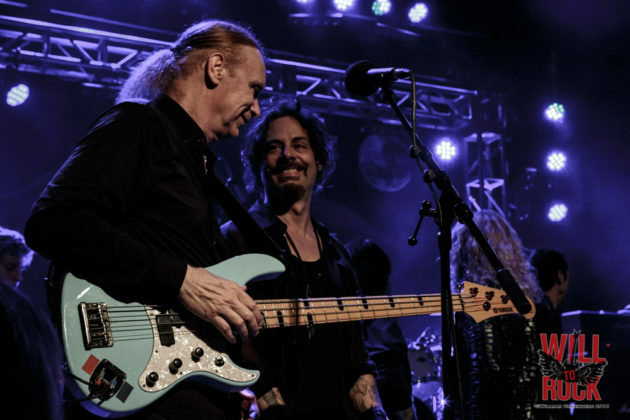 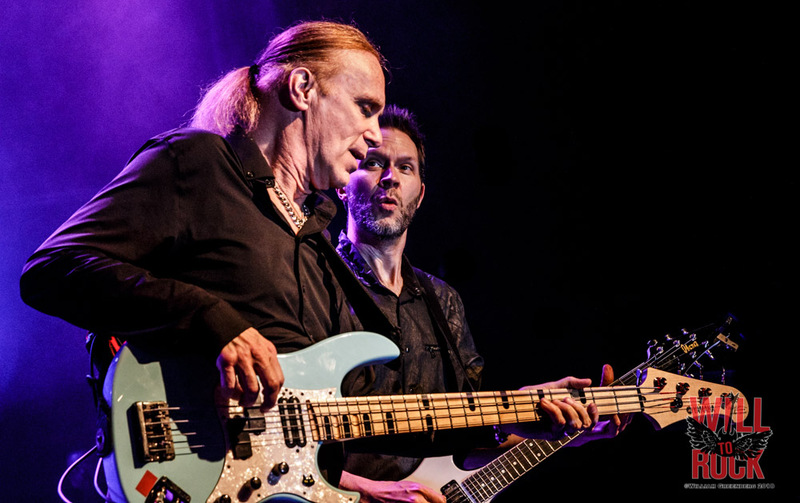 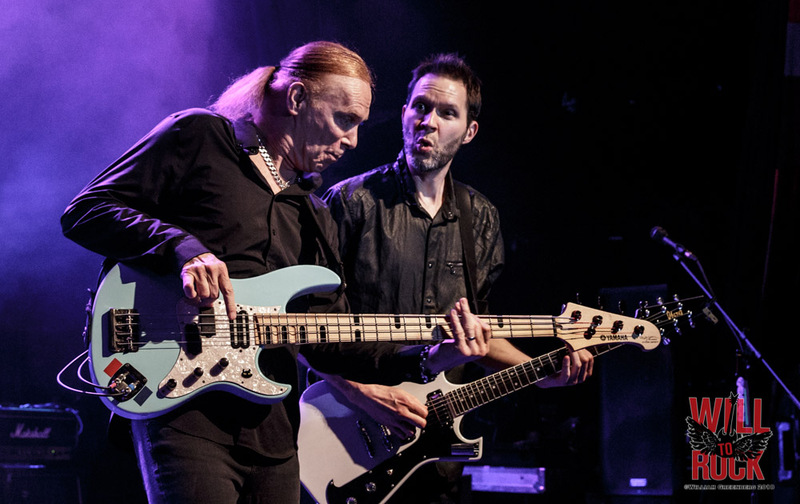 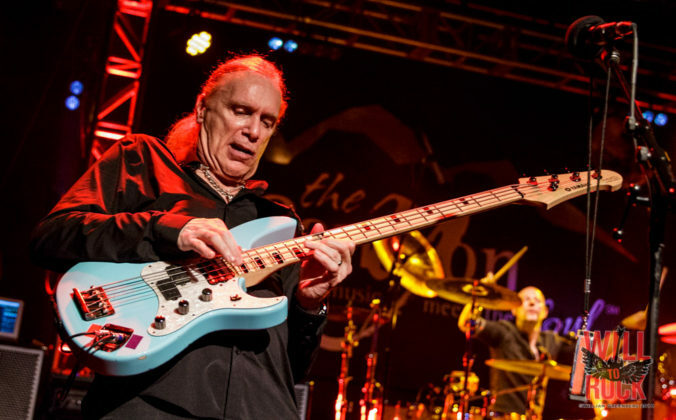 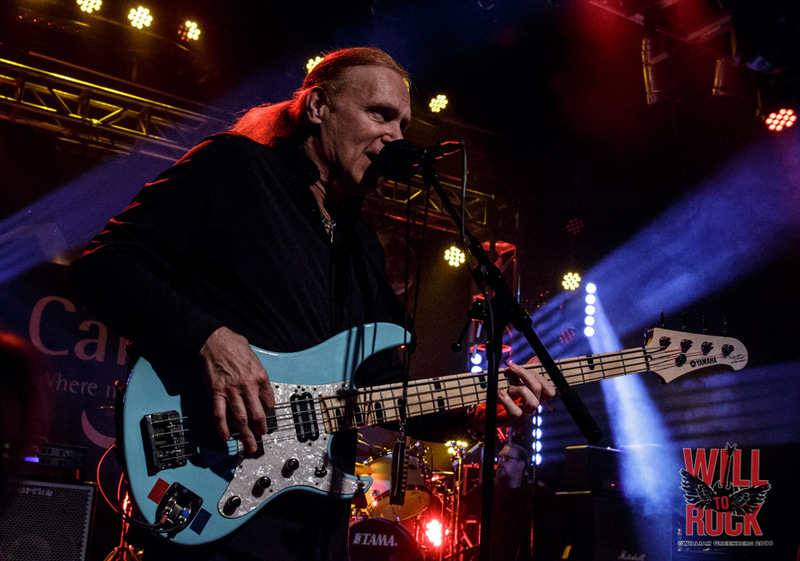 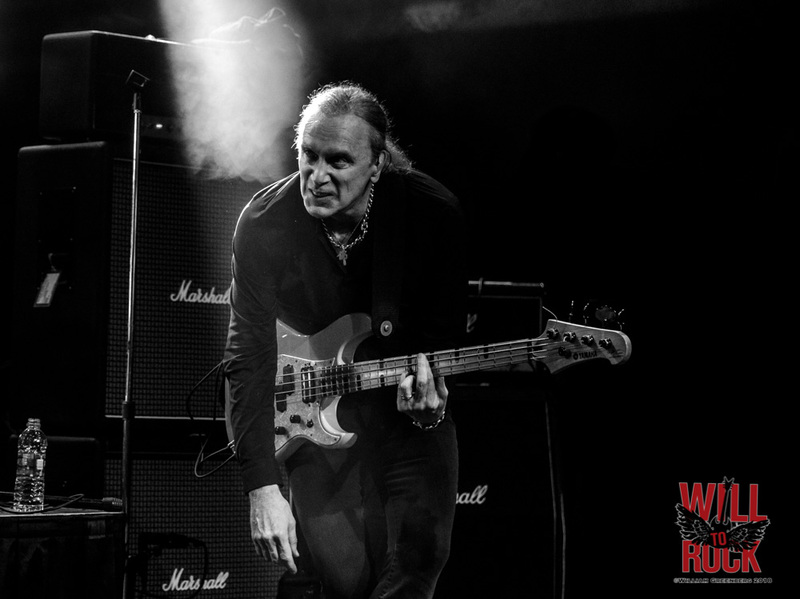 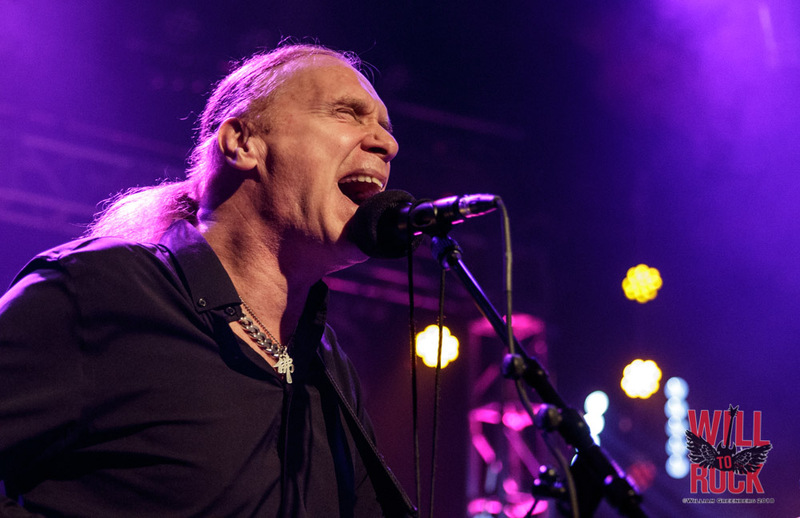 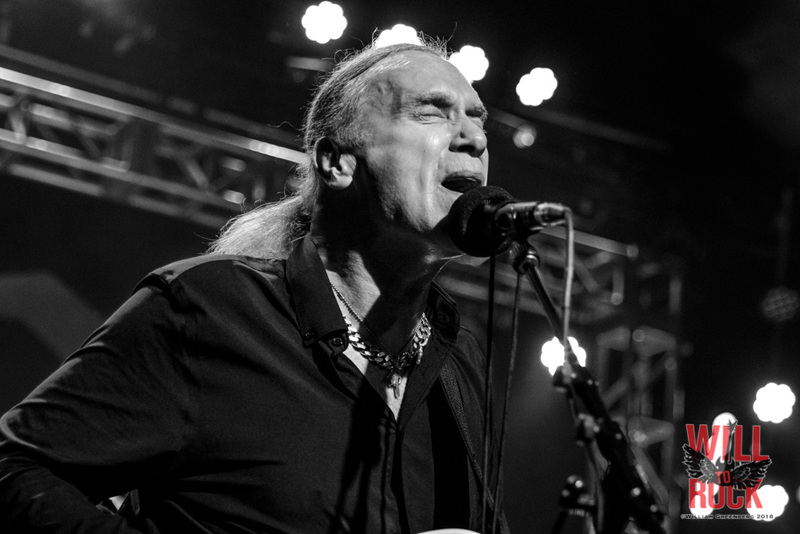 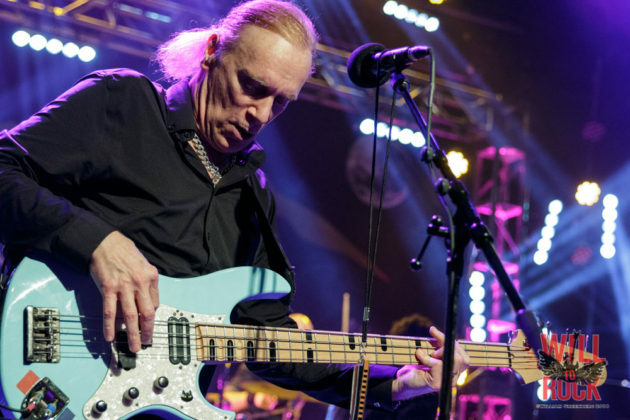 The reunions continued through the night, mostly centering around Billy Sheehan. 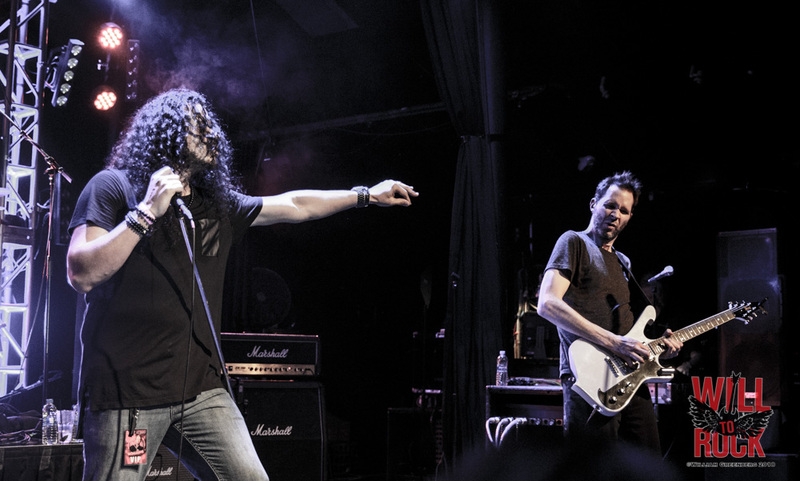 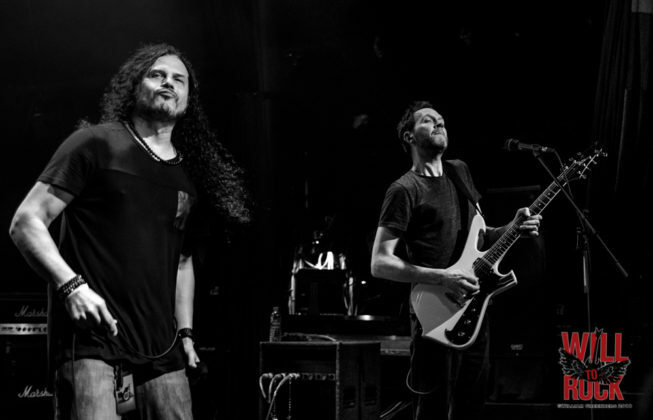 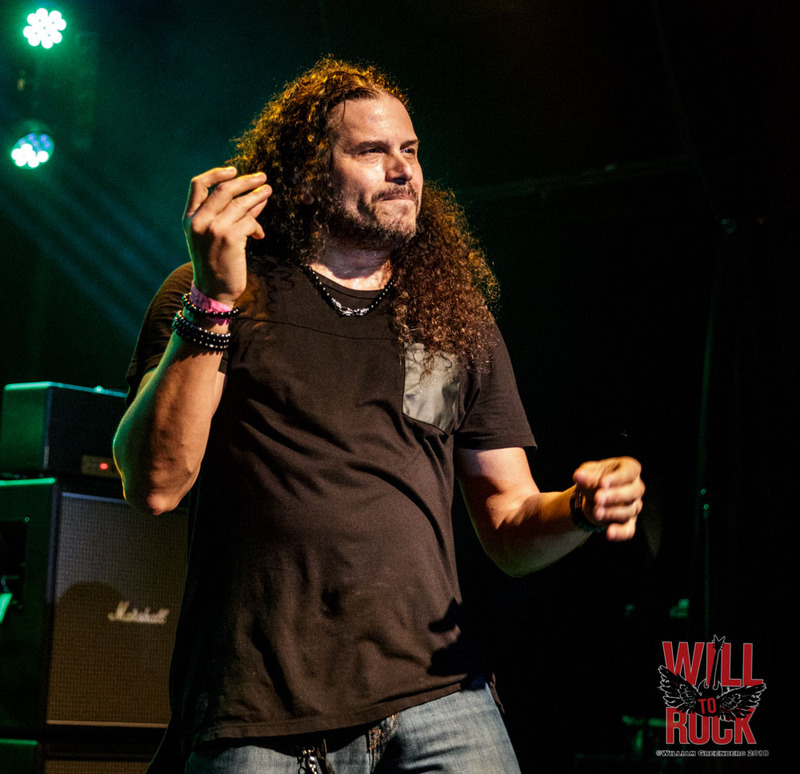 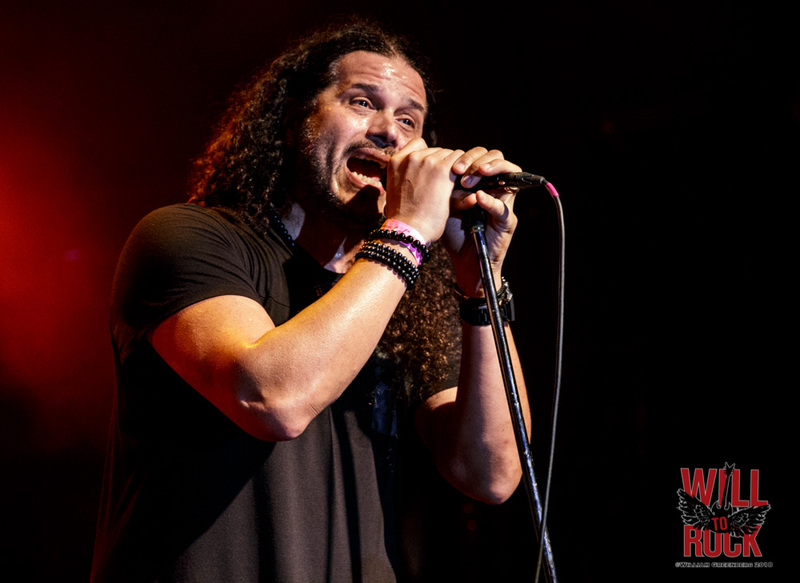 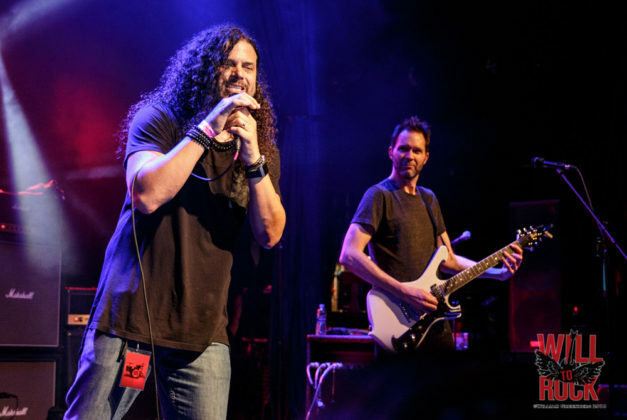 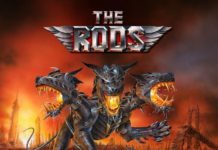 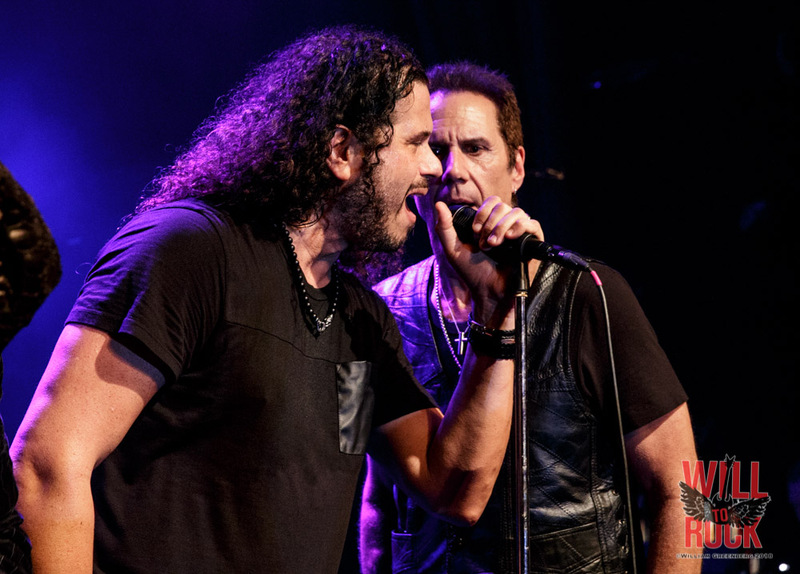 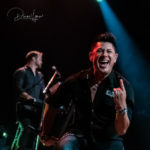 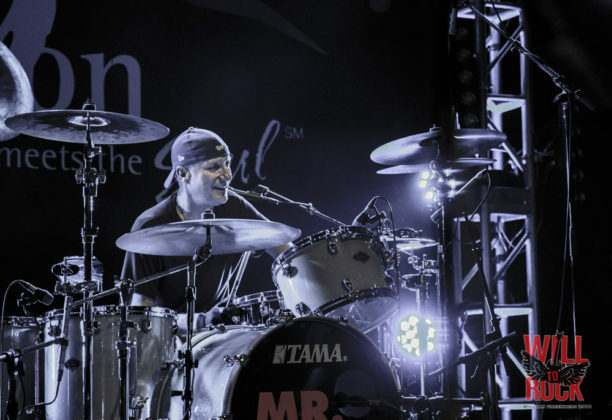 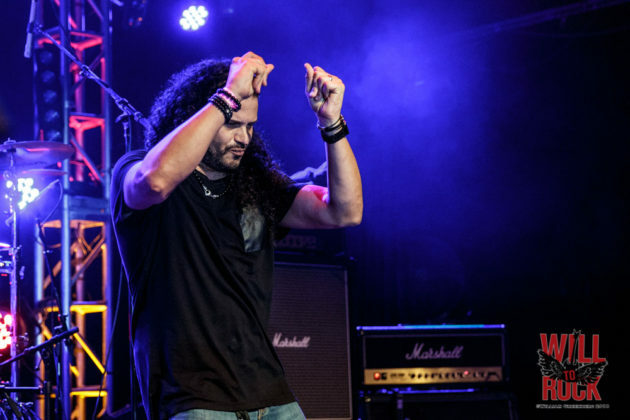 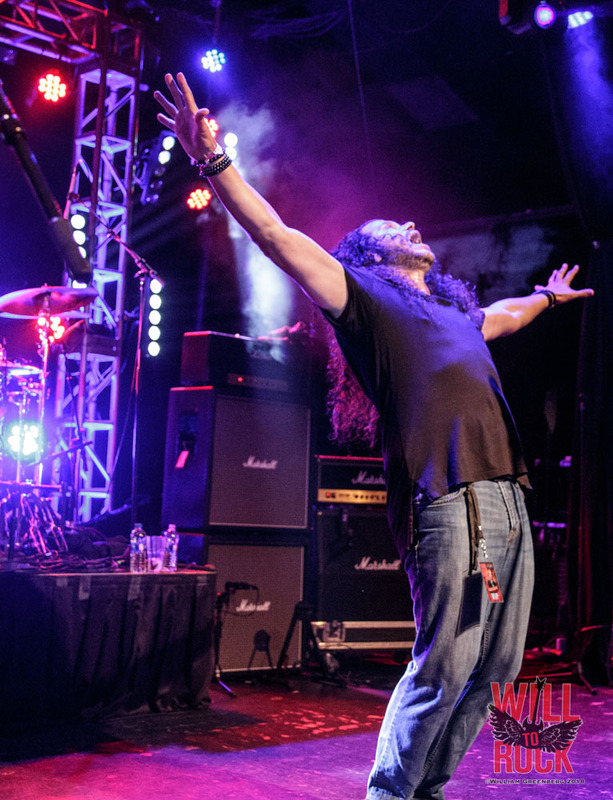 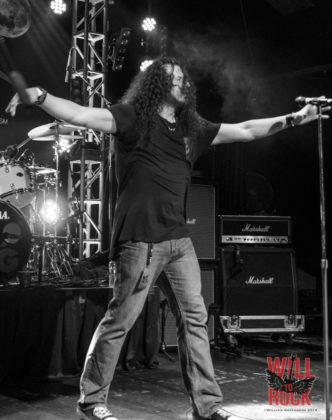 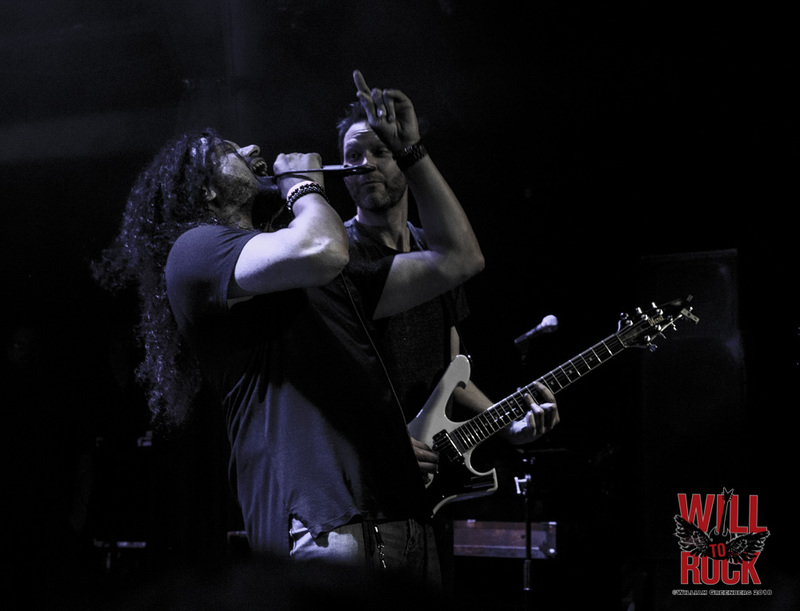 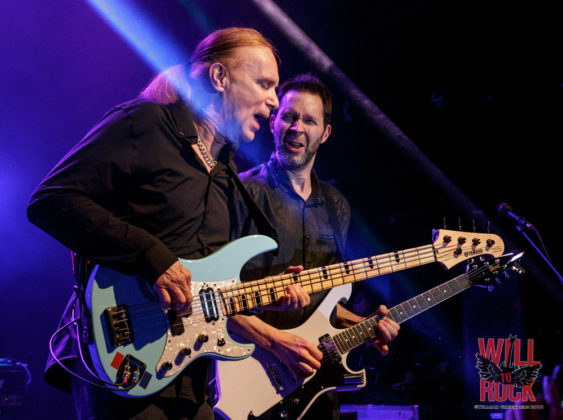 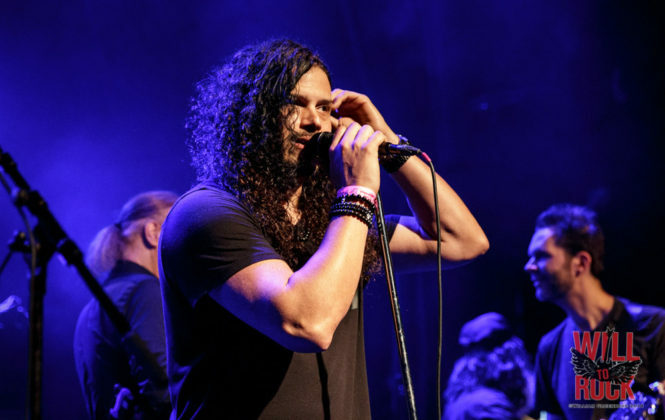 Drummer Greg Bissonette and Keyboardist, Brett Tuggle joined Billy (making up 3/5 of the David Lee Roth “Eat ‘Em And Smile” band) along with Jeff Scott Soto (Billy’s “Sons Of Apollo” bandmate) along with Paul Gilbert to crank out a couple of Van Halen tunes. 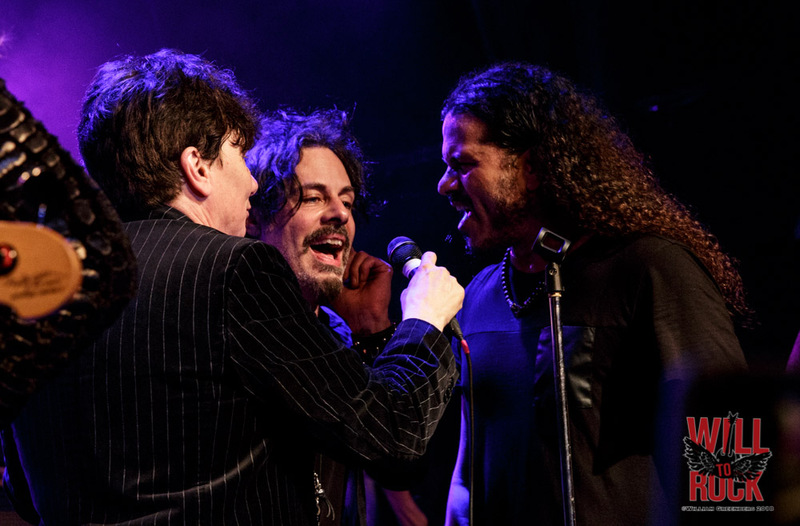 Including a vocally perfect version of “And The Cradle Will Rock” by Jeff Scott Soto that DLR wishes he could still pull off. Before the final song of the night, Eric and Billy gave thanks to everyone who showed up from around the world and gave a special shout out to Pat’s wife, Karen who was in attendance. 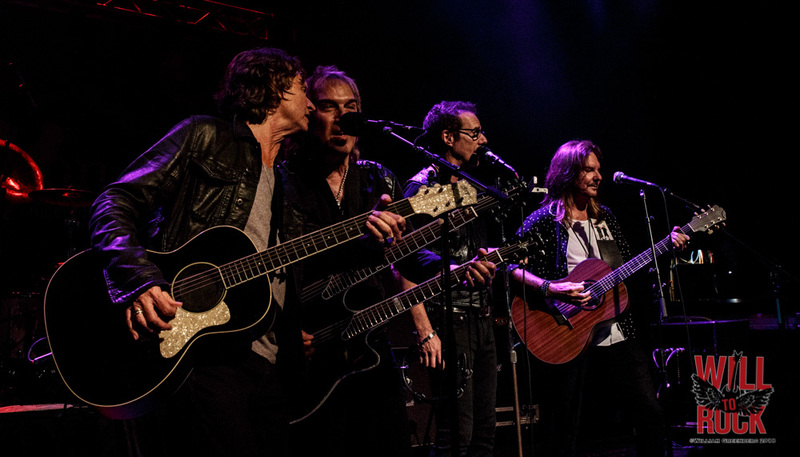 With that, all the evening’s guests came on stage for the Finale to sing and play “To Be With You“.